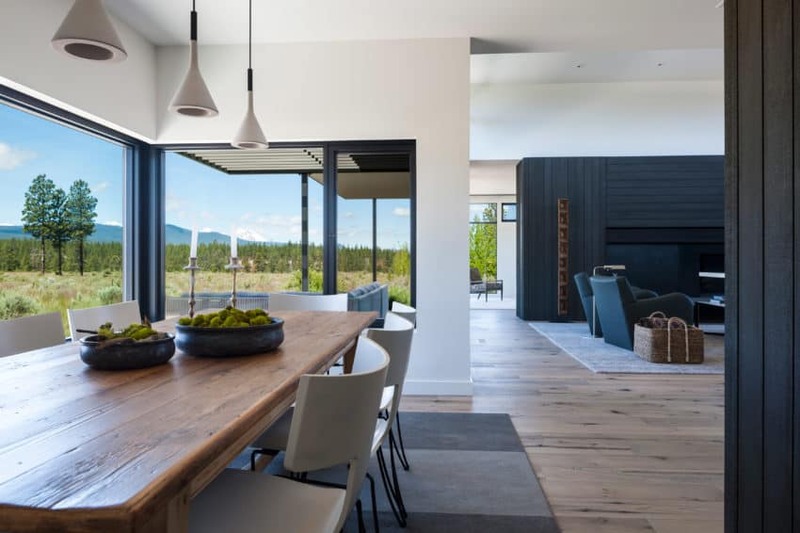 US firms DeForest Architects and NB Design Group have created a home in Bend, a small town surrounded by trails and ski slopes in the Cascade Mountains in central Oregon, USA. 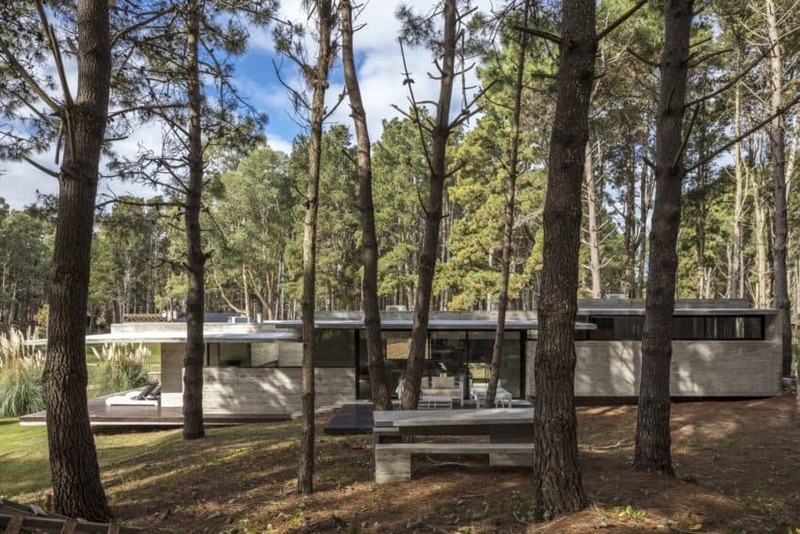 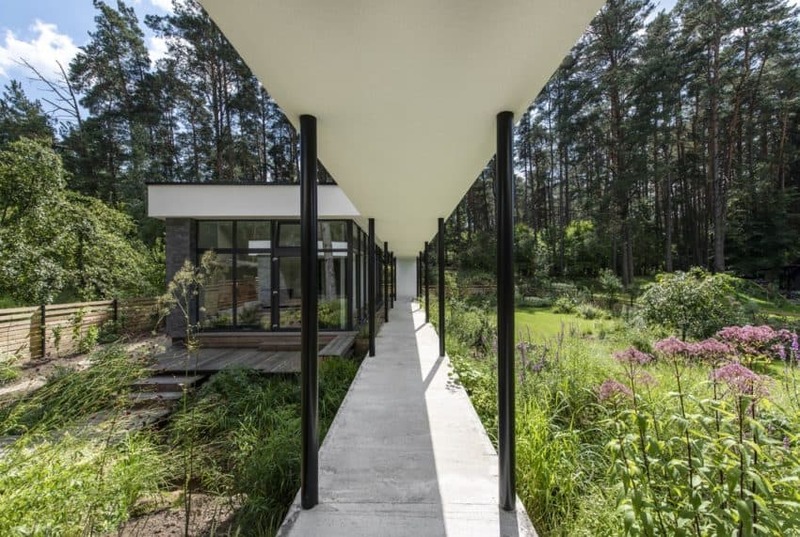 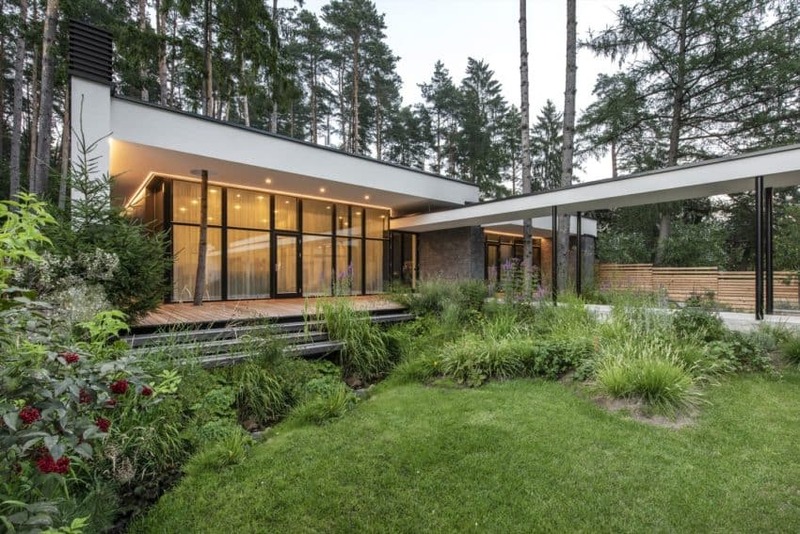 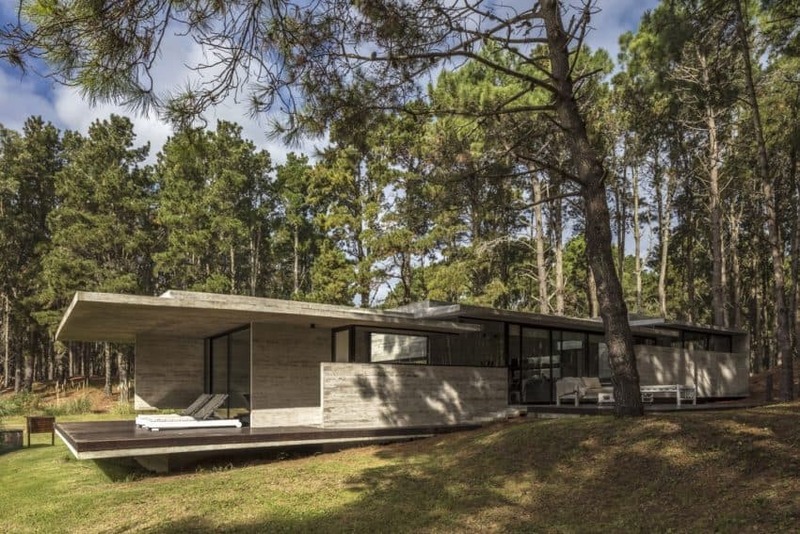 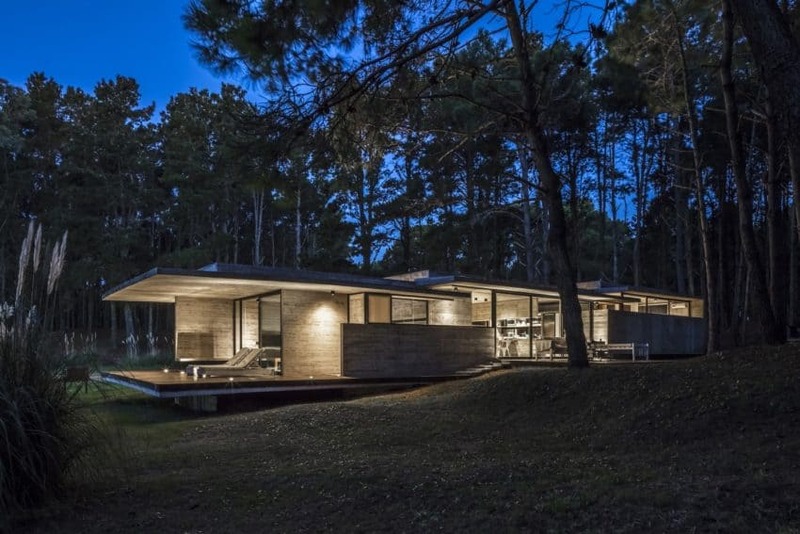 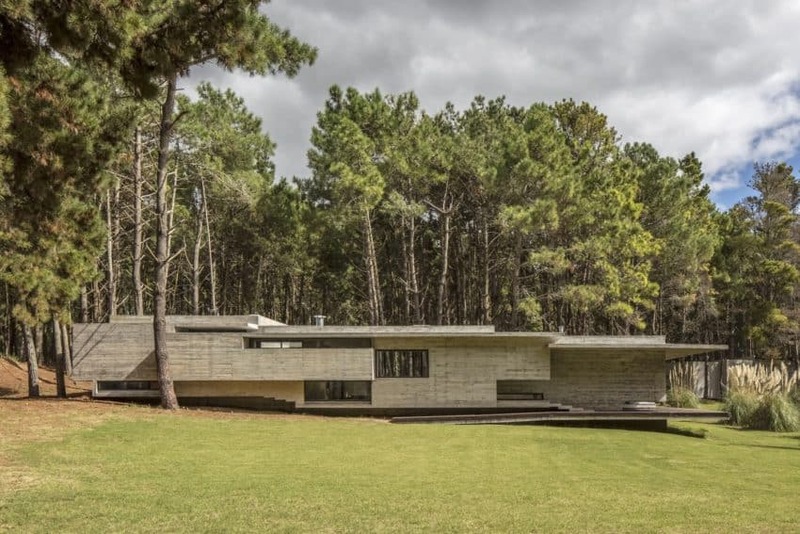 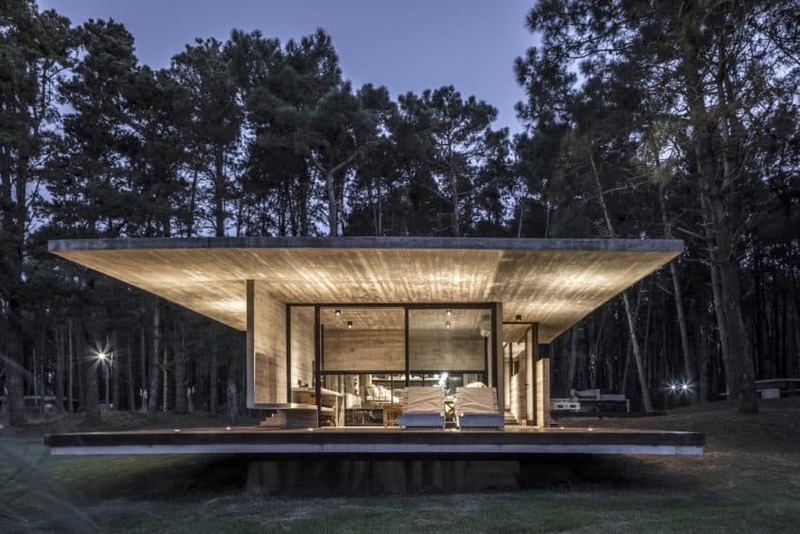 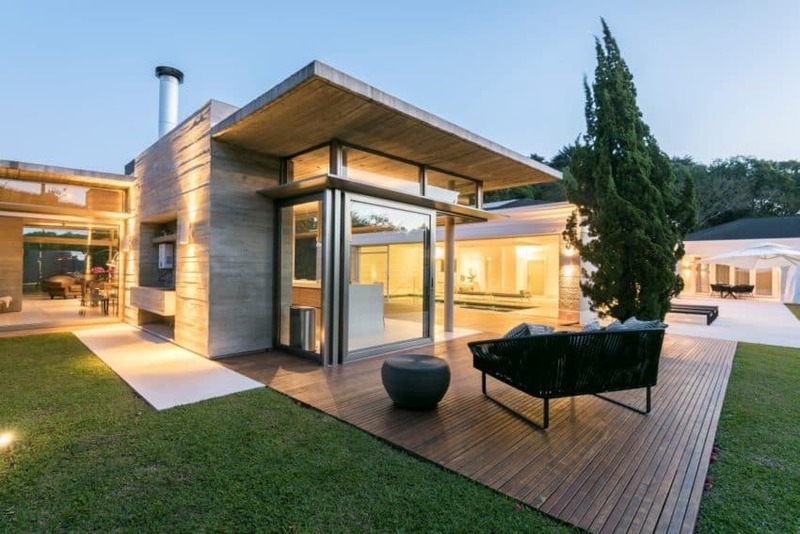 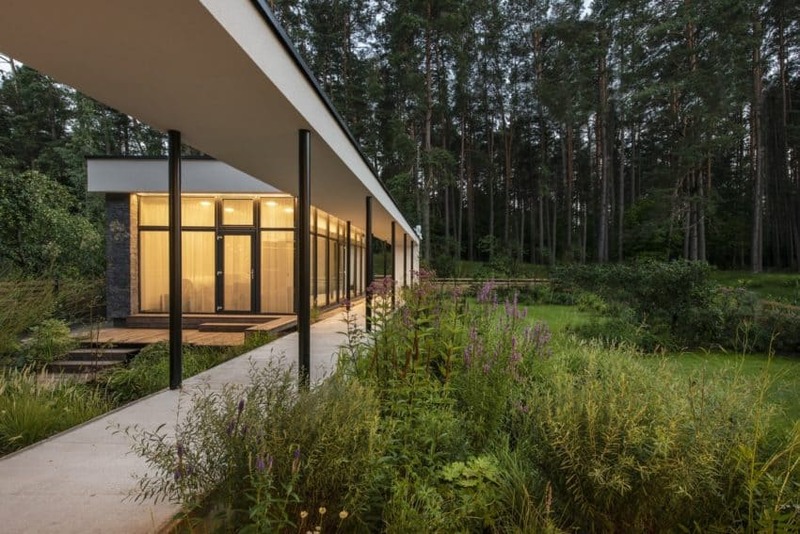 The residence is on a large plot, covered with tall grass and low shrubs, and dotted with pine trees. 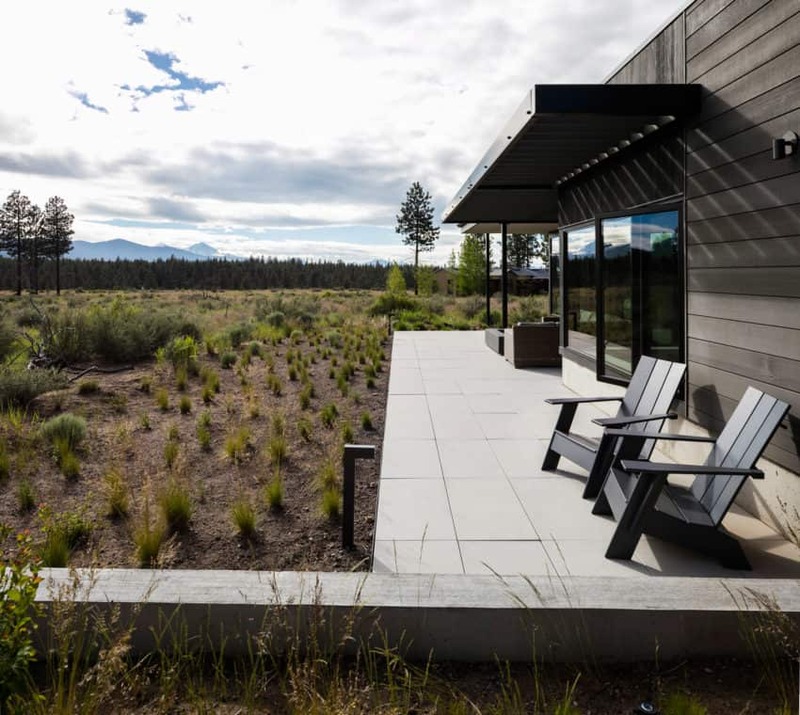 It belongs to a couple who bought the property, enchanted by its “high desert landscape, discreet local culture, fabulous food and unlimited outdoor activities.” As soon as they saw the wonderful panoramic views of the snow-capped peaks and the Deschutes River National Forest, they knew they had found their new home. 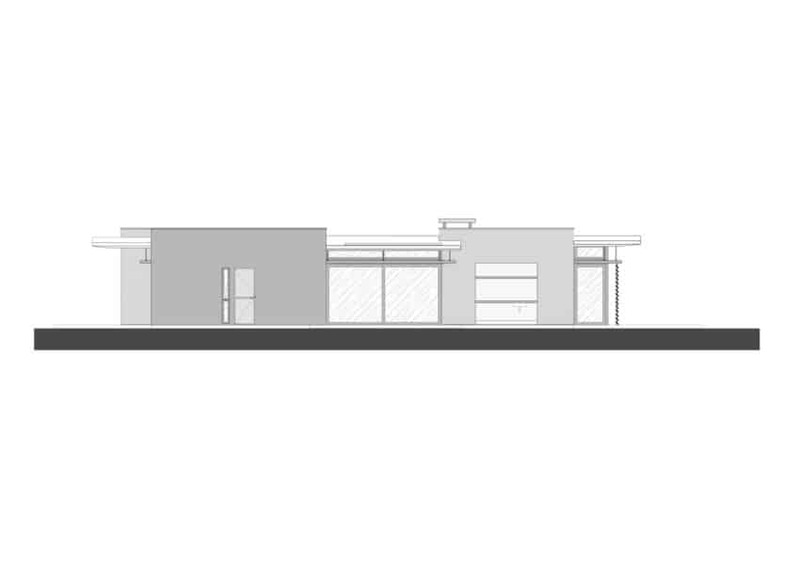 Clients had several applications for their new home, specifically covering the desert landscape and offering a high level of flexibility. 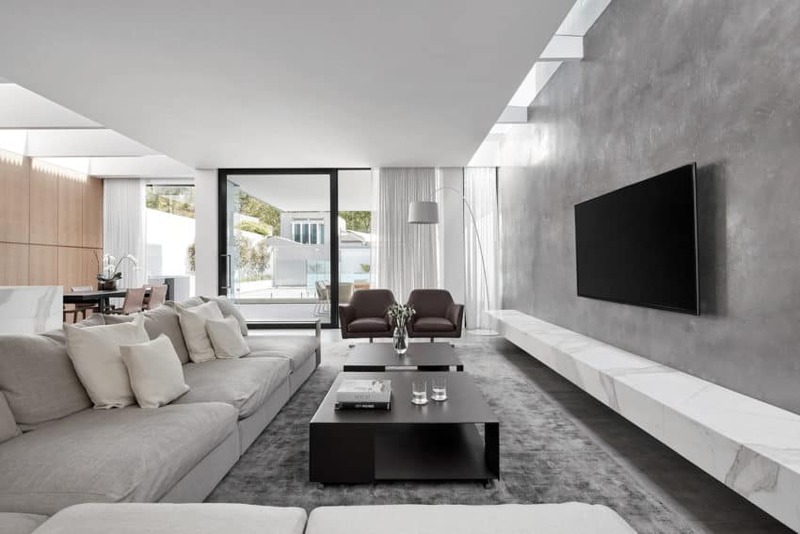 The couple also wanted the house to feel “fresh, calm and collected. 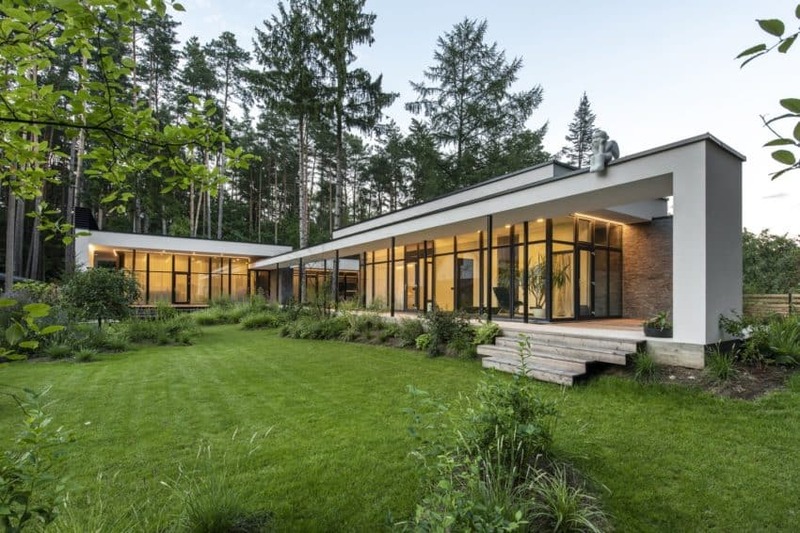 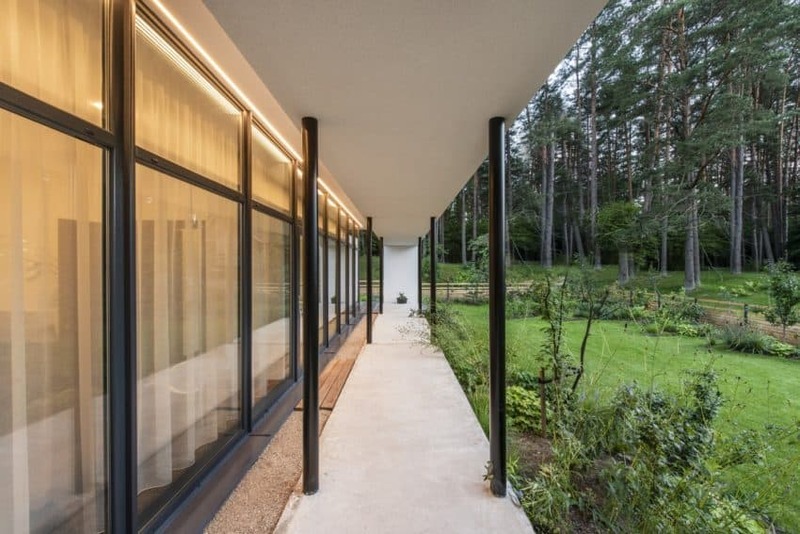 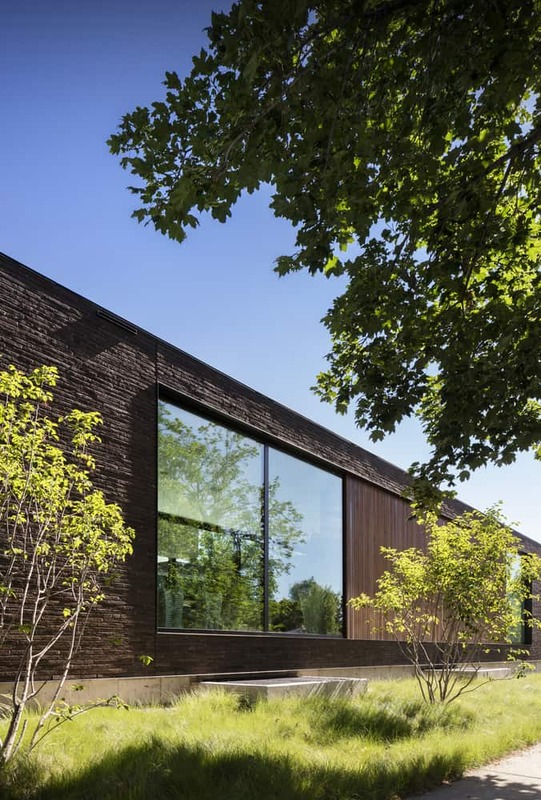 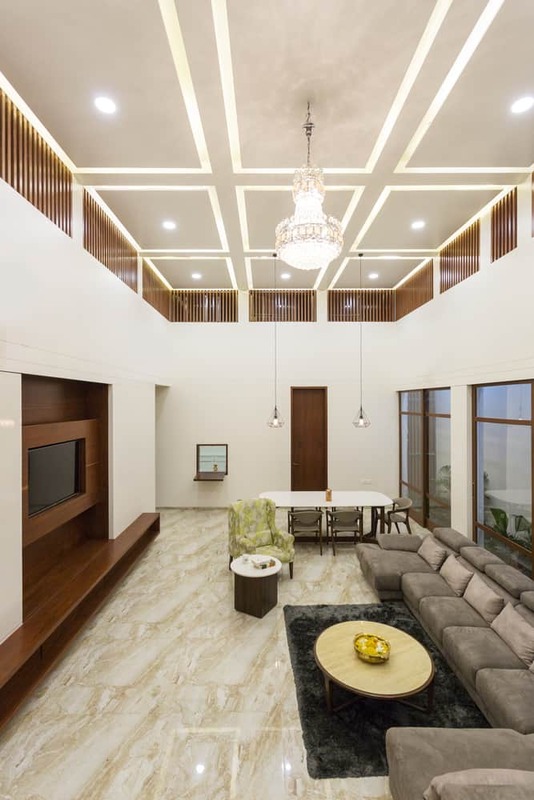 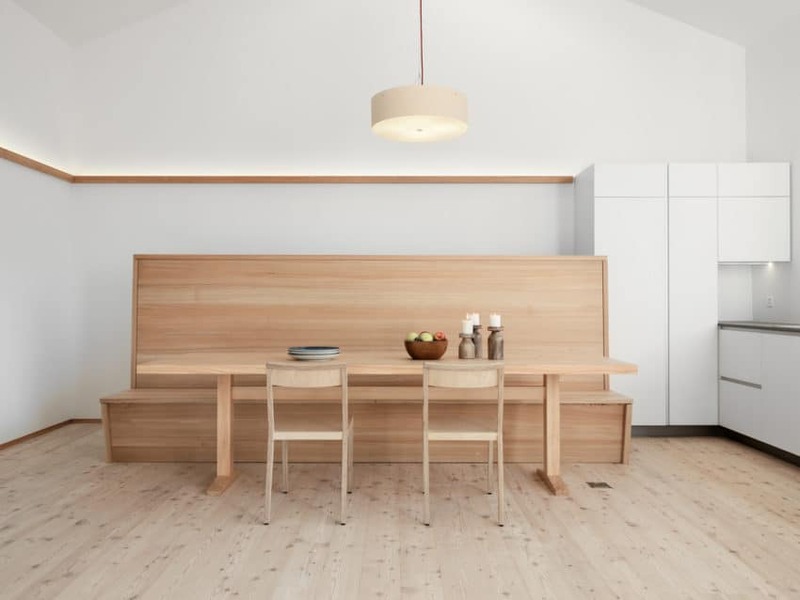 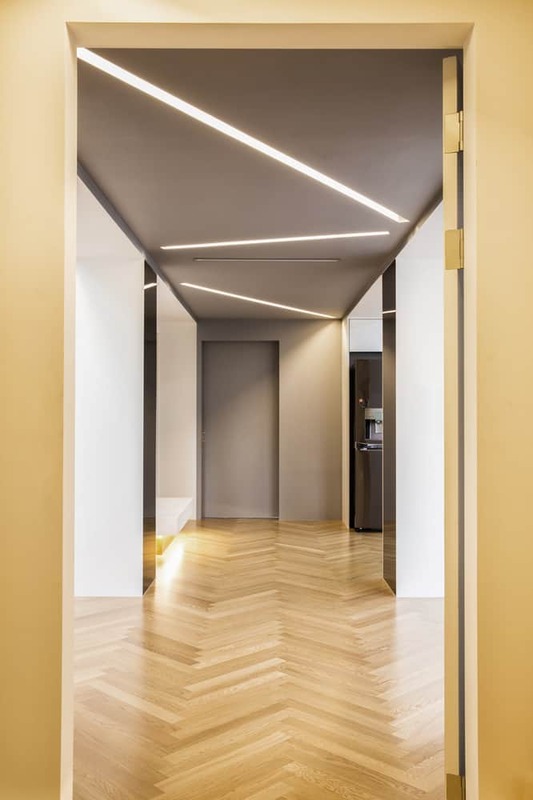 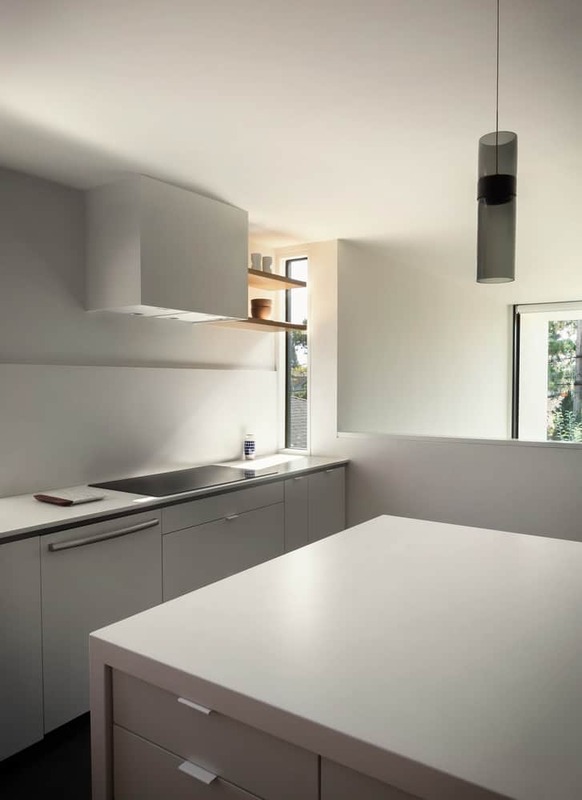 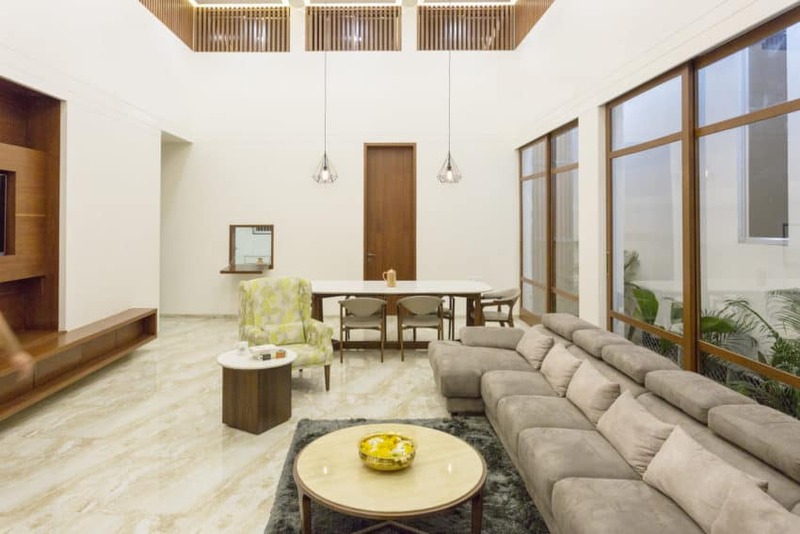 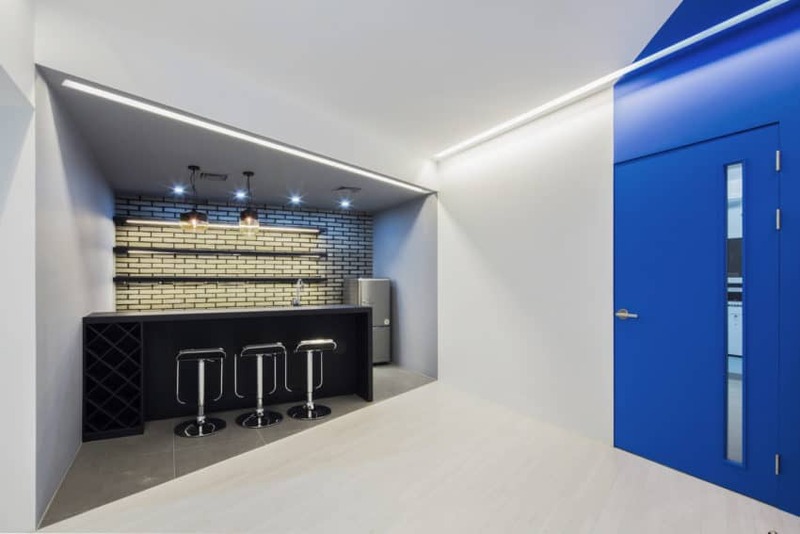 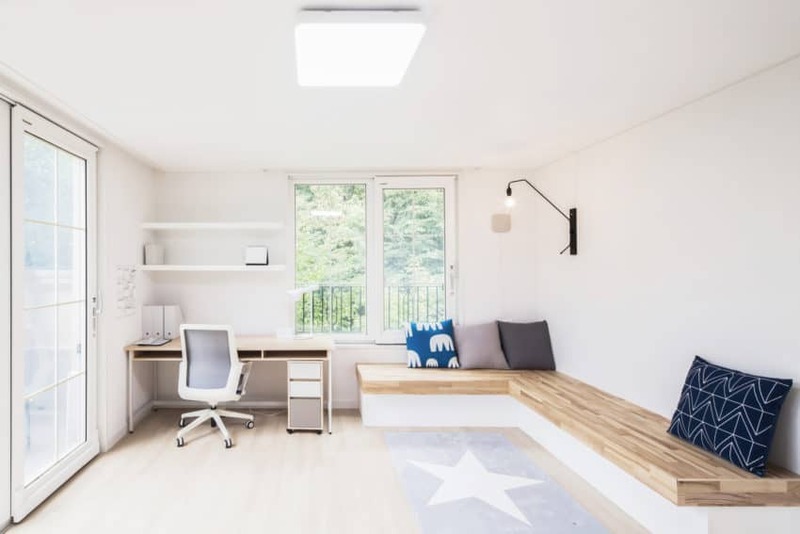 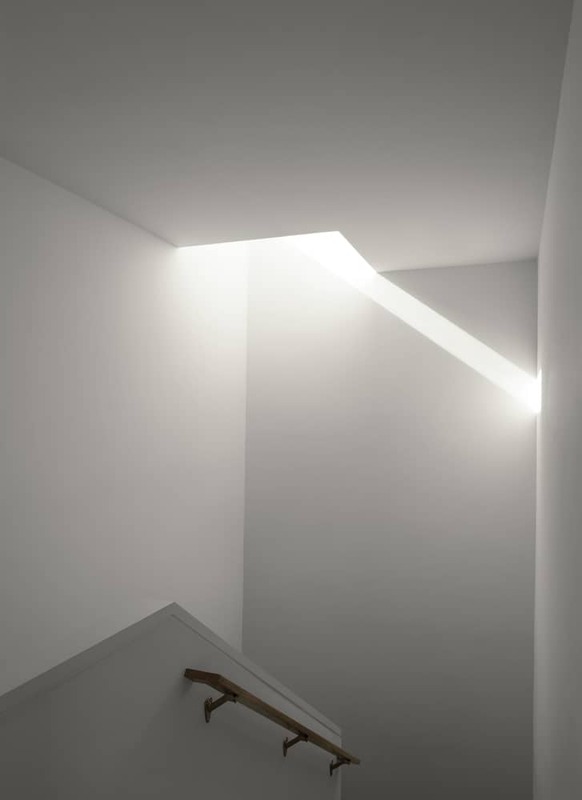 In response, the company conceived a residence that has an approximate L-shaped design that is composed of rooms with clean lines and abundant natural light. 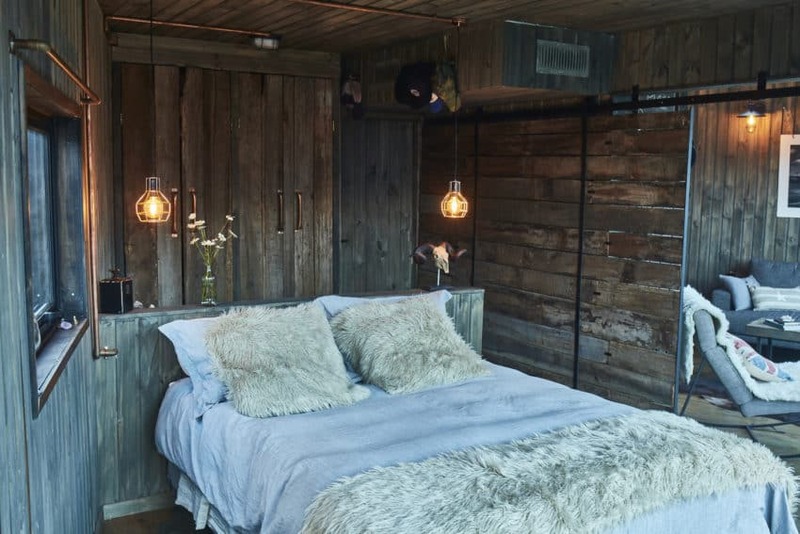 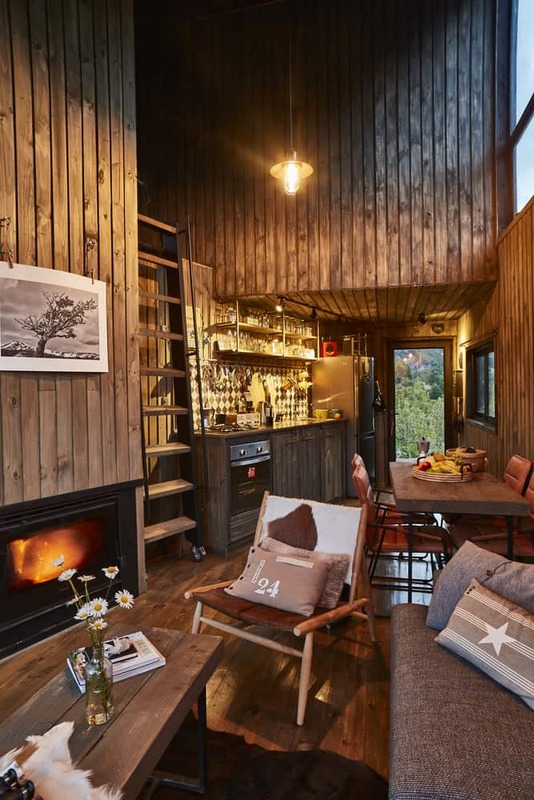 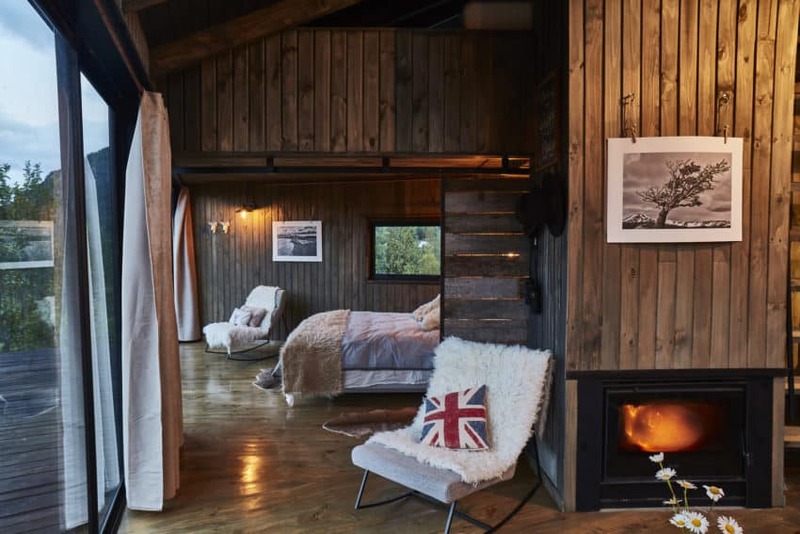 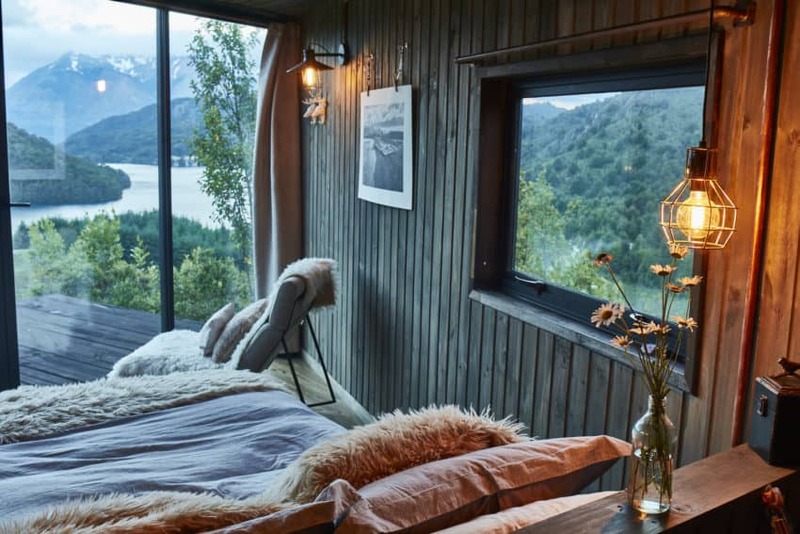 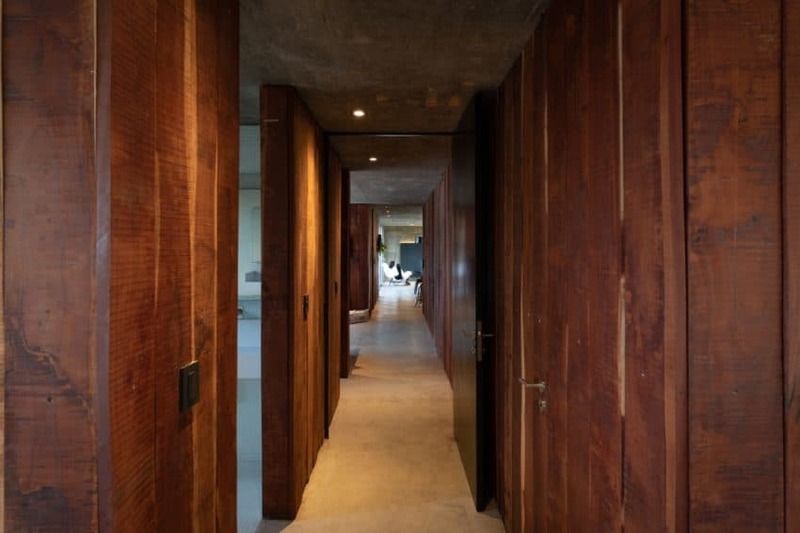 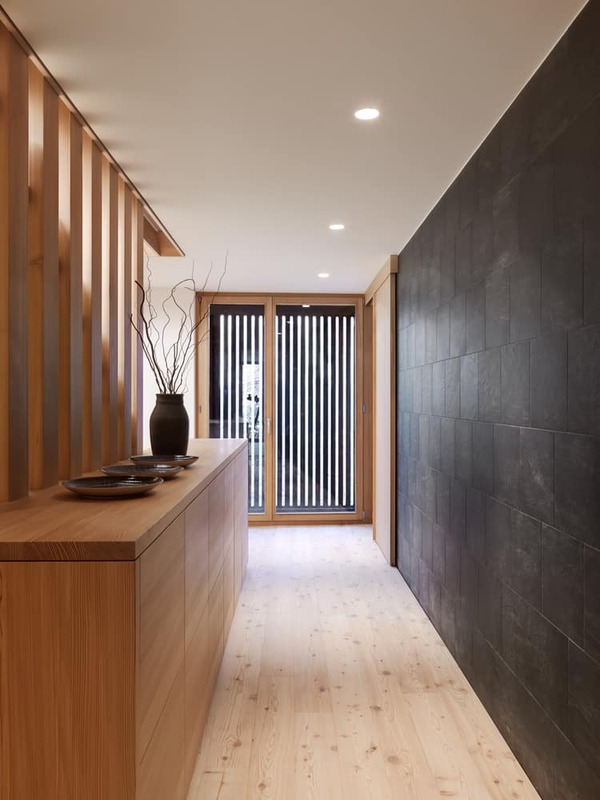 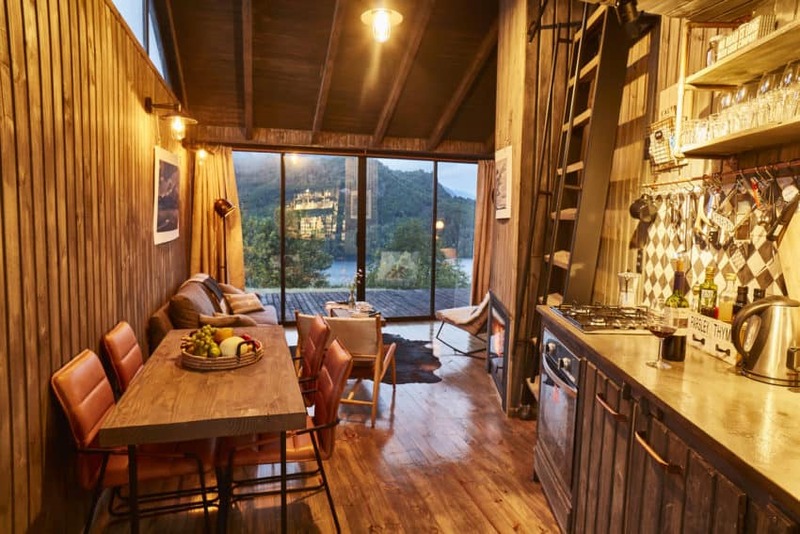 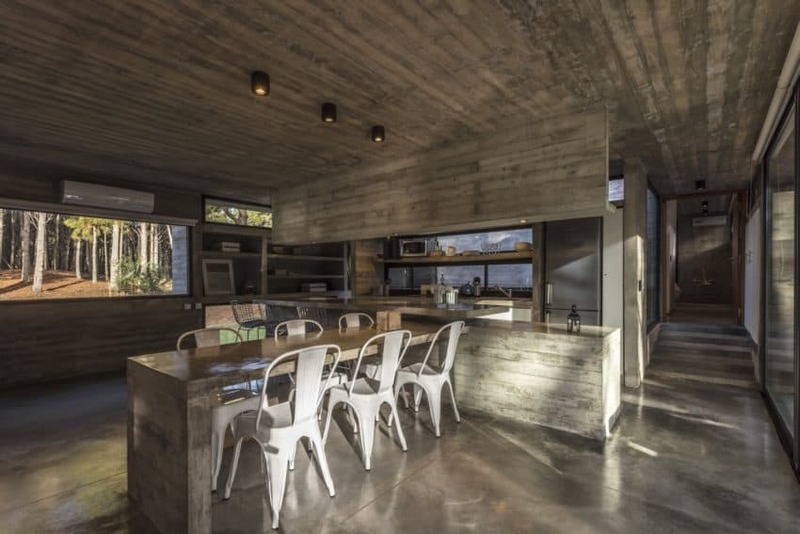 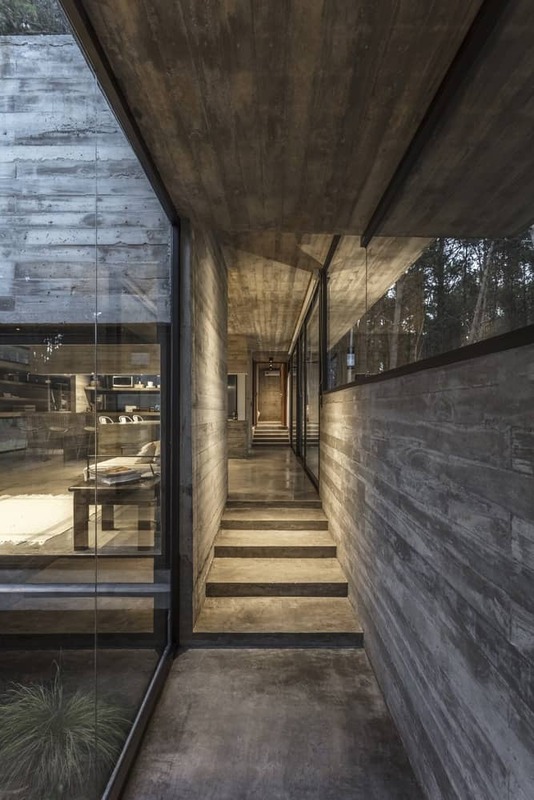 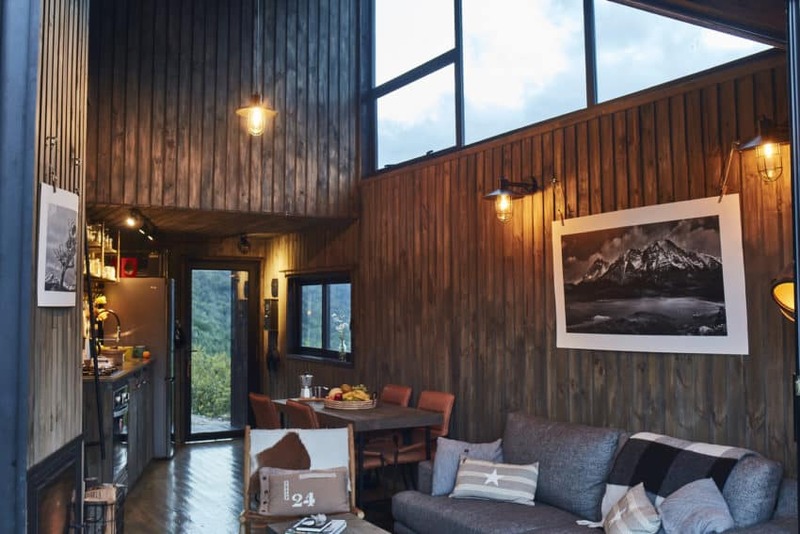 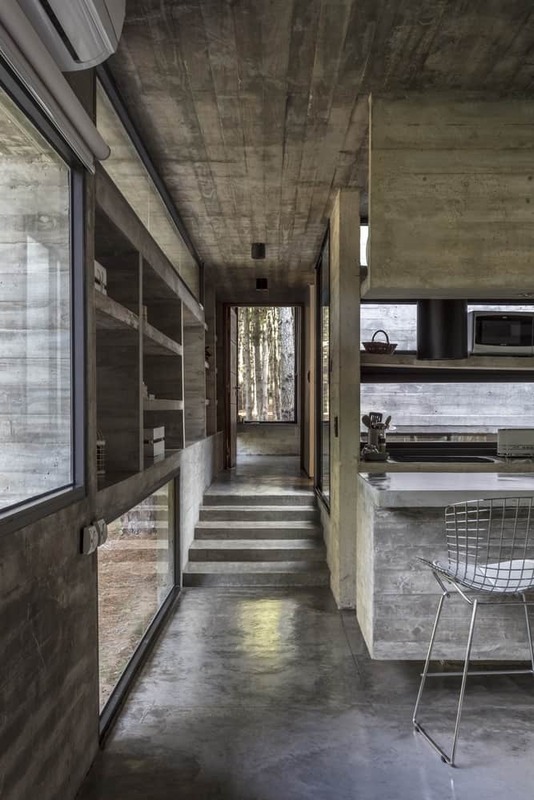 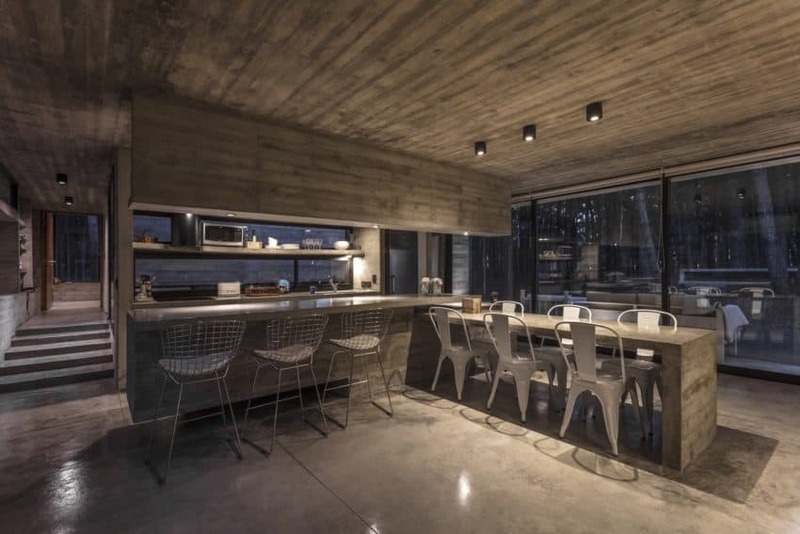 Covering 3,320 square feet (308 square meters), the single-story dwelling has exterior walls lined with horizontal cedar planks, which helps merge with the natural environment. 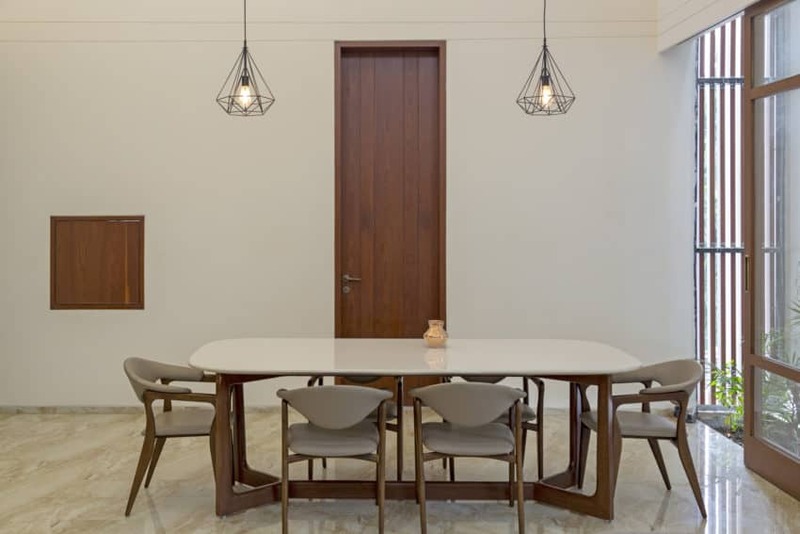 It has sliding and rotating panels that allow spaces to expand and contract as needed for owners, a few guests or a large meeting. 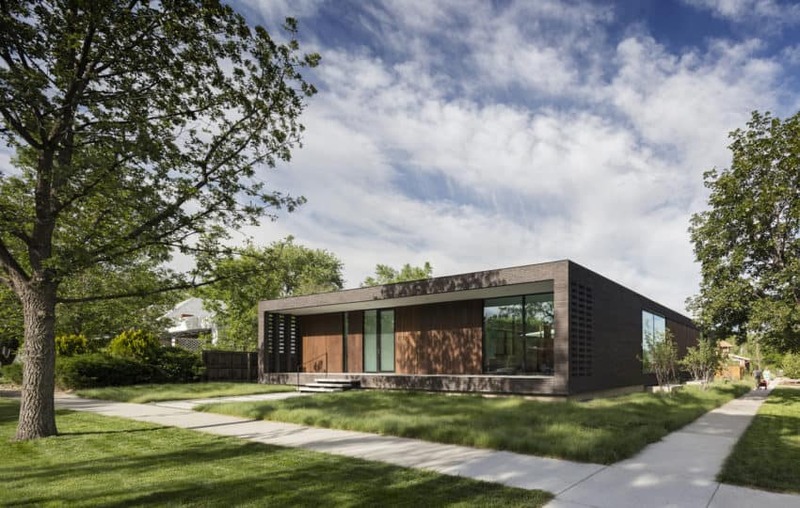 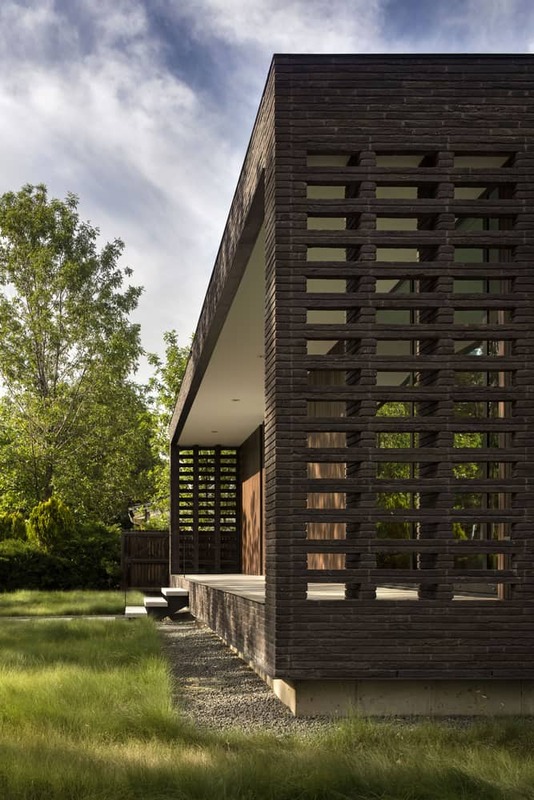 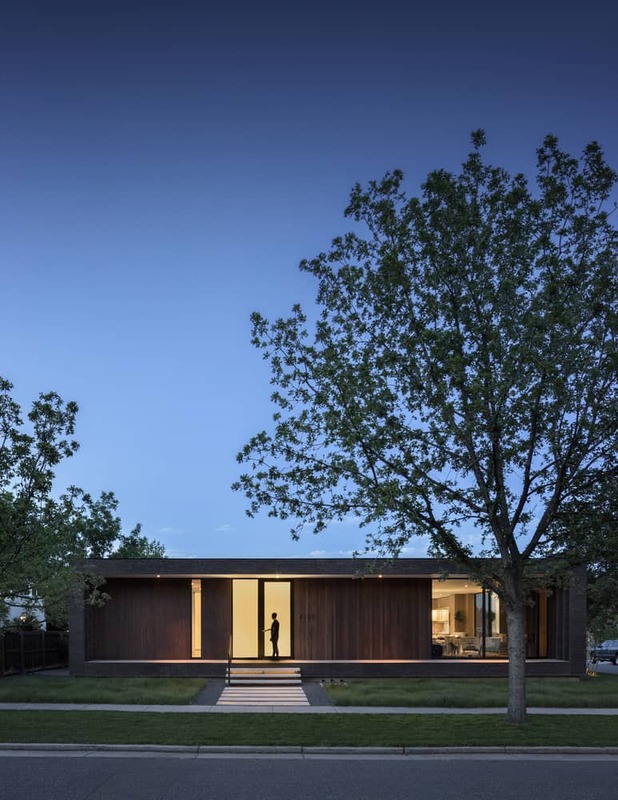 This project is located in an old neighborhood of the city of Denver in Colorado, United States. 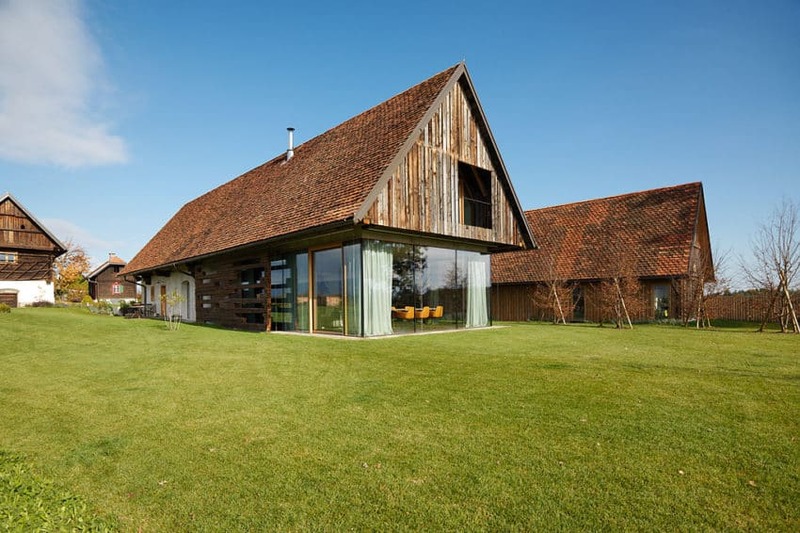 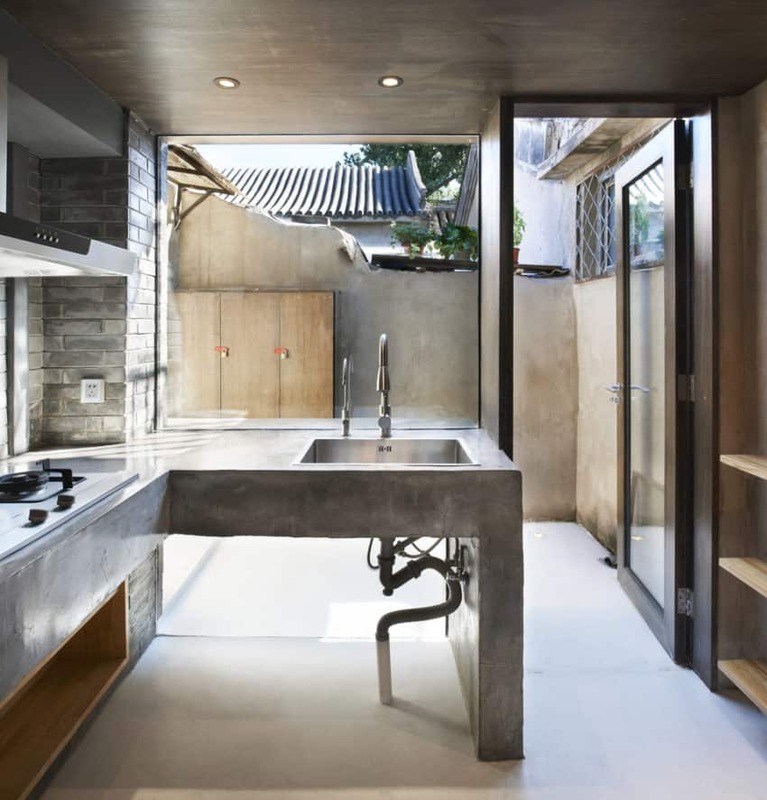 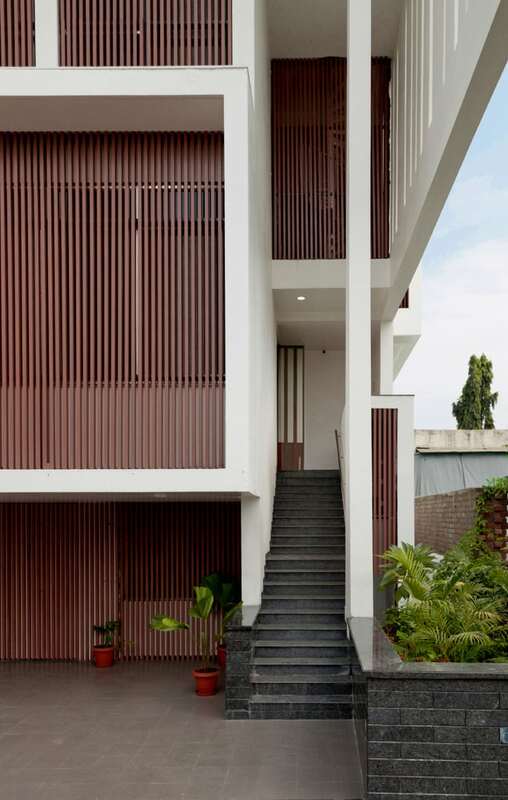 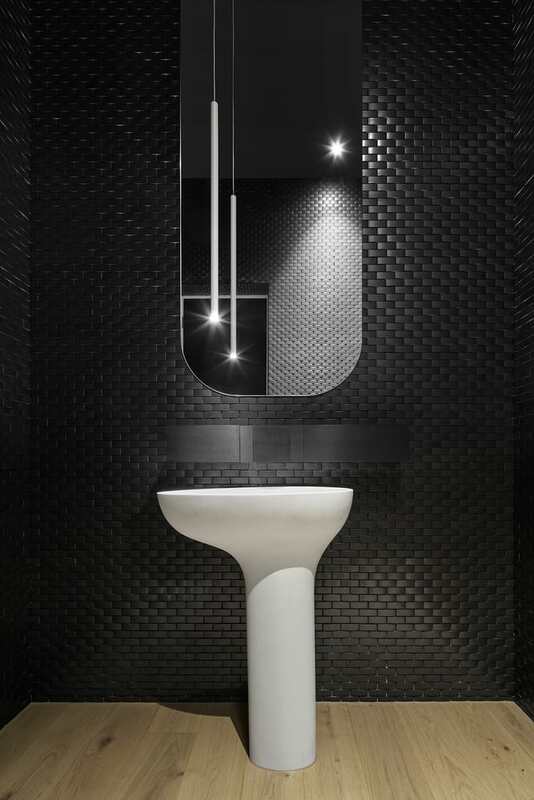 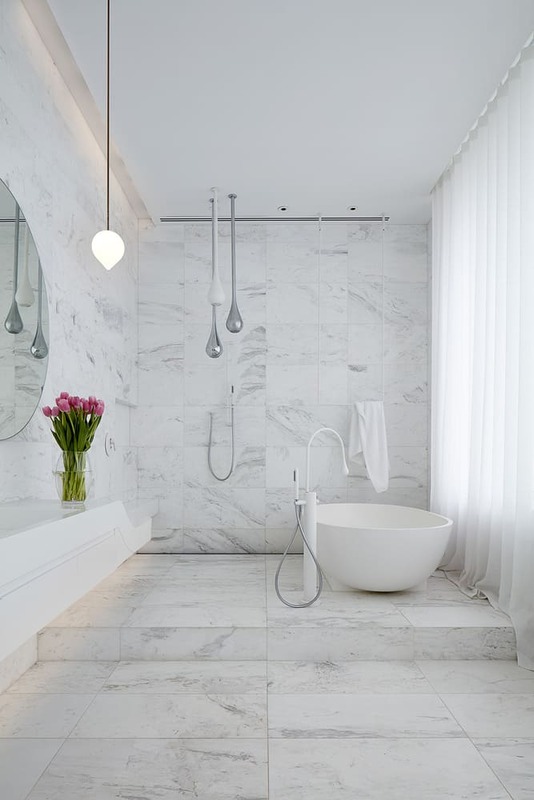 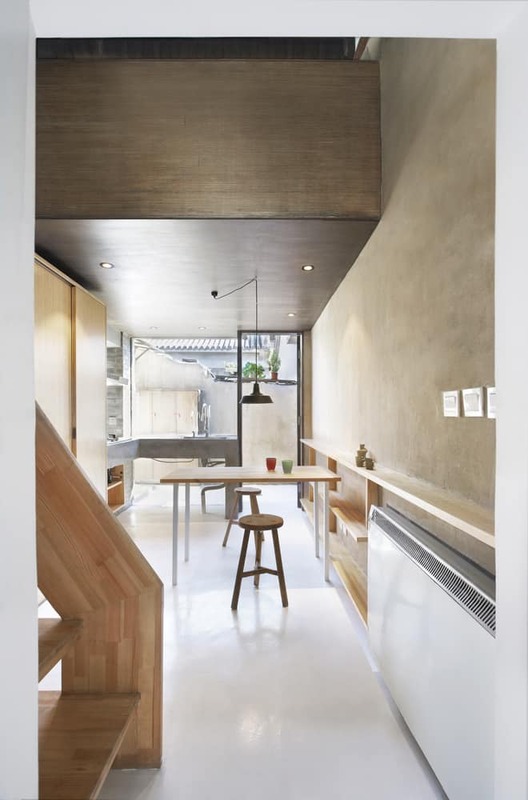 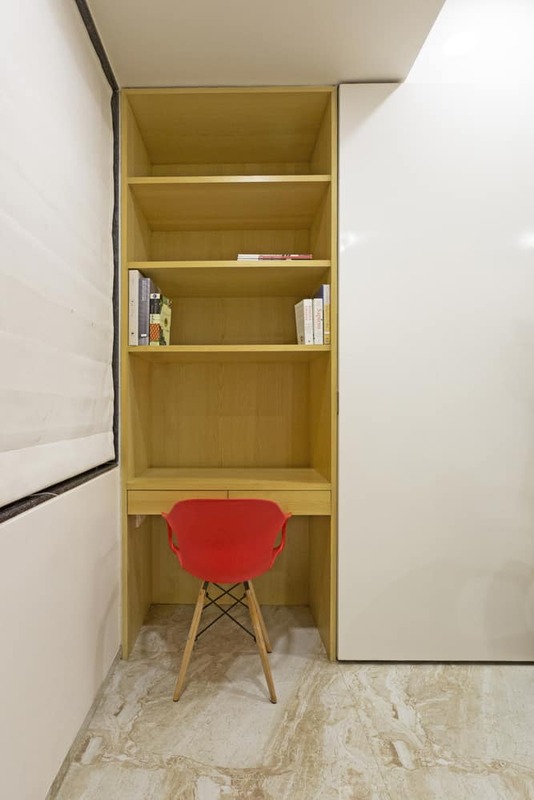 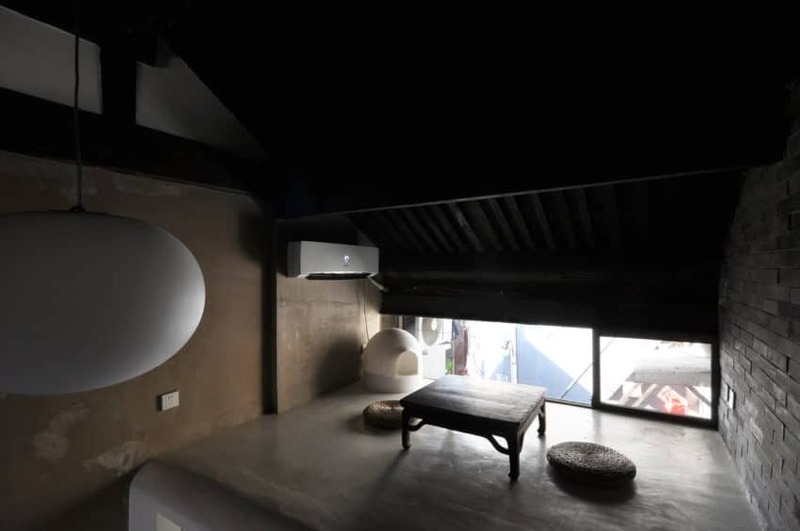 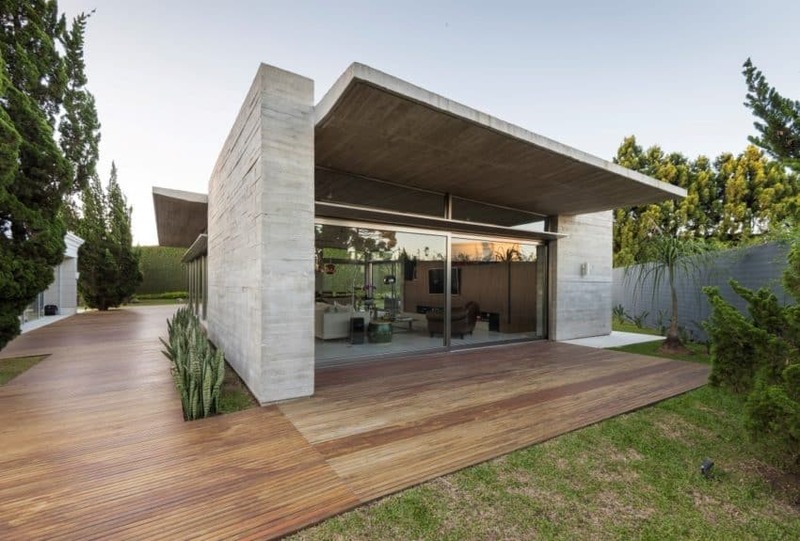 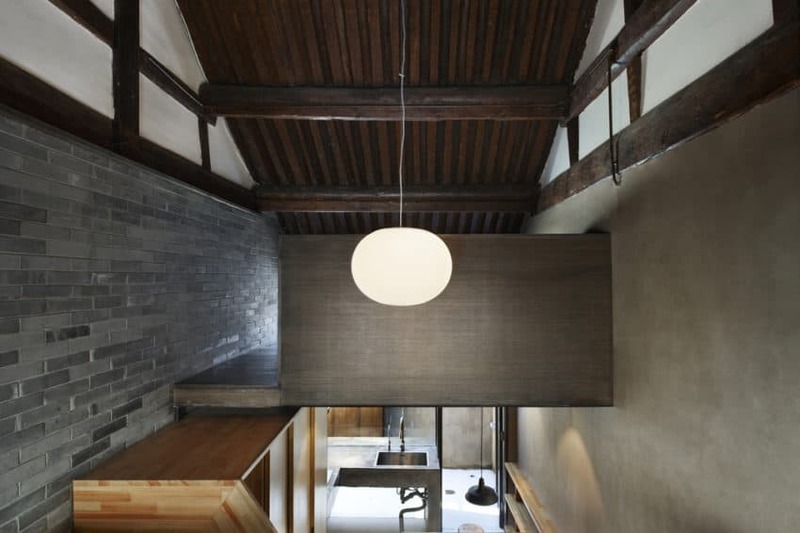 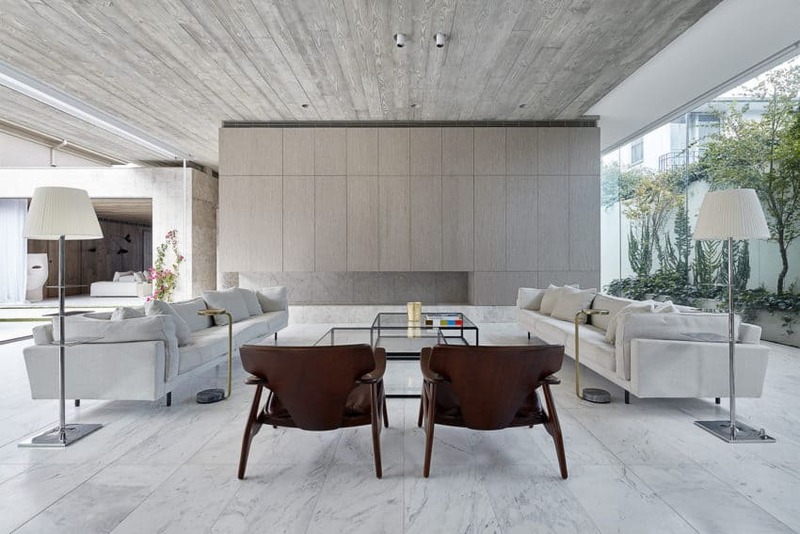 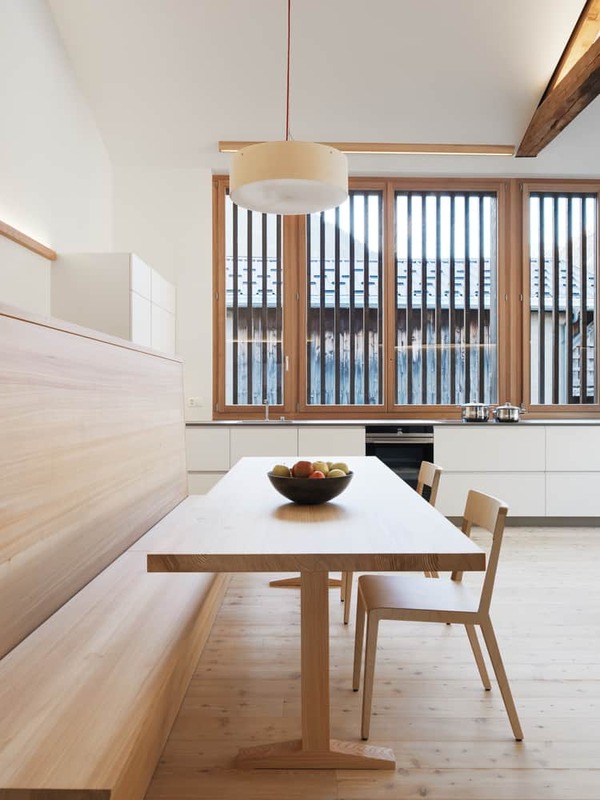 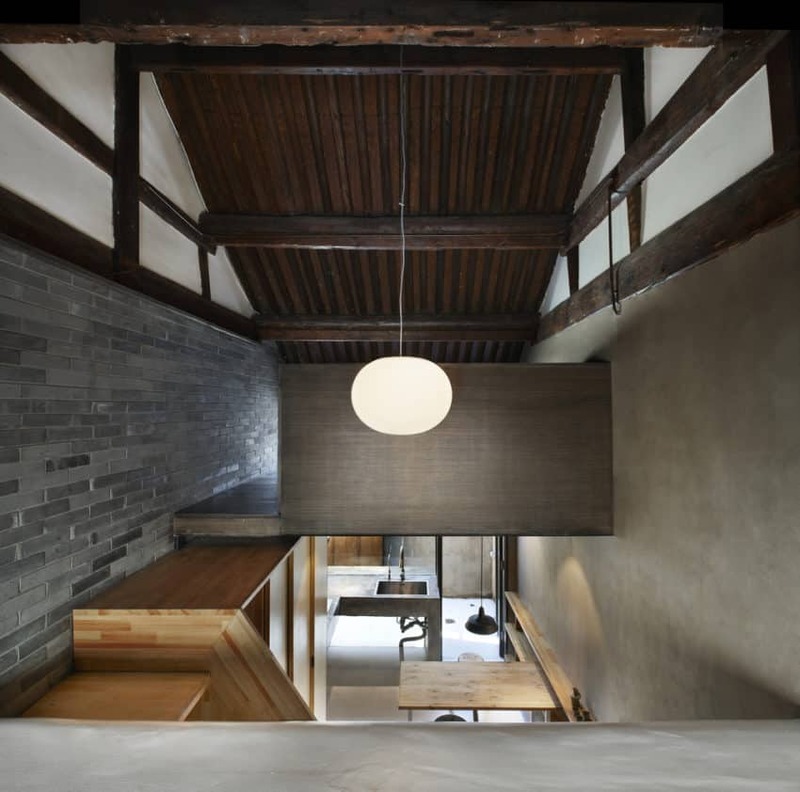 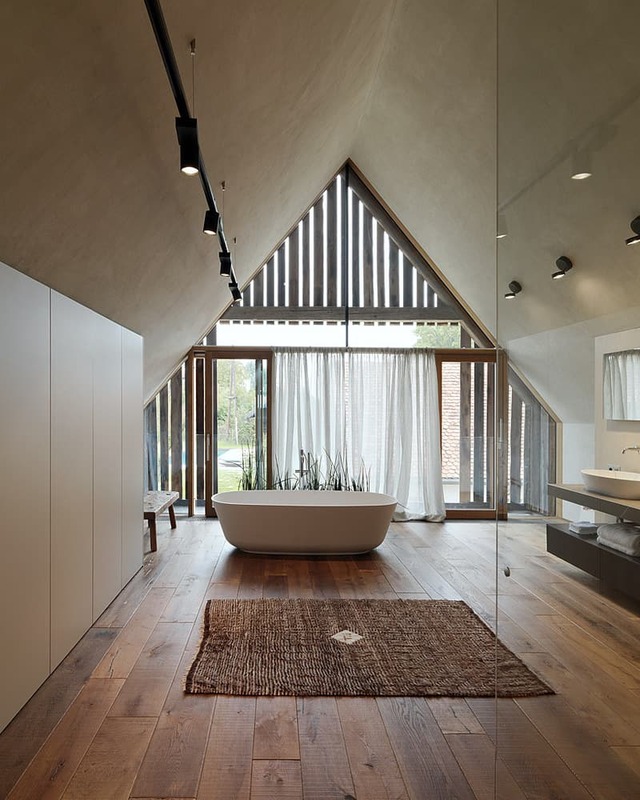 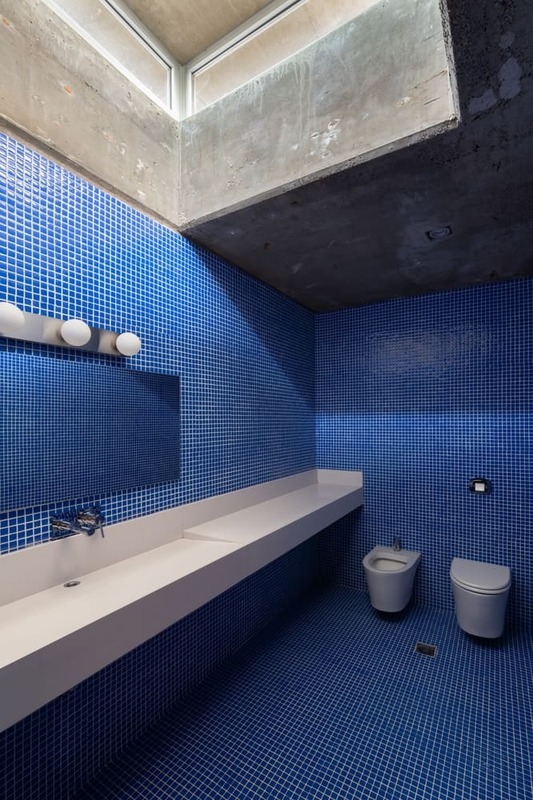 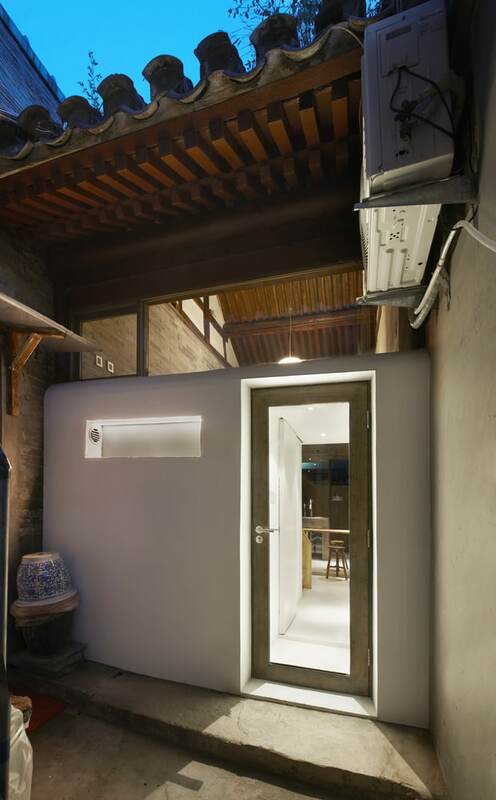 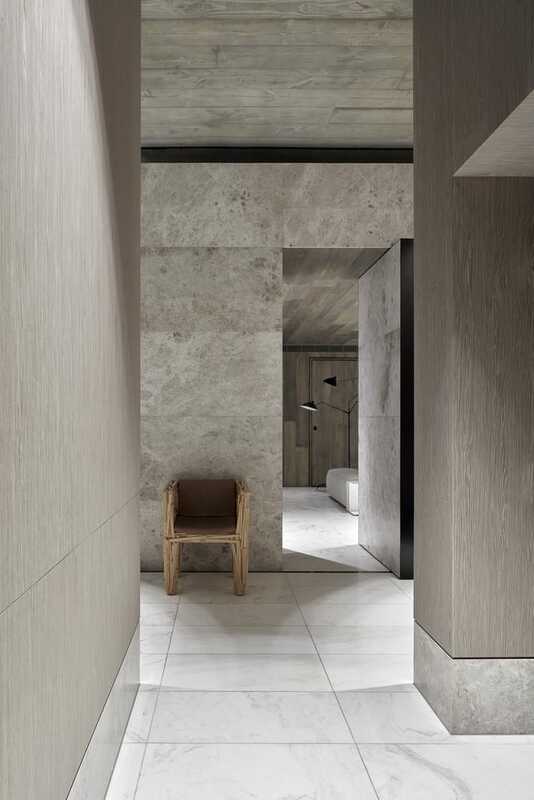 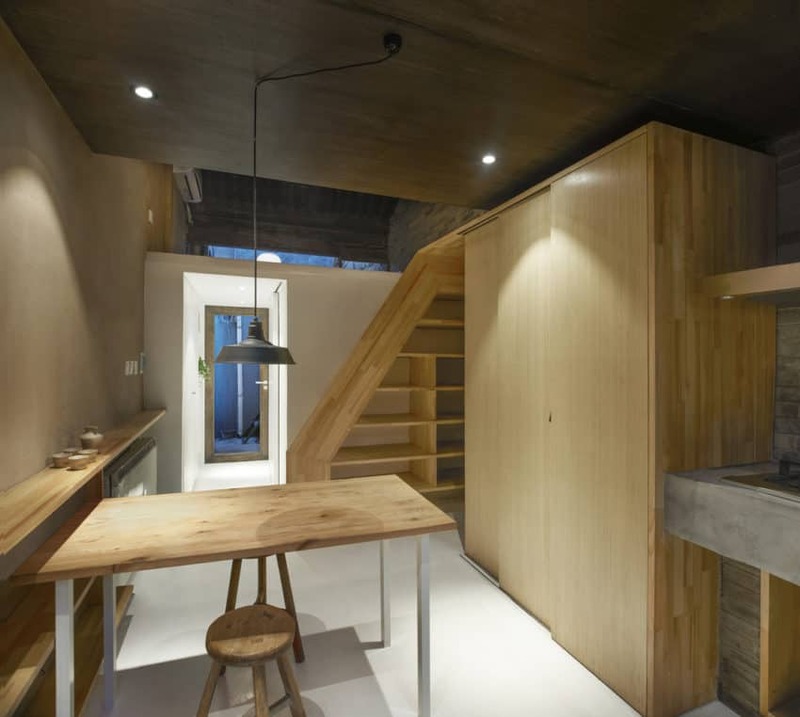 It was designed by the architecture and interior firm Studio B Architecture + Interiors. 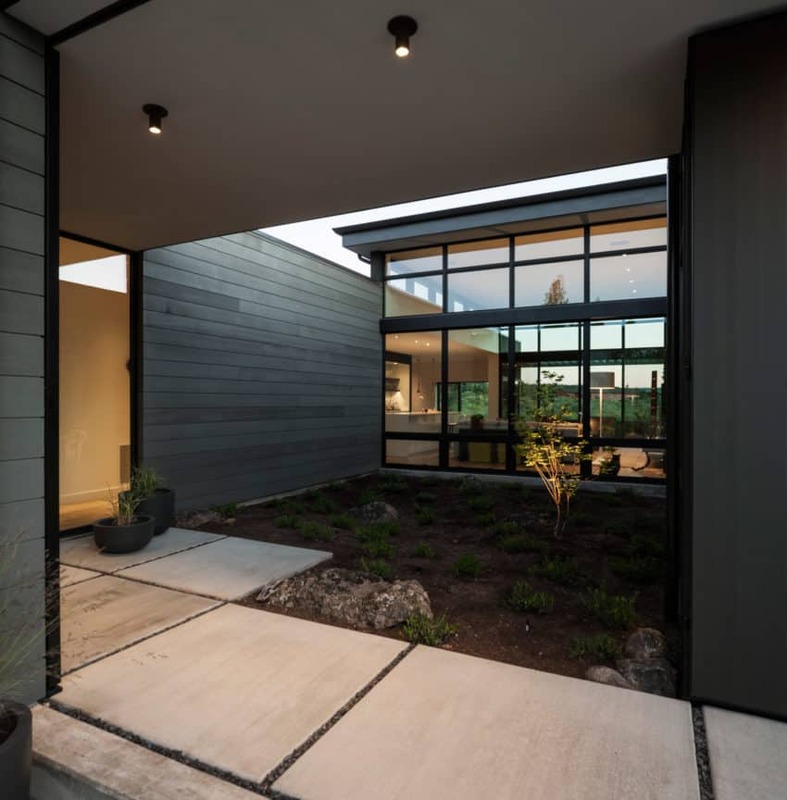 Undergone in 2016, this project was mainly led by its architecural professionals Mike Piche, Joey Pruett, Scott Lindenau and Susan Okie Lindenau, and occupies a total area of 4600 square feet. 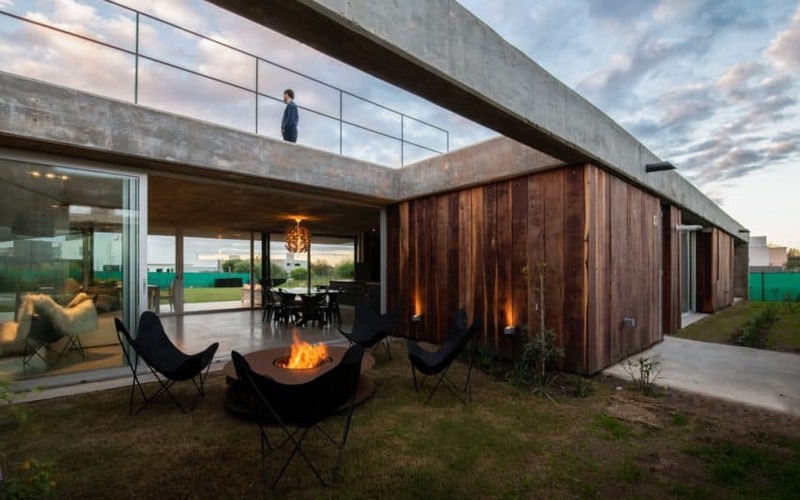 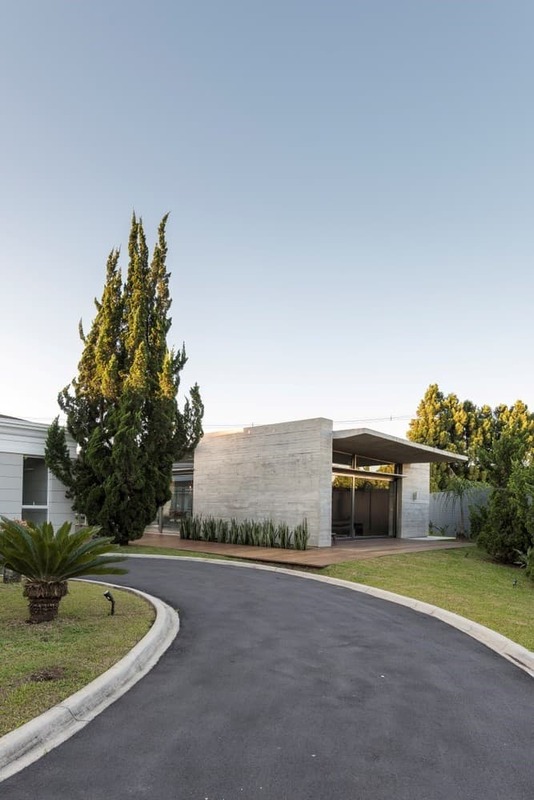 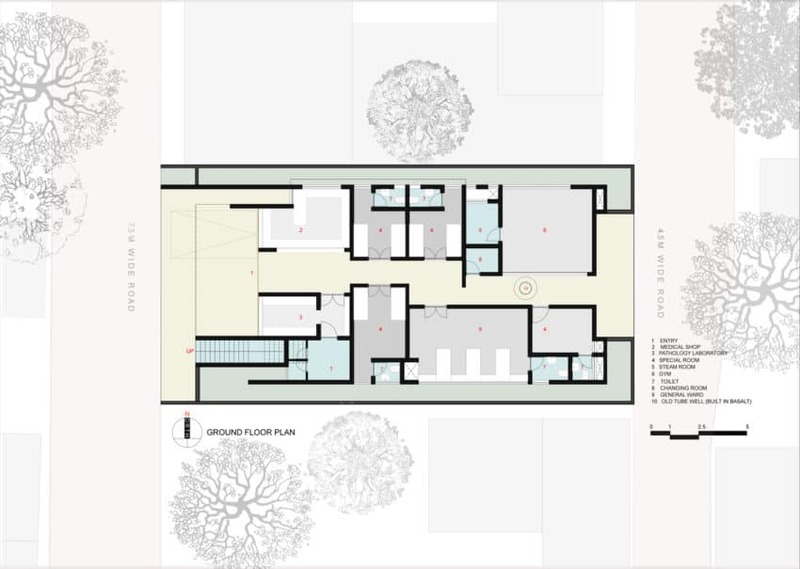 The residence consists mainly of brick walls on a small scale with a large entrance porch, in which the structure is organized around the interior space of the patio. 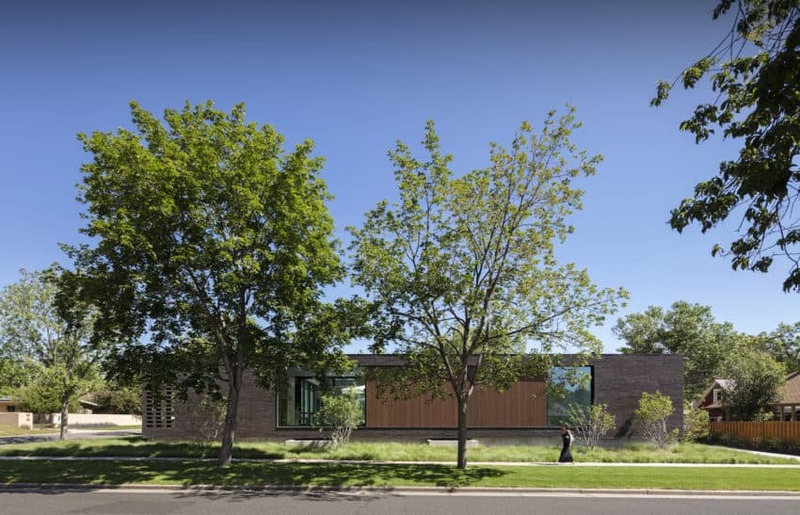 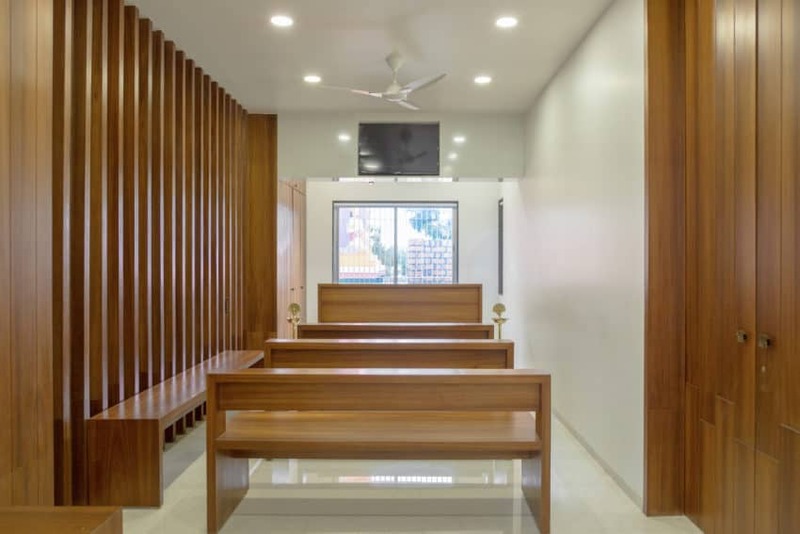 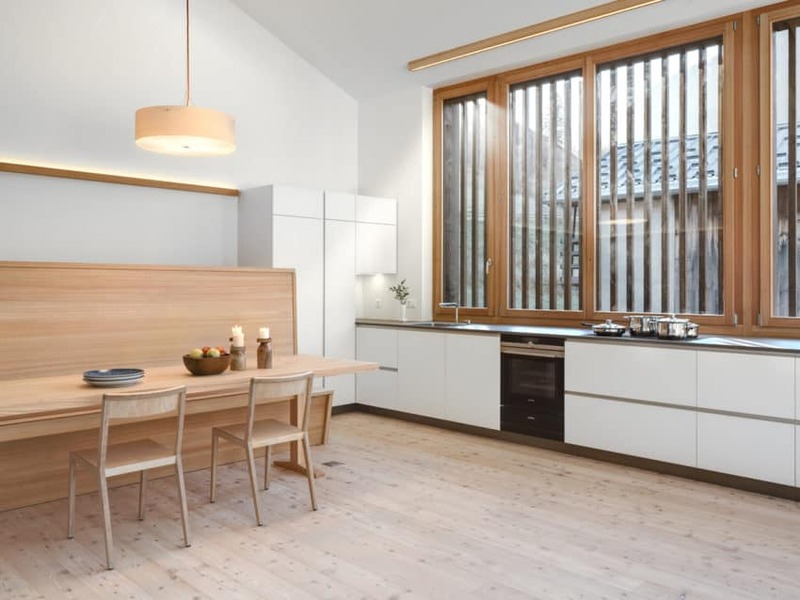 In opposition to many of the newer large-scale and complex projects being built with generic construction materials in a nearby neighborhood, this project is a piece of smaller architecture, with a low profile. 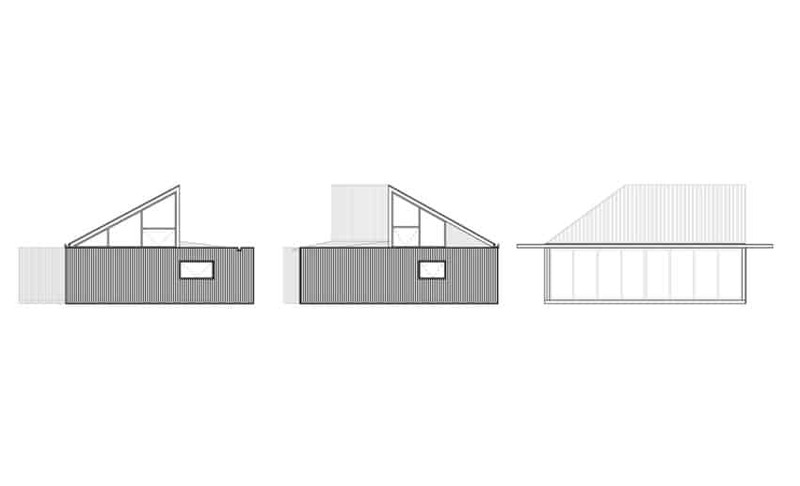 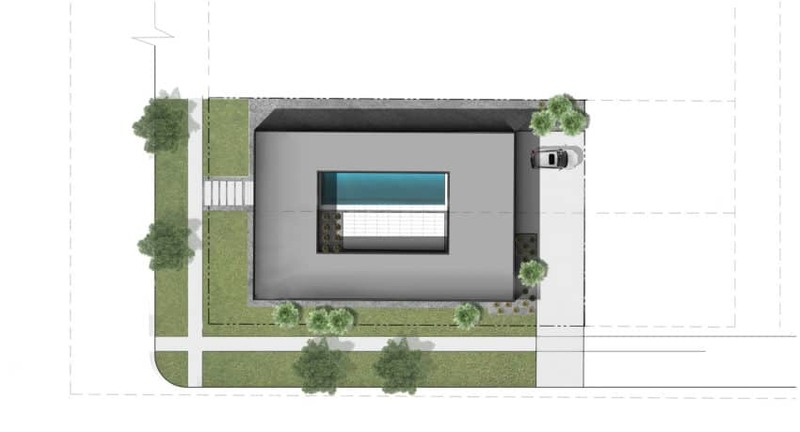 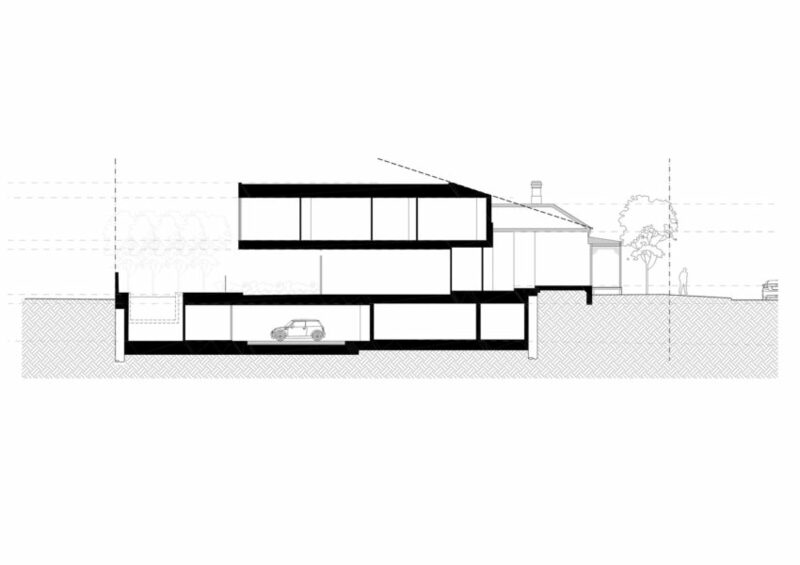 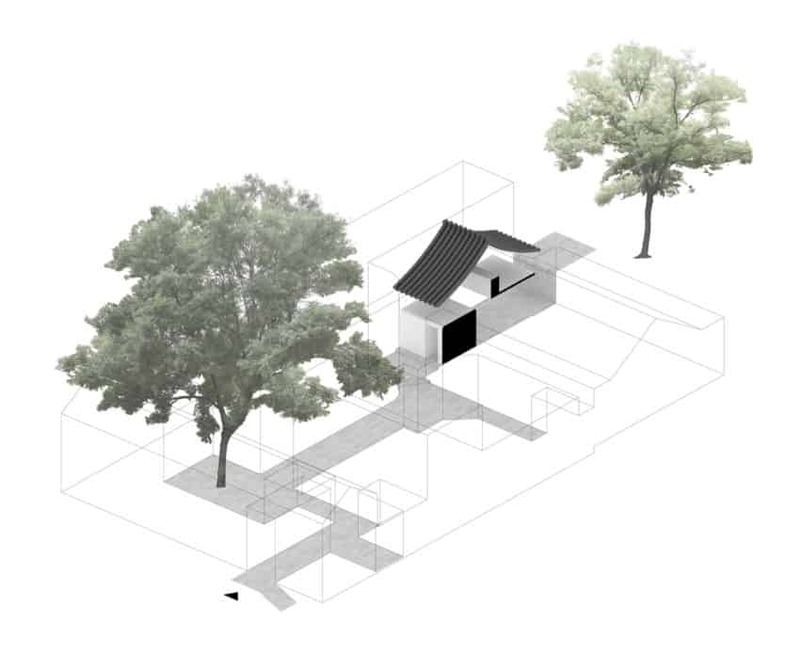 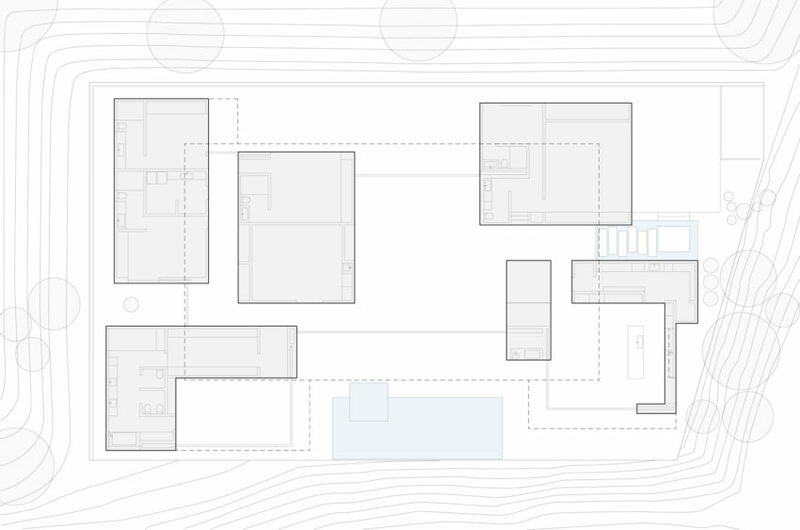 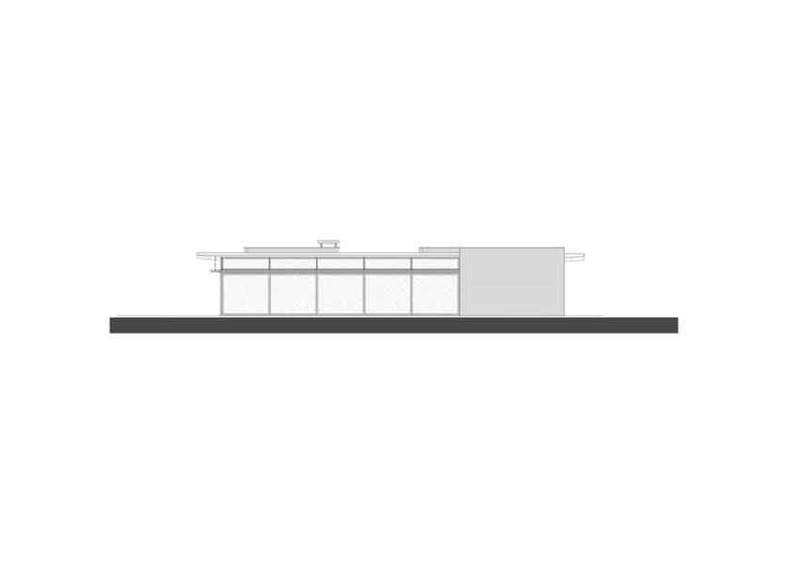 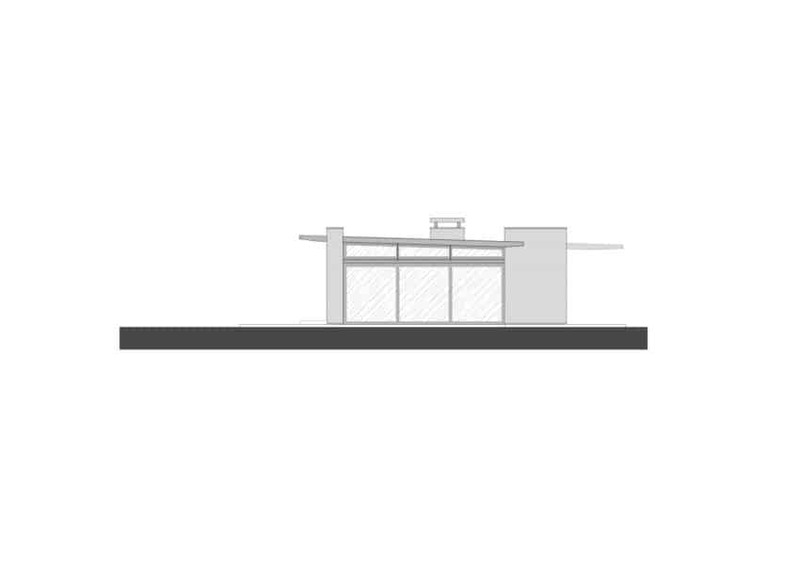 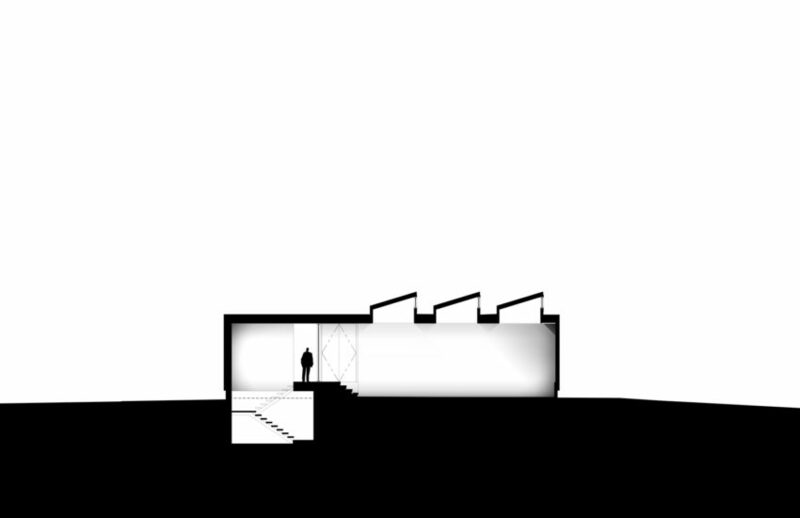 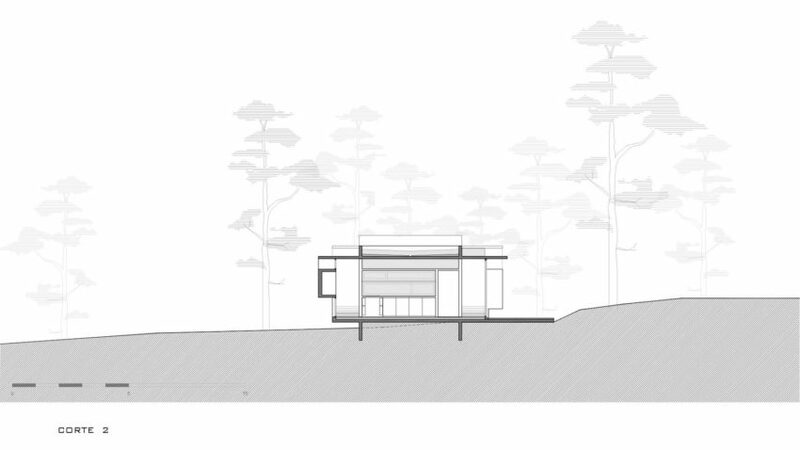 It is a more interpretive style that respects the urban form contextual of the neighbors. 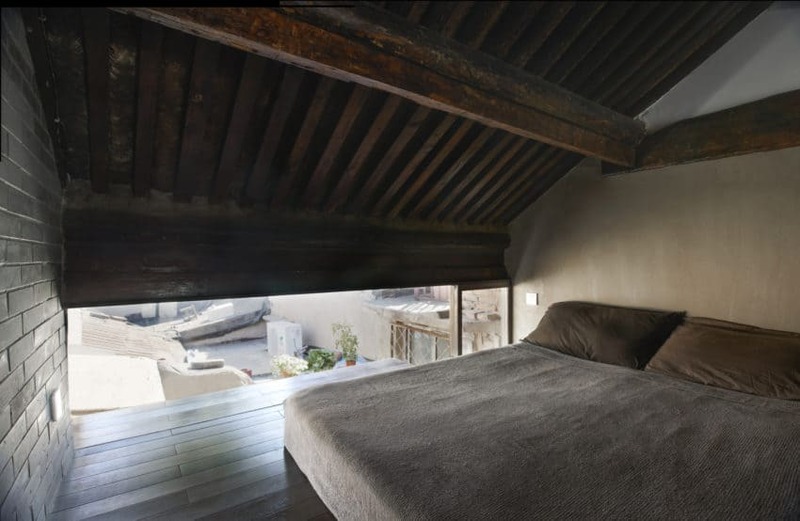 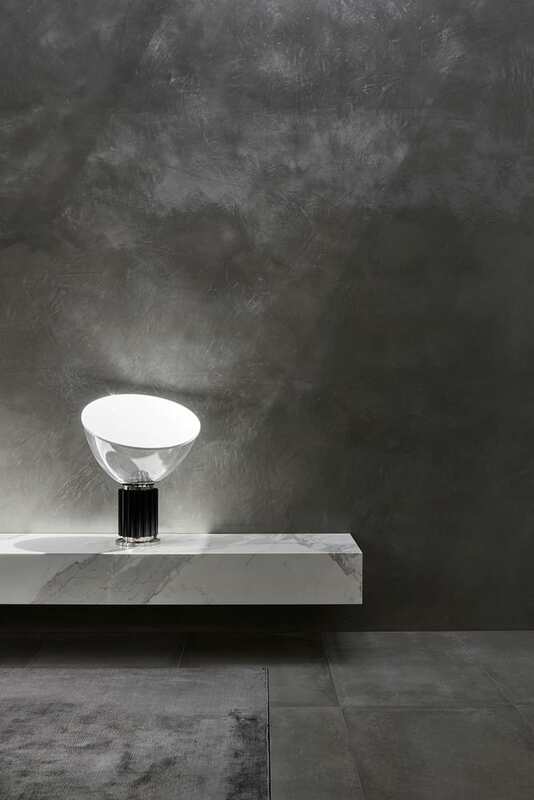 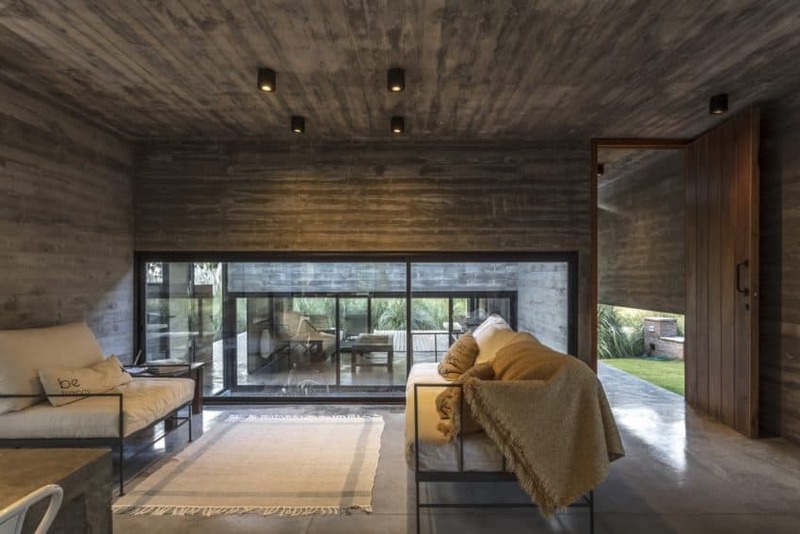 It has a simple and refined palette of high quality materials consisting of handmade bricks, walnut, plaster, and glass. 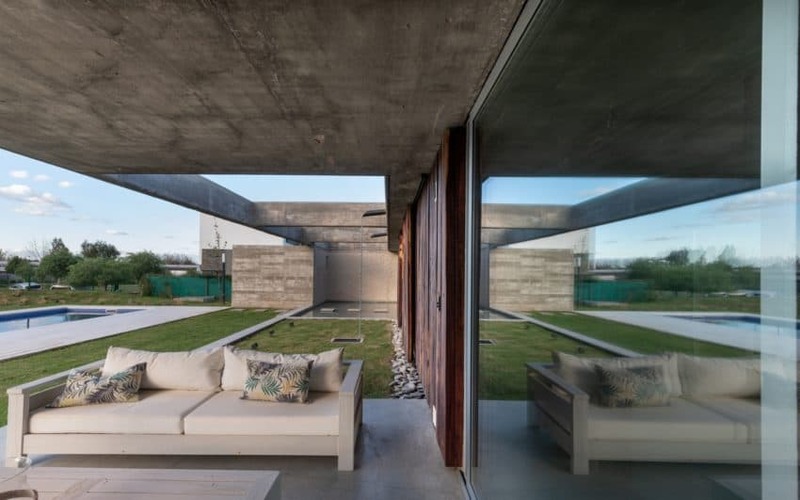 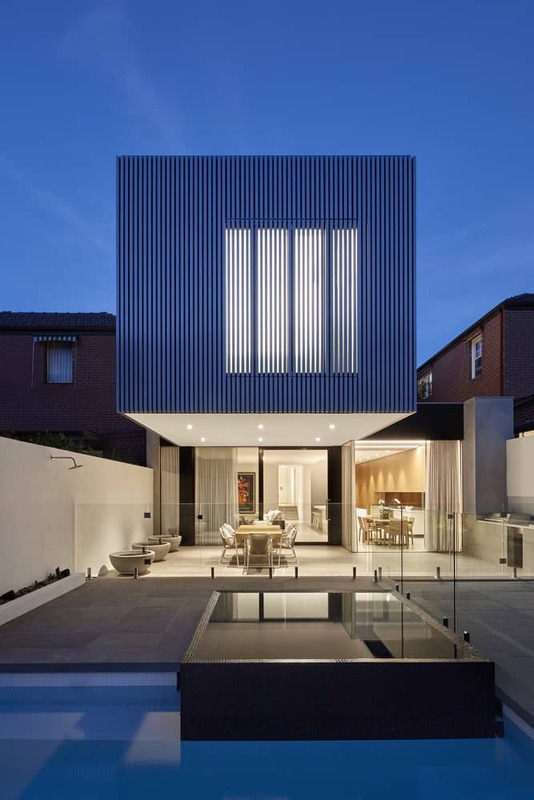 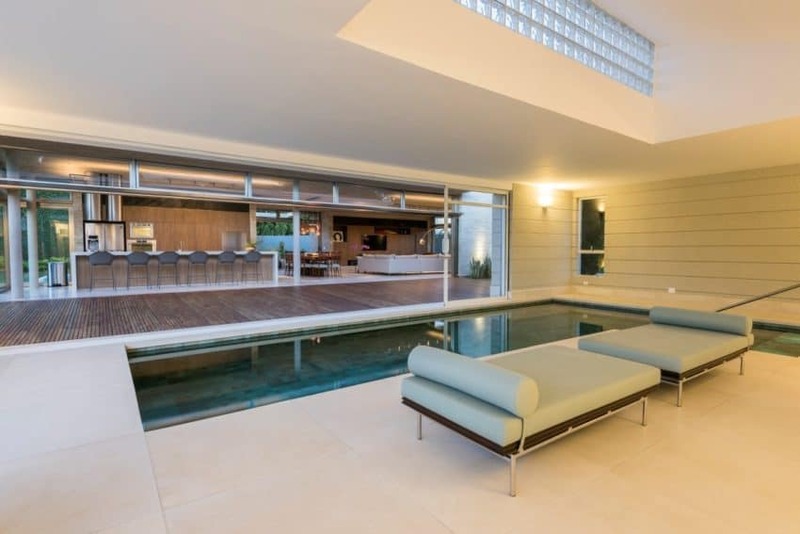 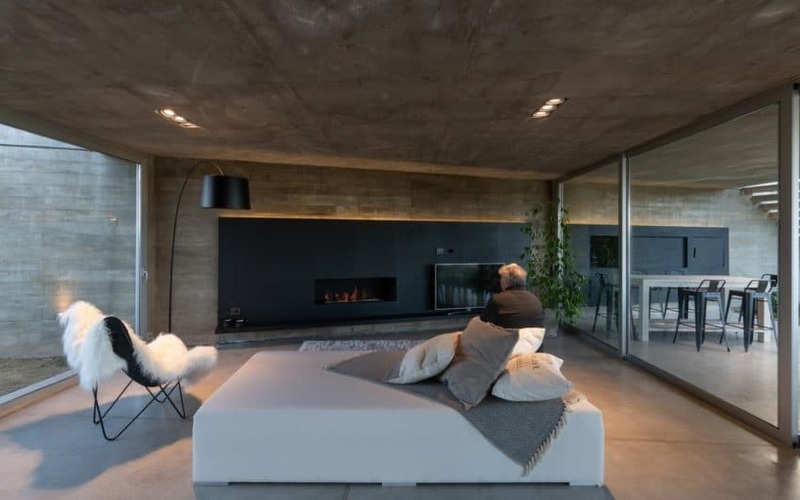 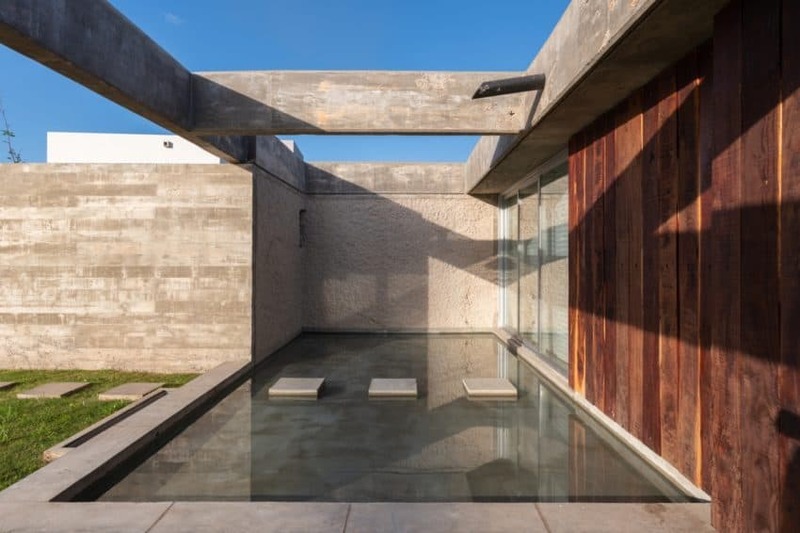 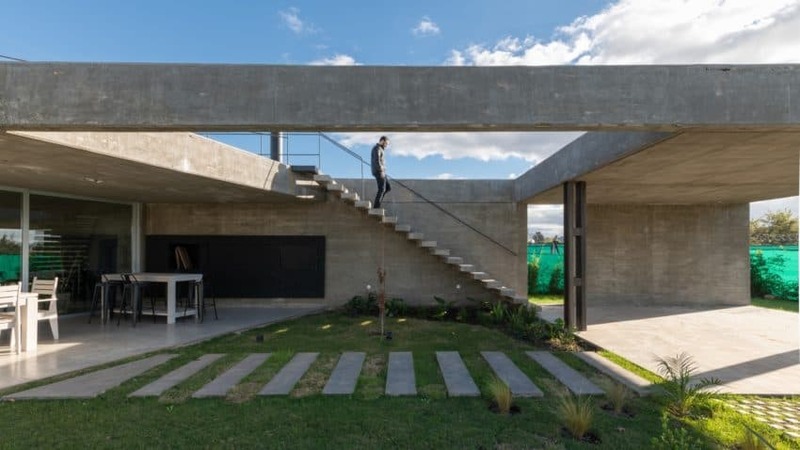 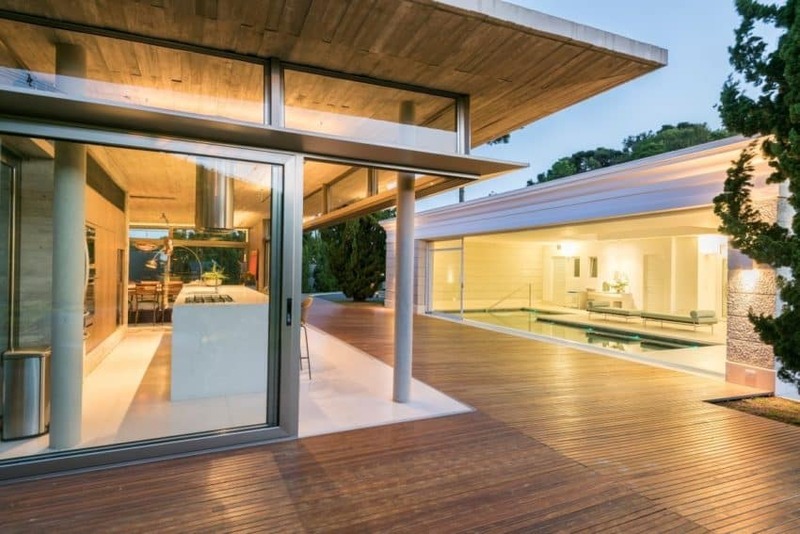 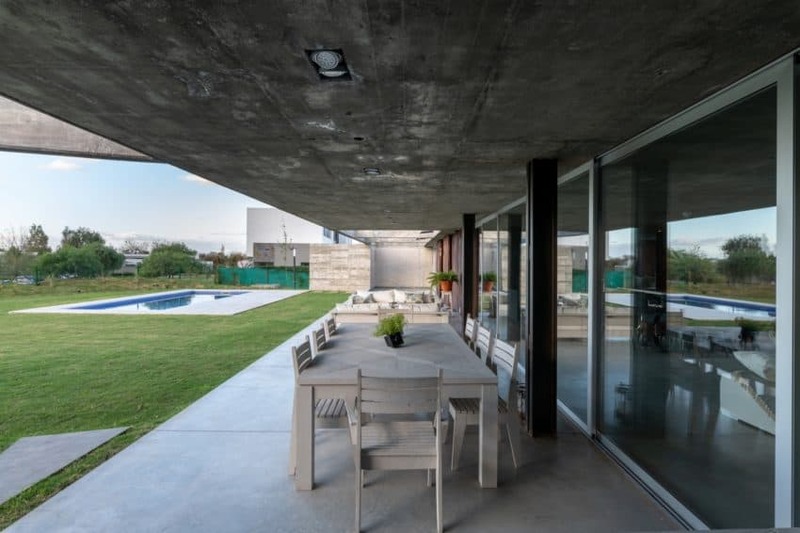 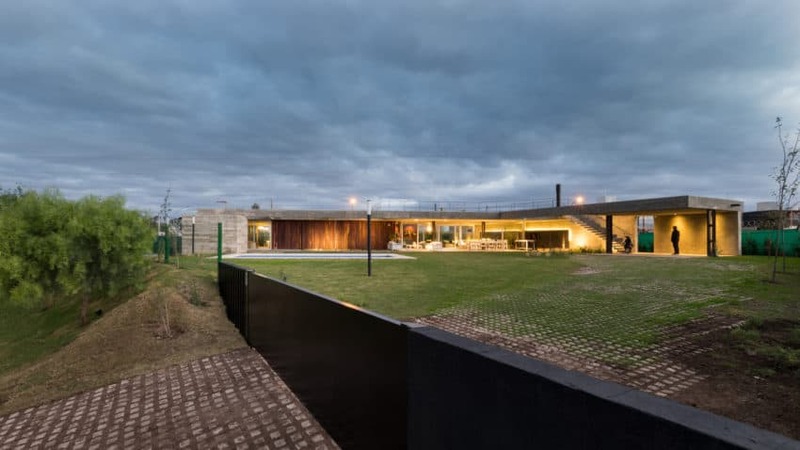 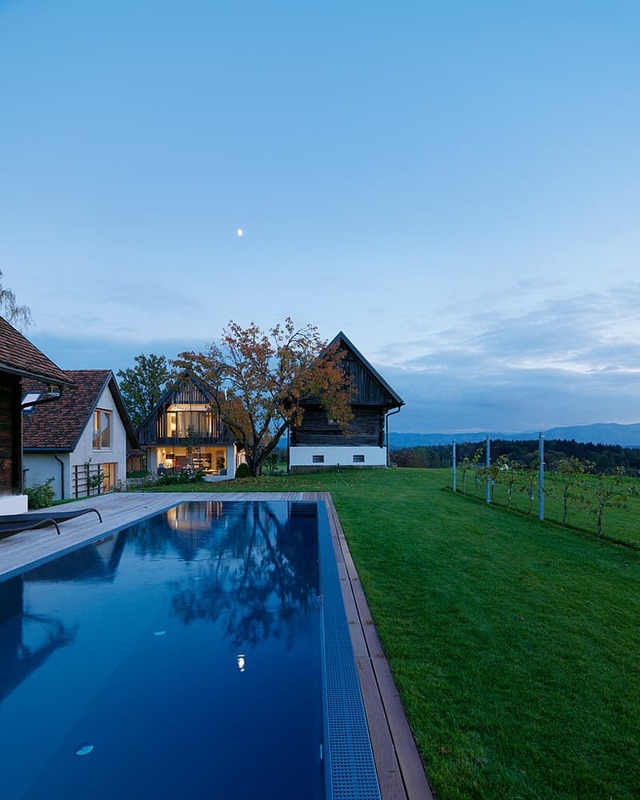 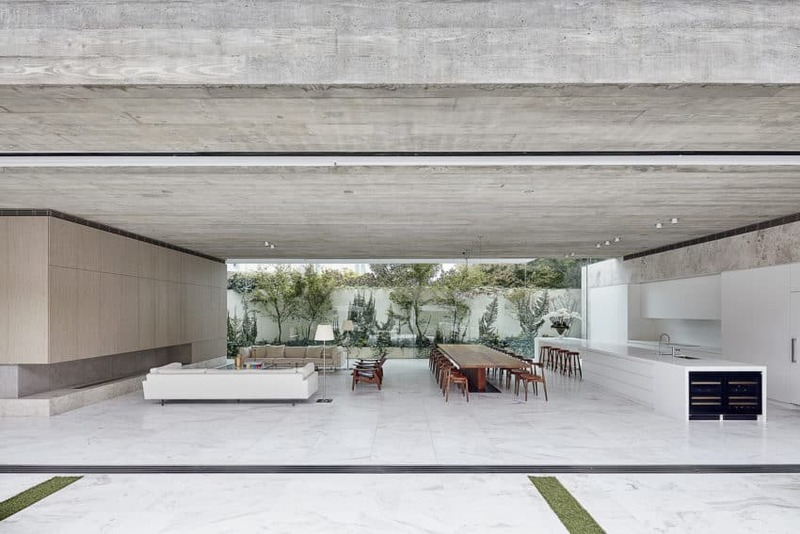 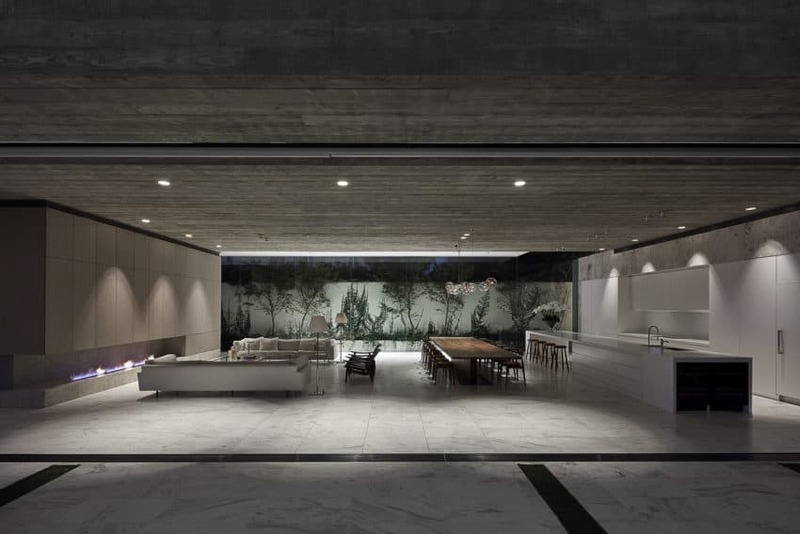 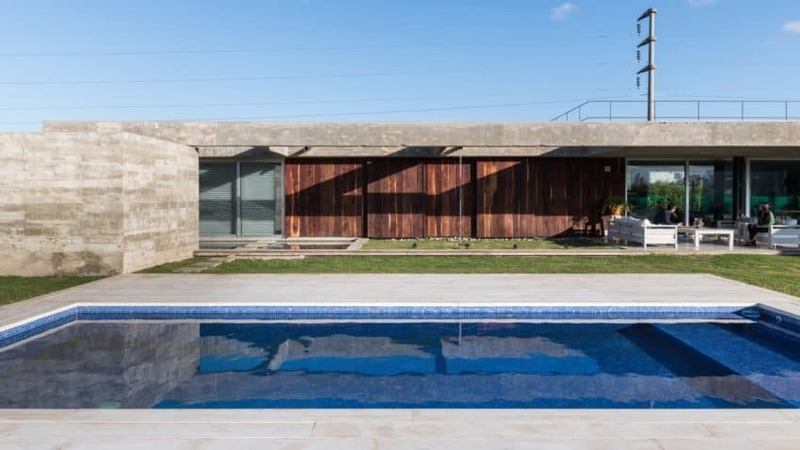 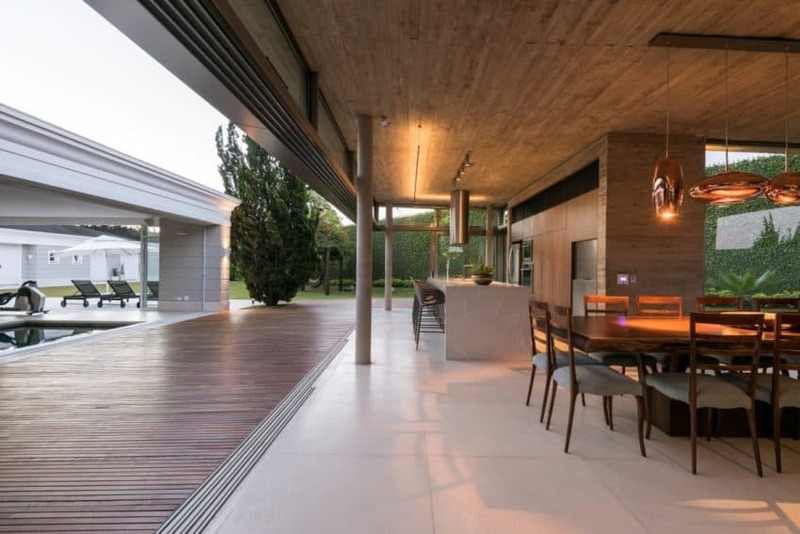 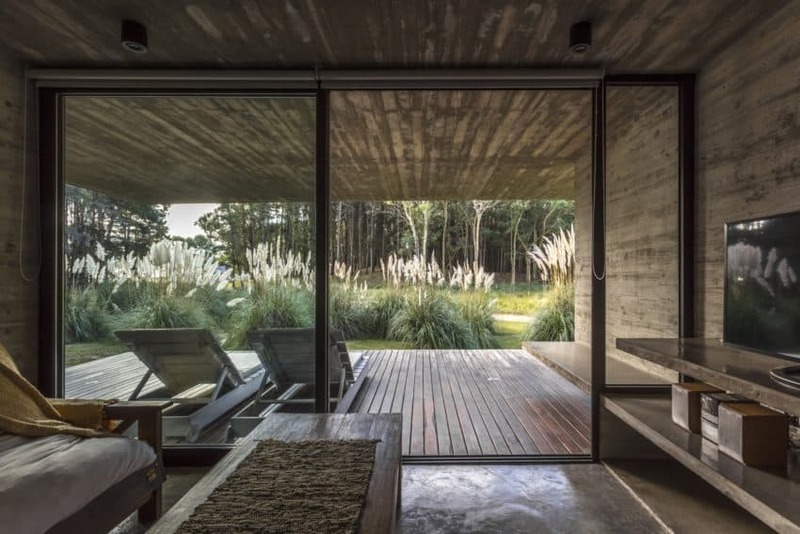 In an urban environment without large dominant views towards the outside, the house turns towards the interior patio and the pool with a connection to nature focusing up in the sky. 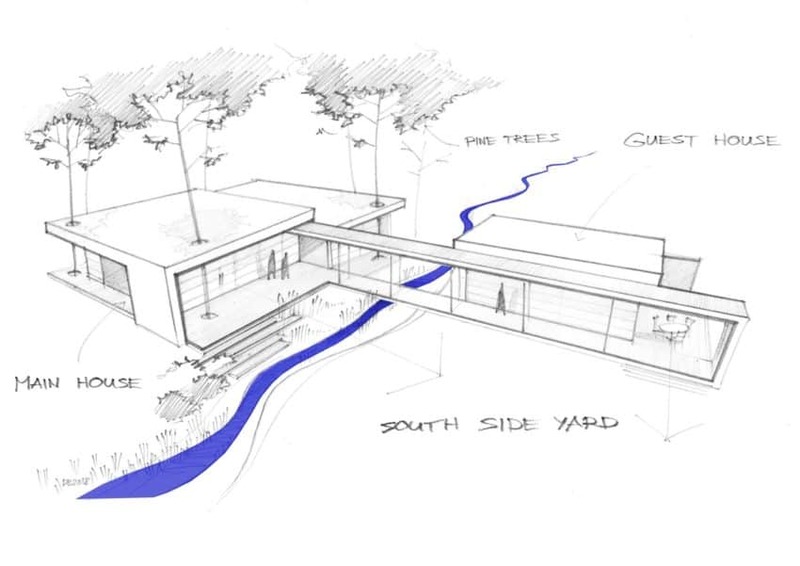 This concept is inspired by the exploration of modern artists in the connection of the sky, Earth, and proportion. 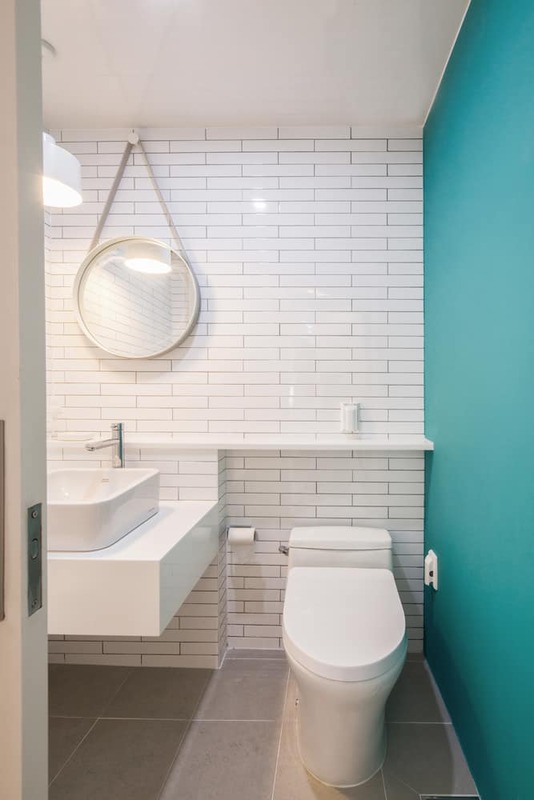 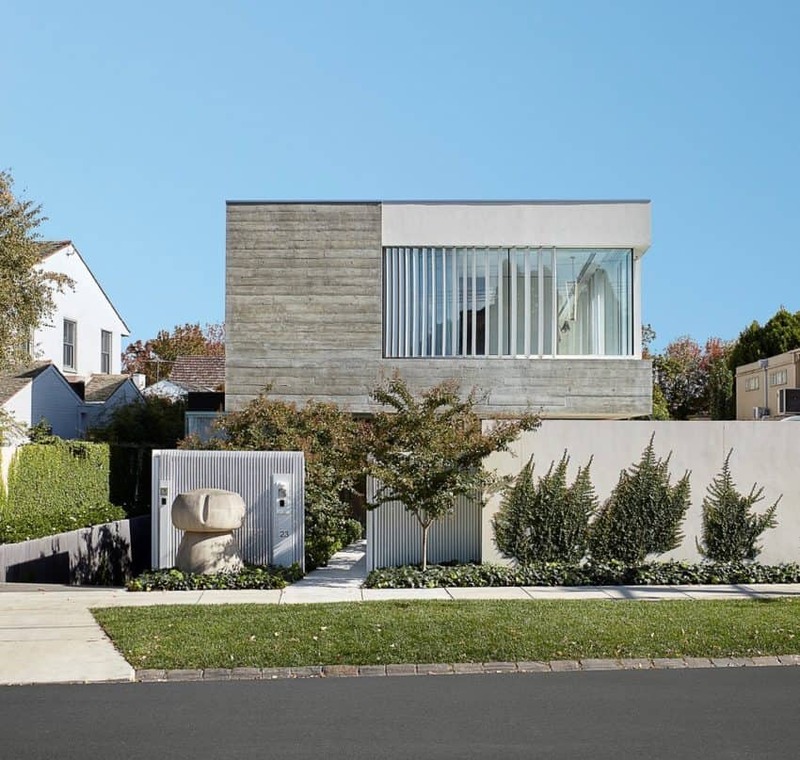 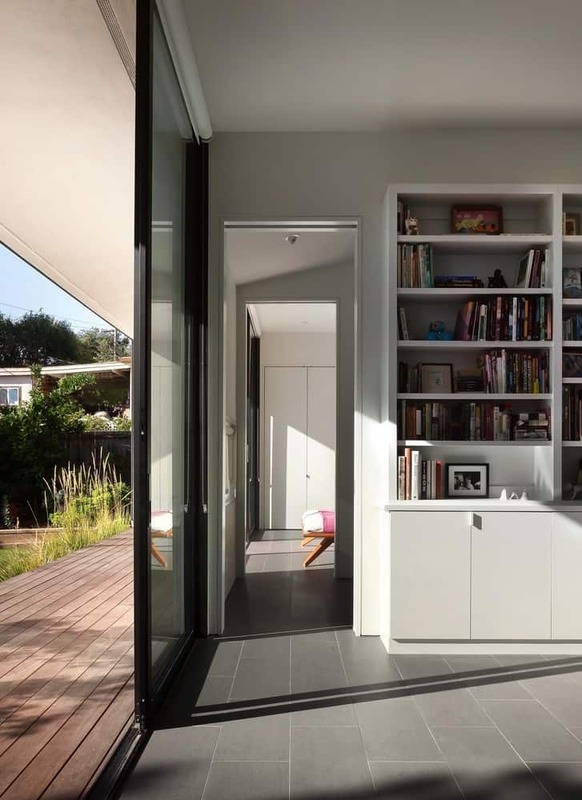 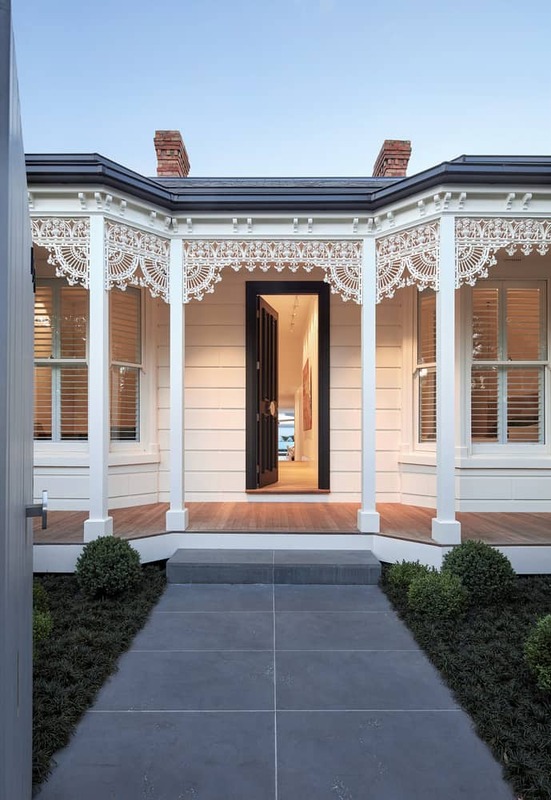 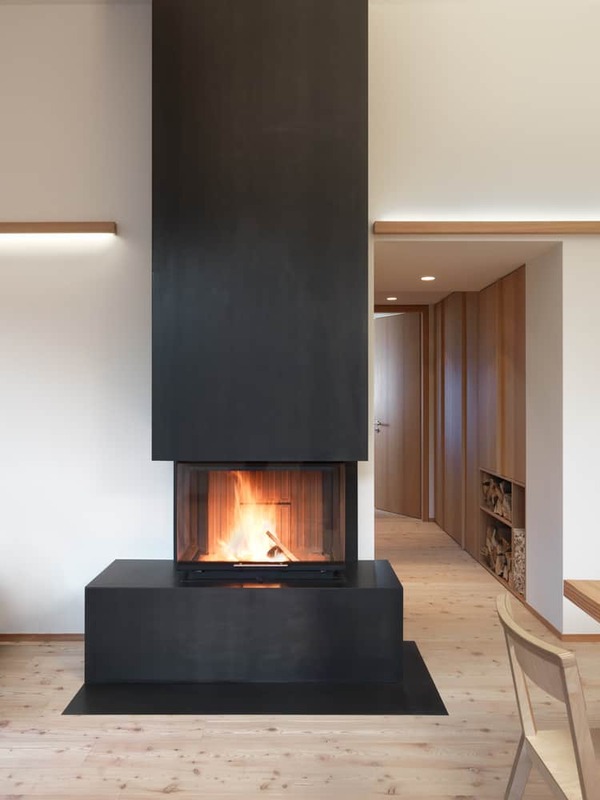 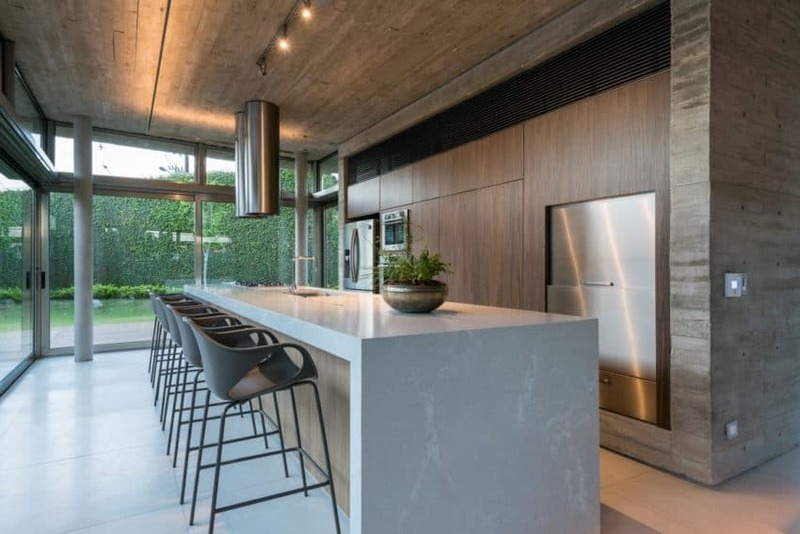 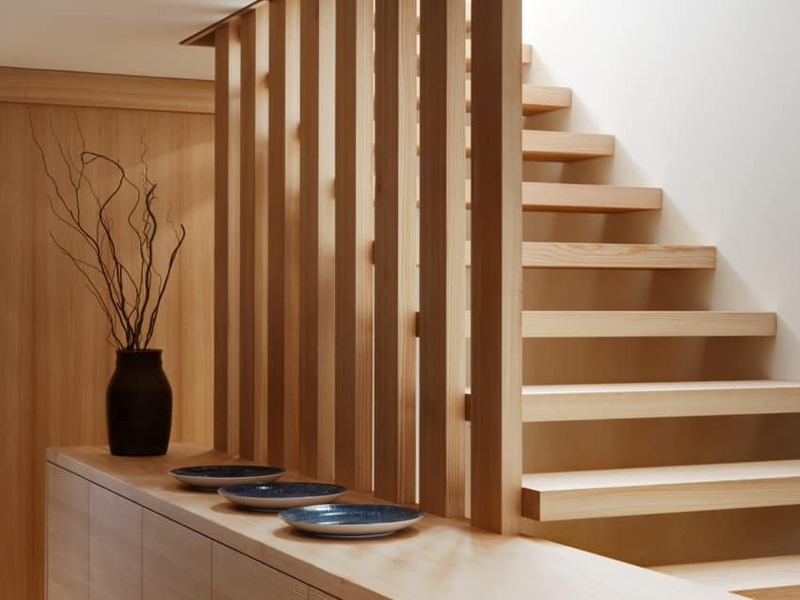 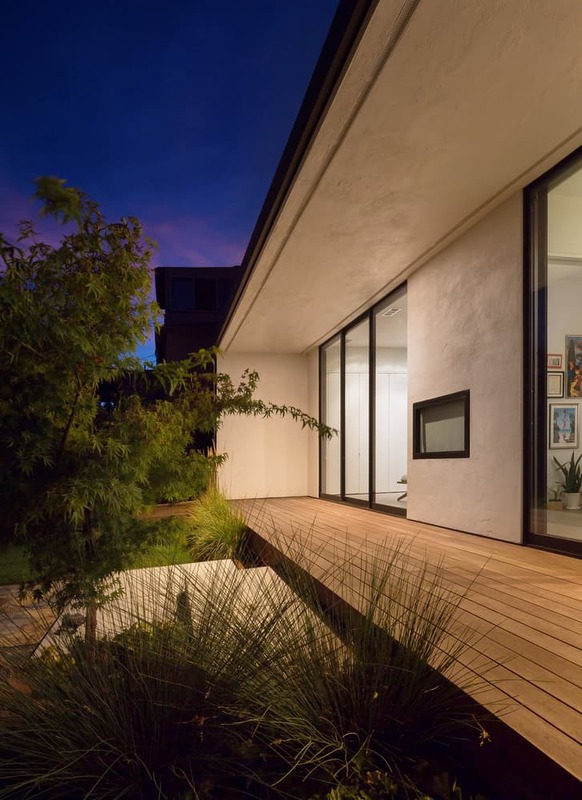 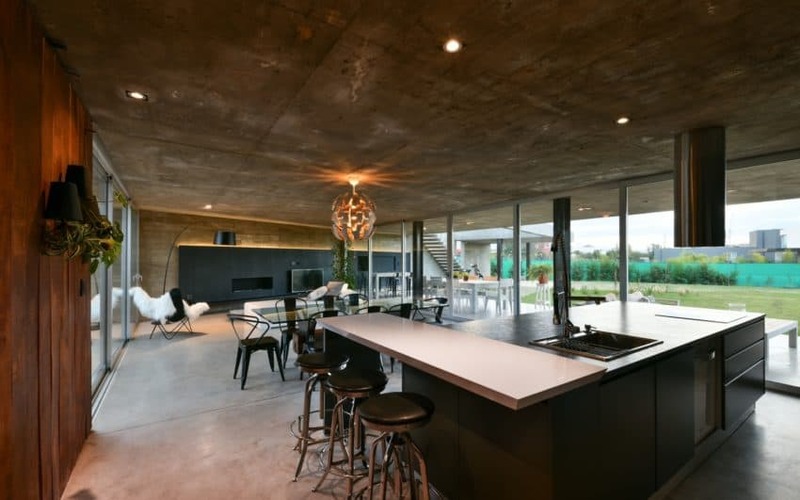 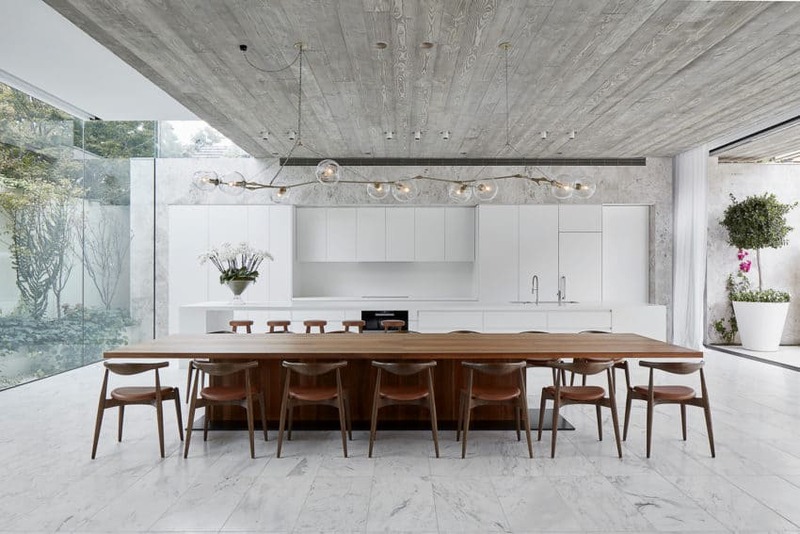 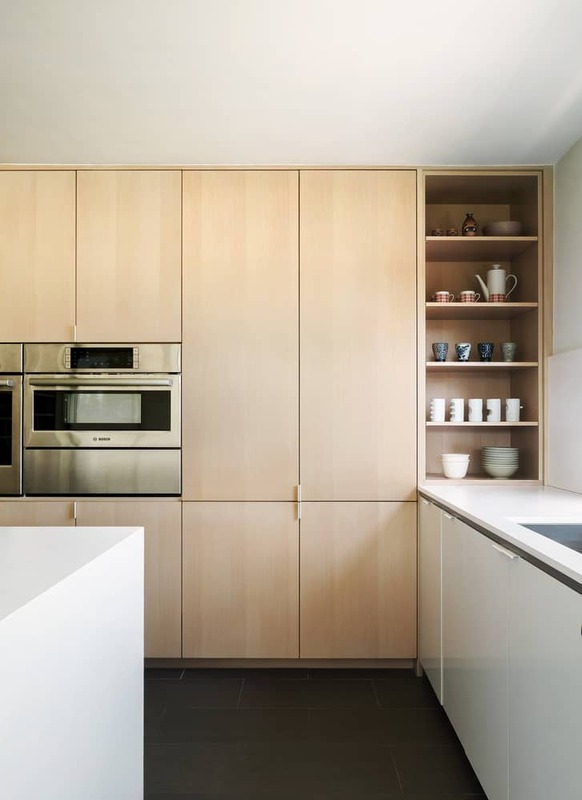 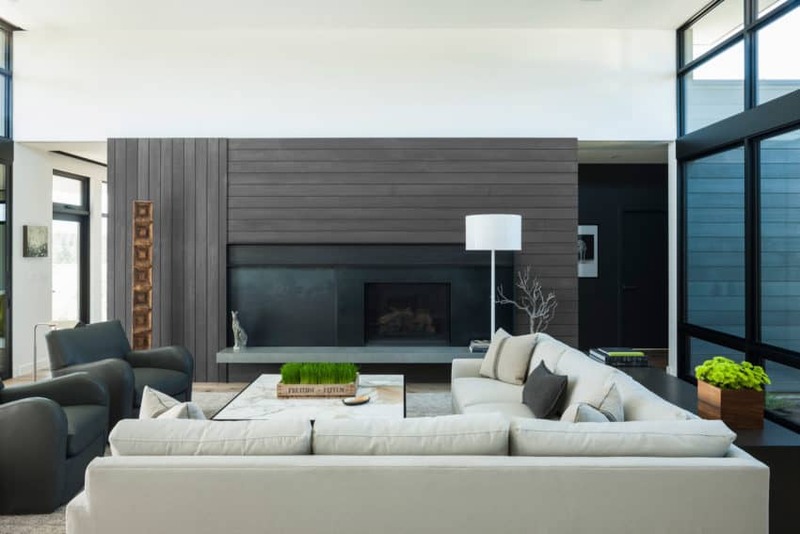 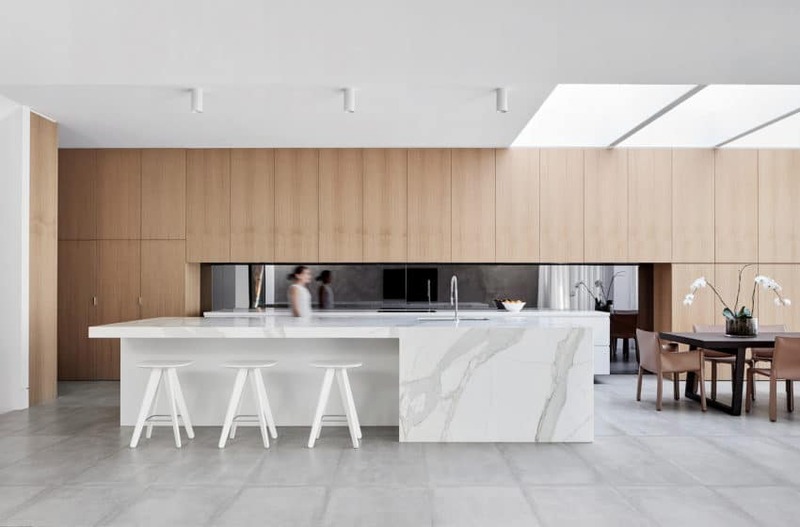 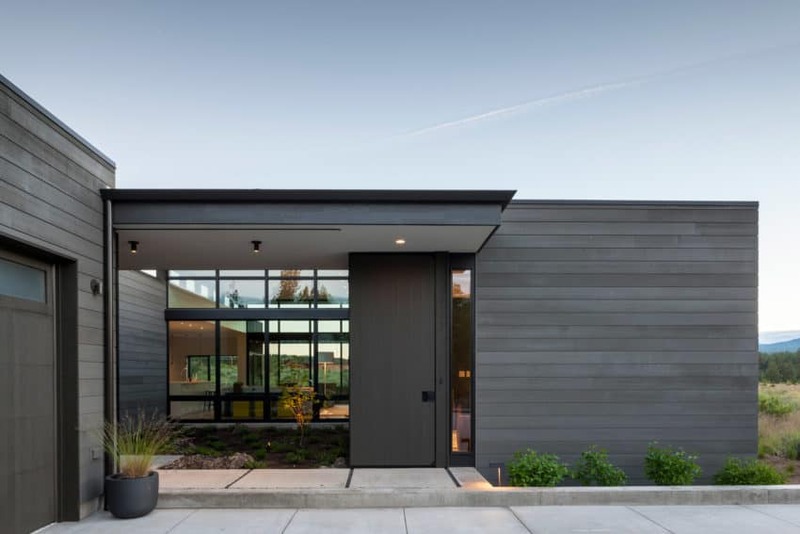 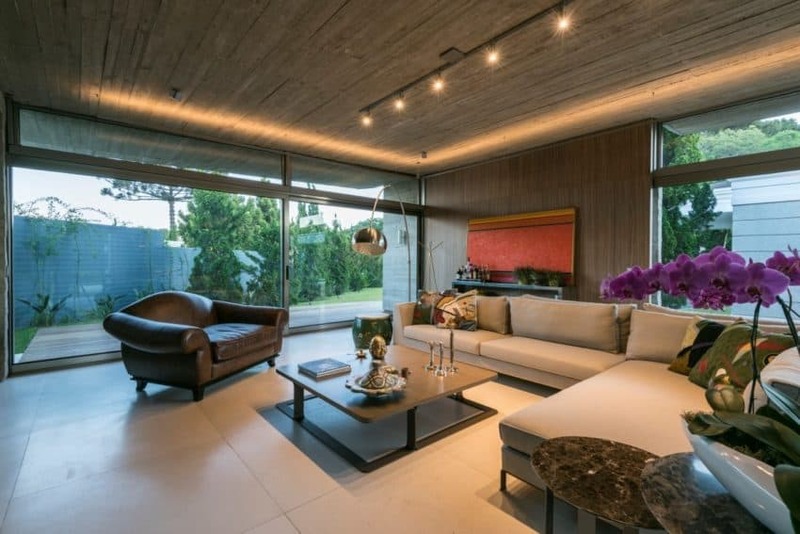 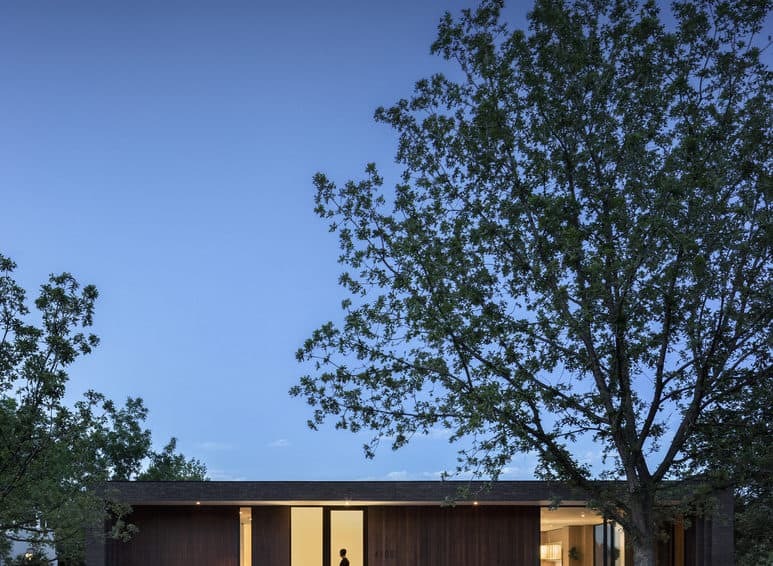 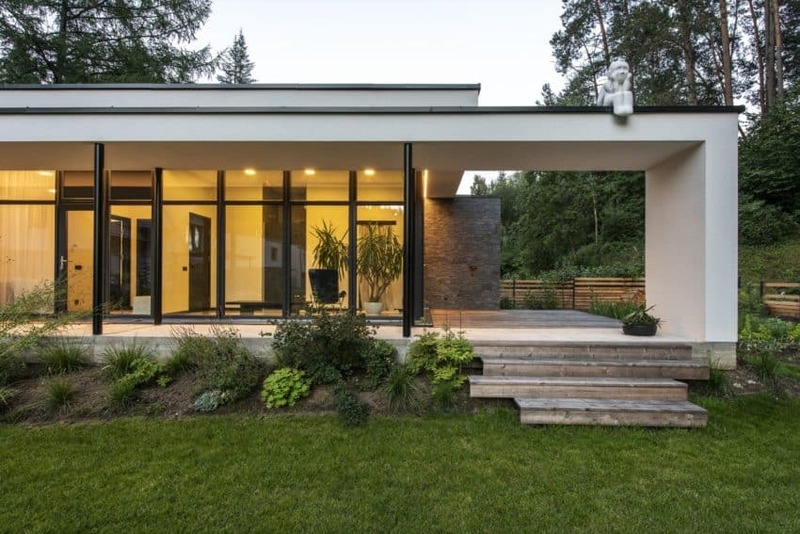 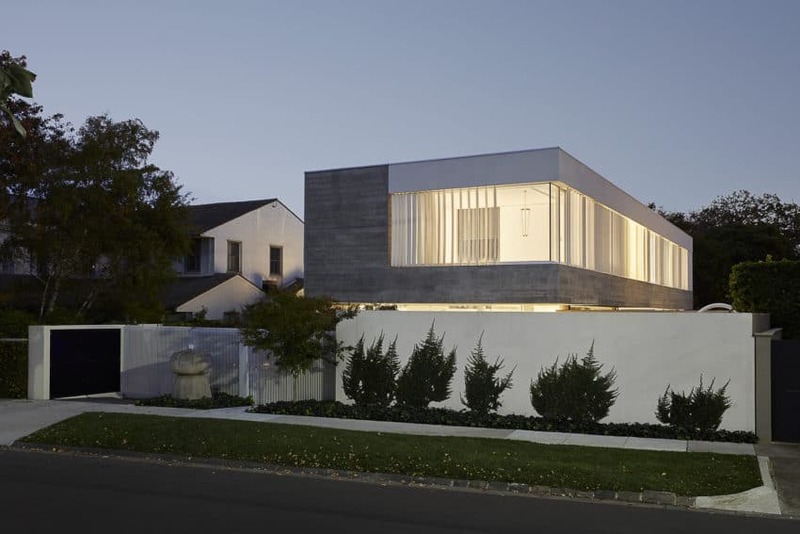 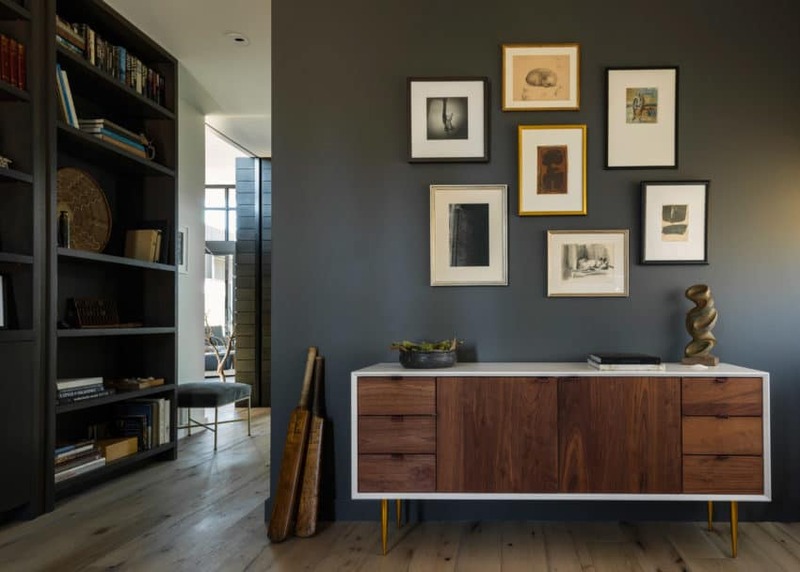 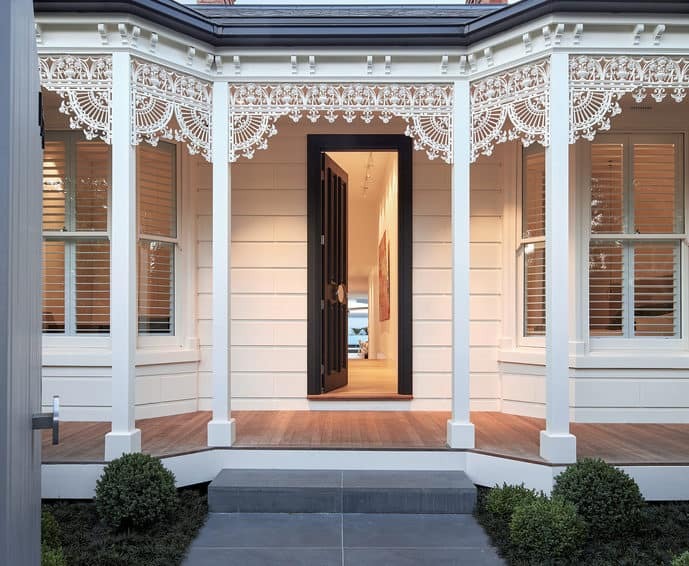 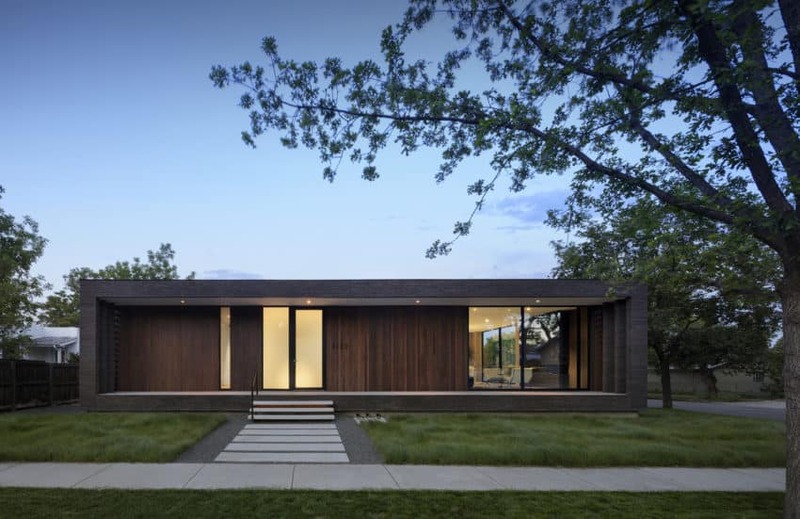 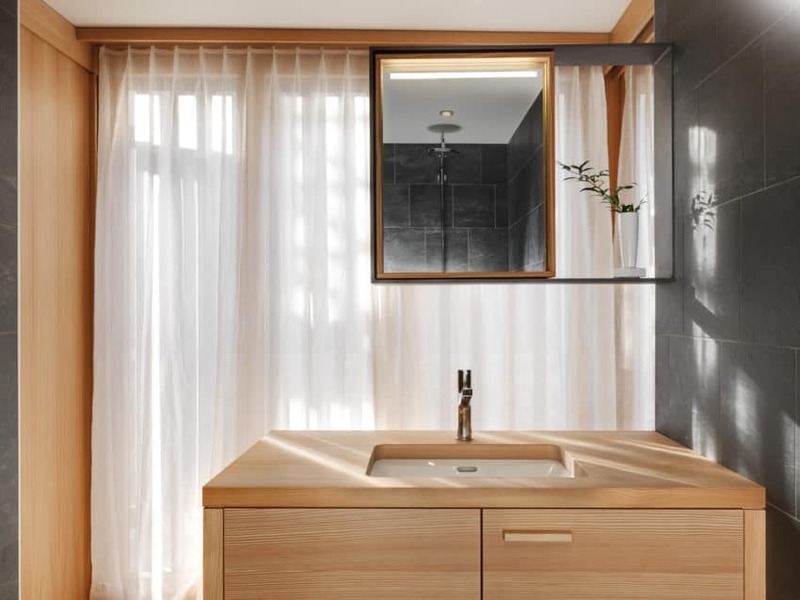 This remodeling, which initially sought to create a connection between the interior of the house and the backyard, has been made by the architectural firm Michael Hennessey Architecture. 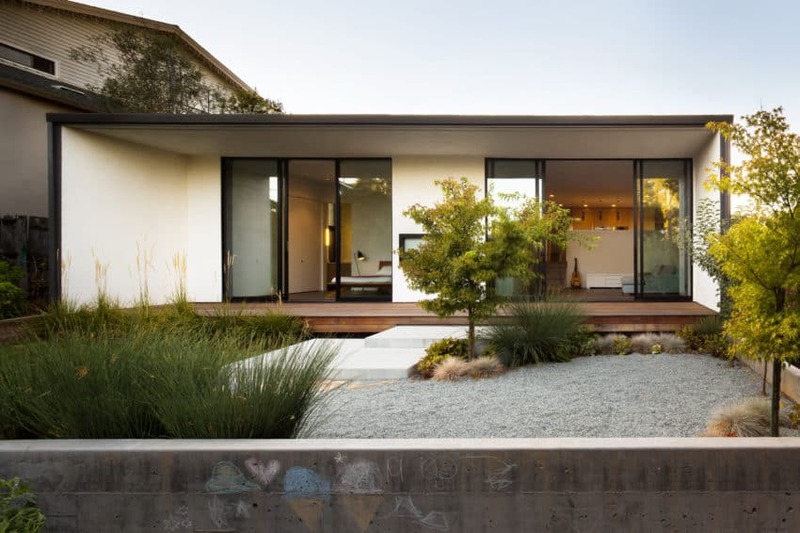 It is located in the beautiful city of San Francisco, in the United States, and has a total area of 2787 square feet. 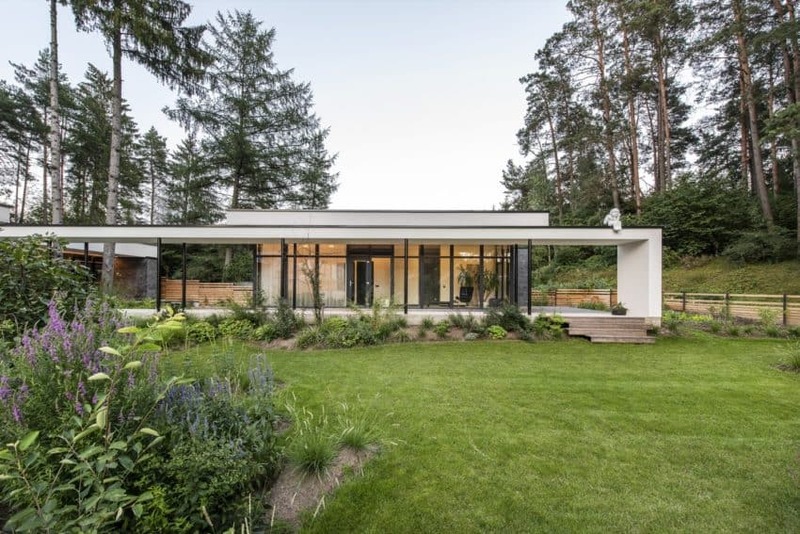 In 2014, the young family that owns this ranch-style bungalow contacted the architectural firm so that they could carry out the project. 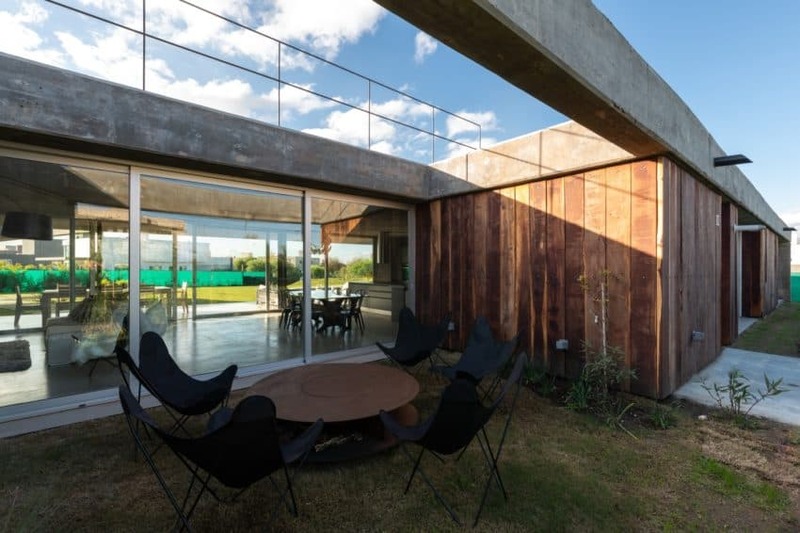 Several windows and very small doors were in front of the patio that prevented the desire of the parents to spend large amounts of time outdoors with their children, taking care of the garden, the henhouse, and the landscaping. 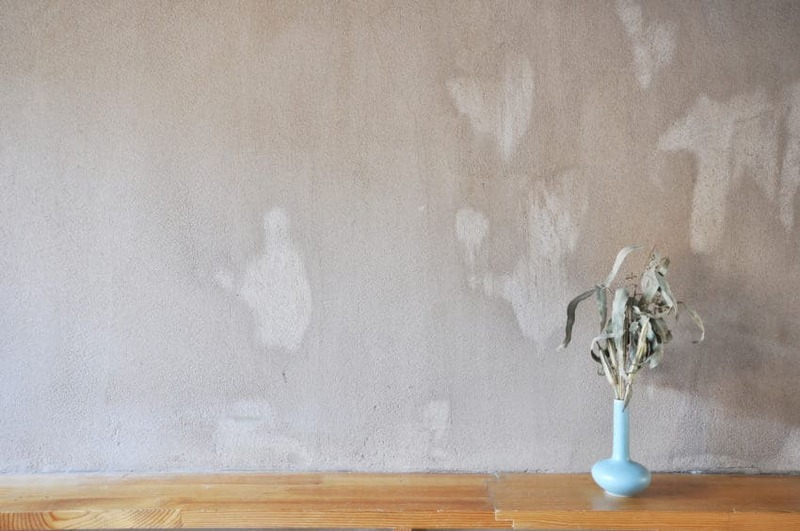 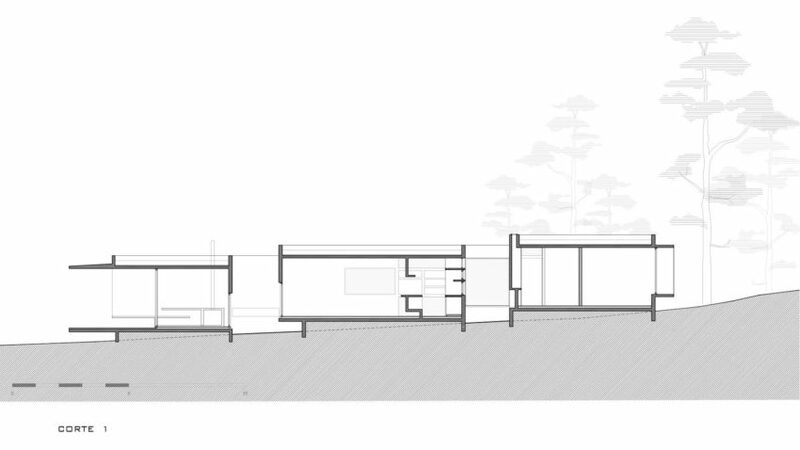 The family sought to live perfectly between inside and outside. 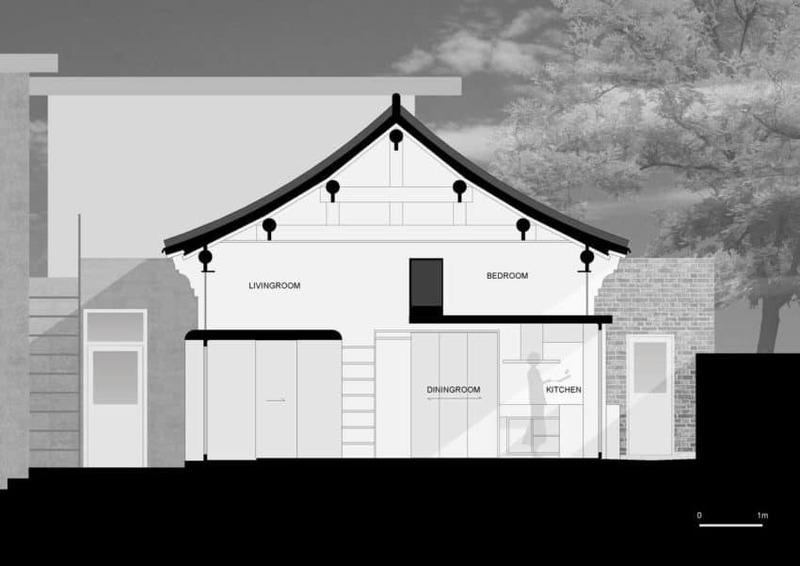 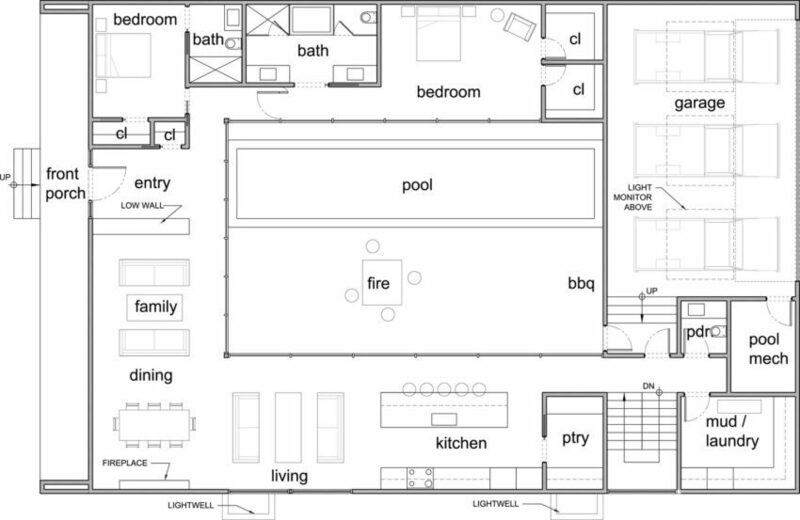 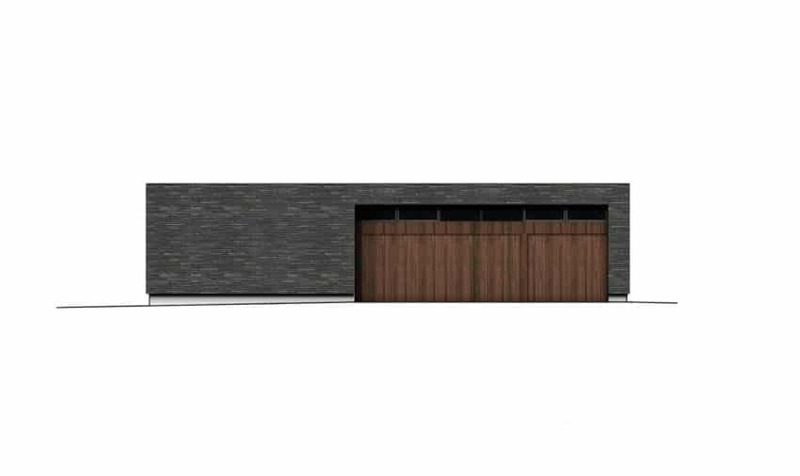 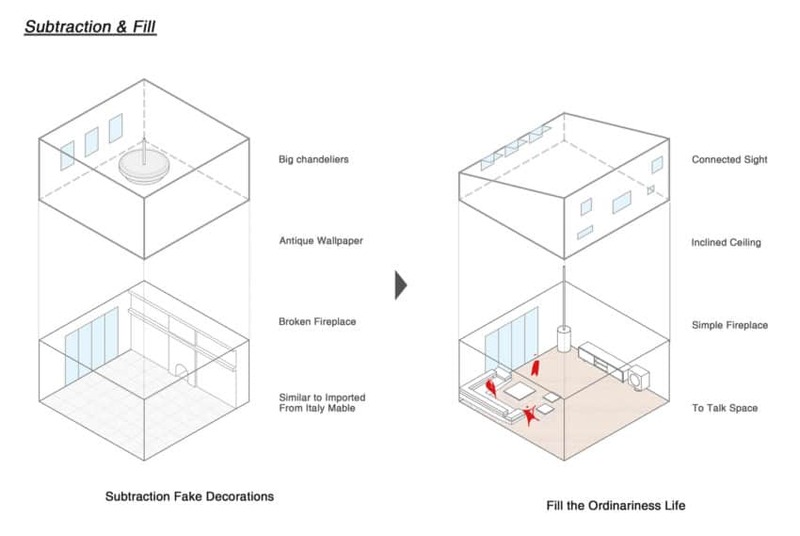 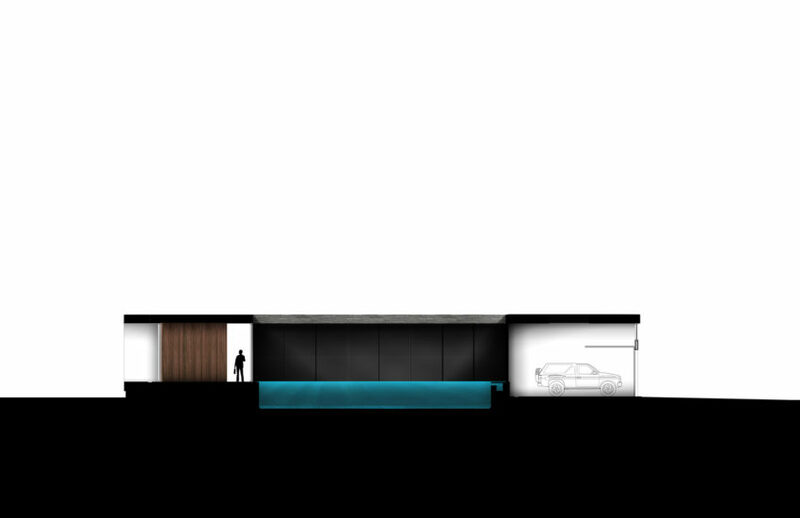 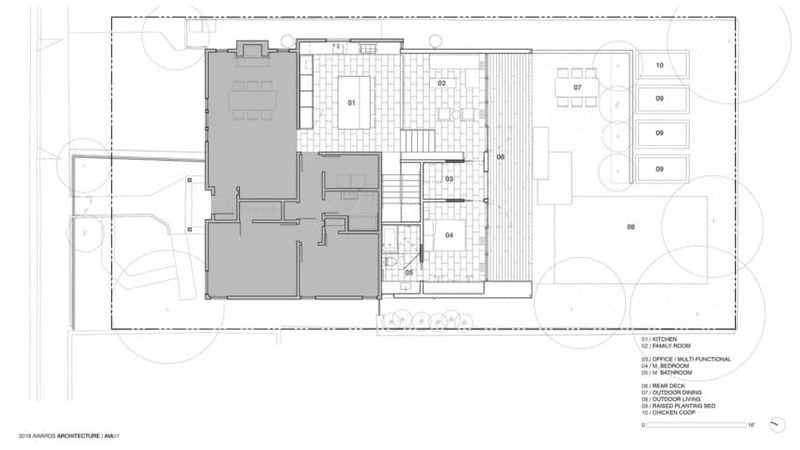 The proposed kitchen, the family room, the office, and the master bedroom were designed to open the house to the outdoors. 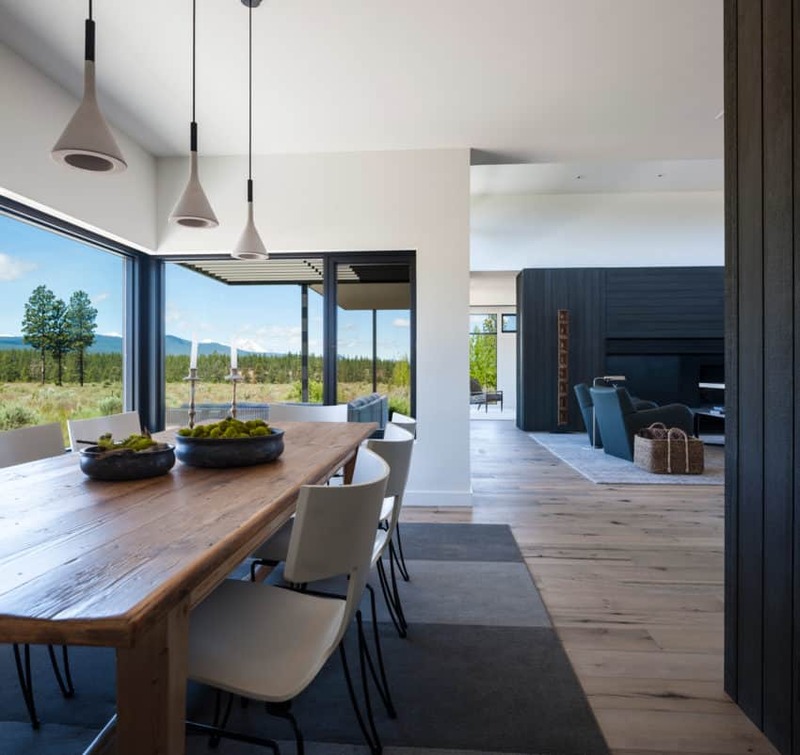 A direct view from the kitchen, the living room, and the backyard allows the family to stay committed to each other throughout the day. 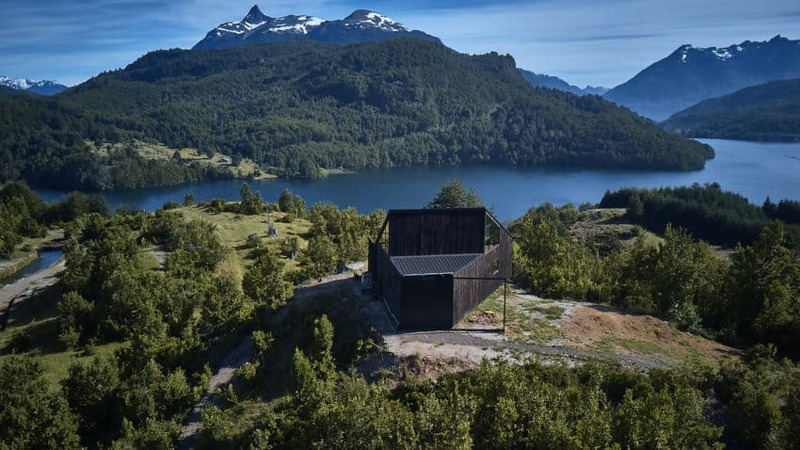 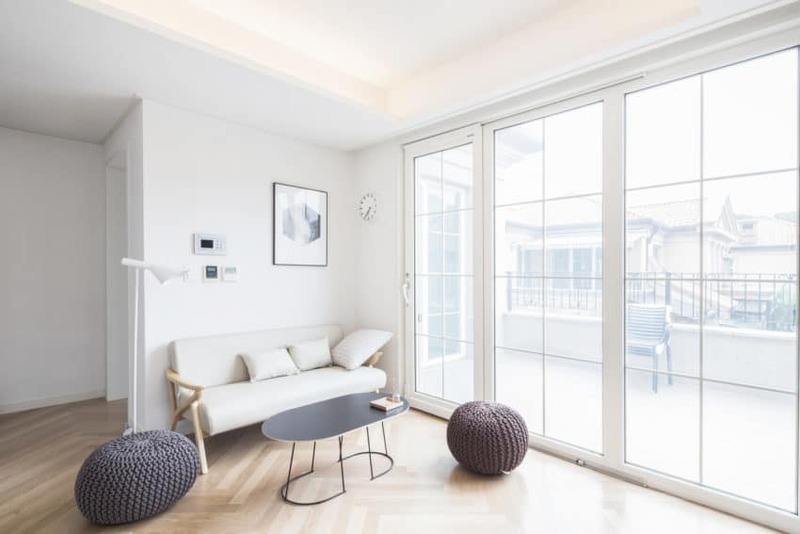 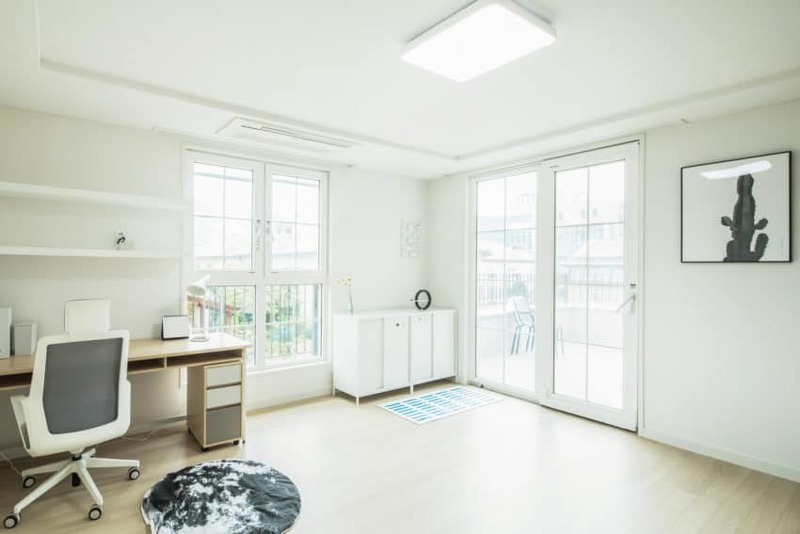 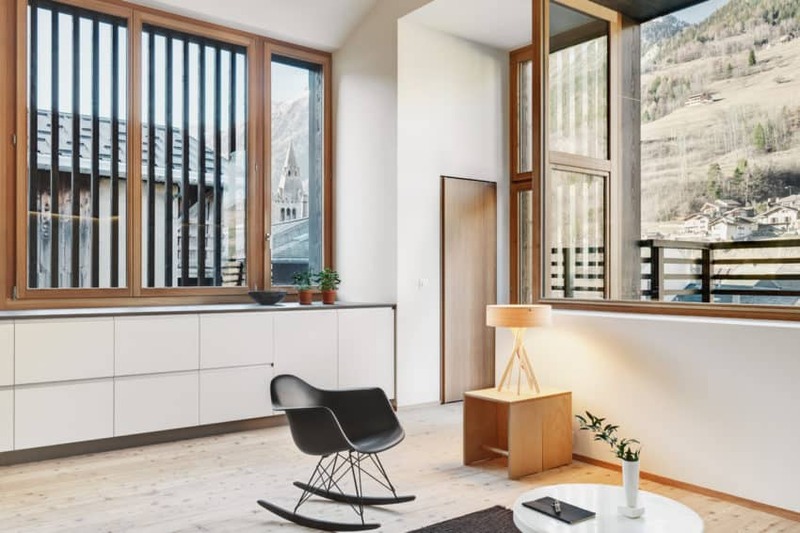 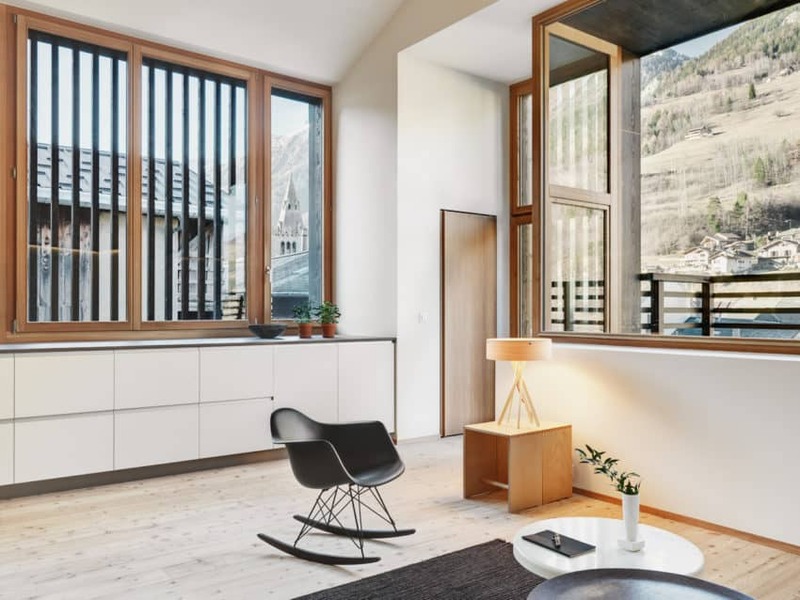 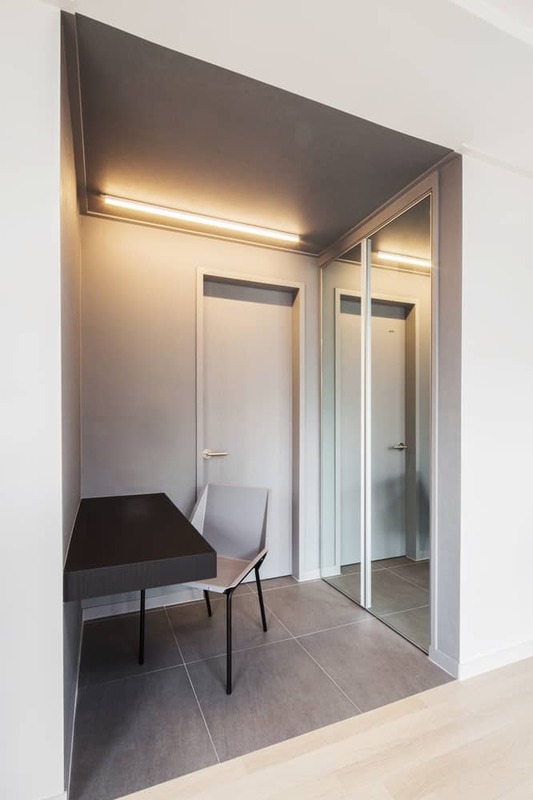 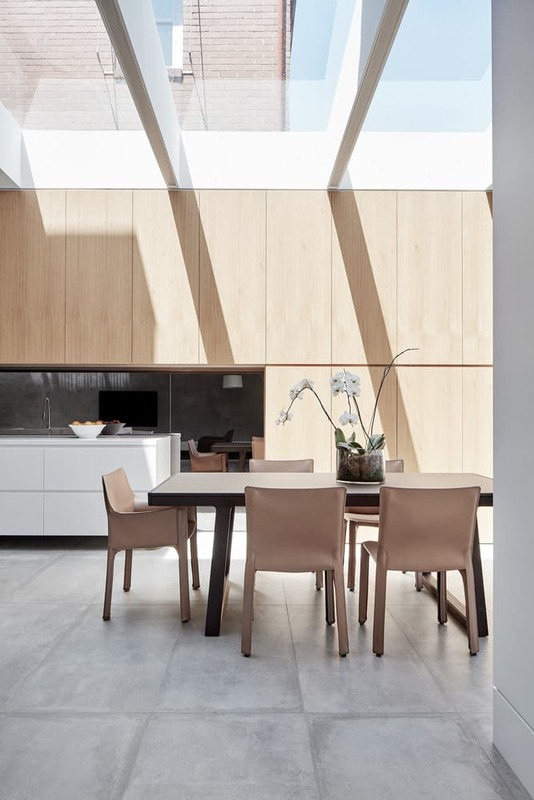 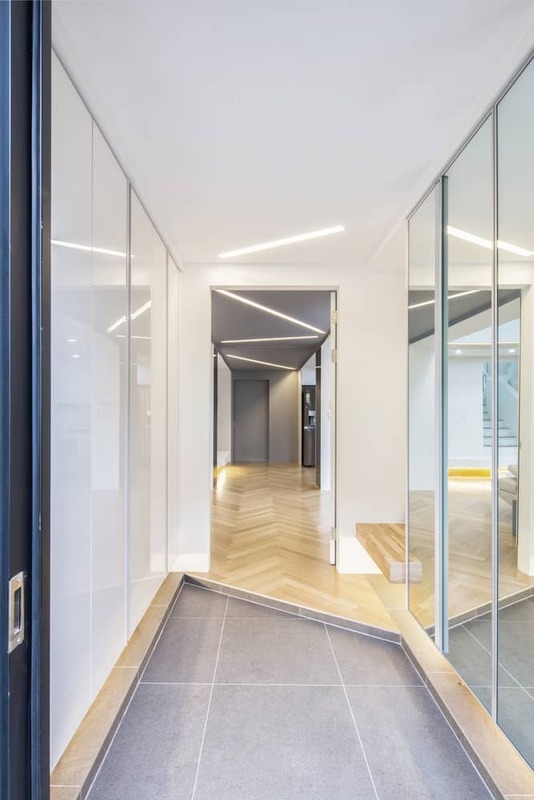 The natural daylight reaches deep into the existing house with large glass panels at the back of the lift, as well as more discreet skylights and windows with slots towards the center of the building. 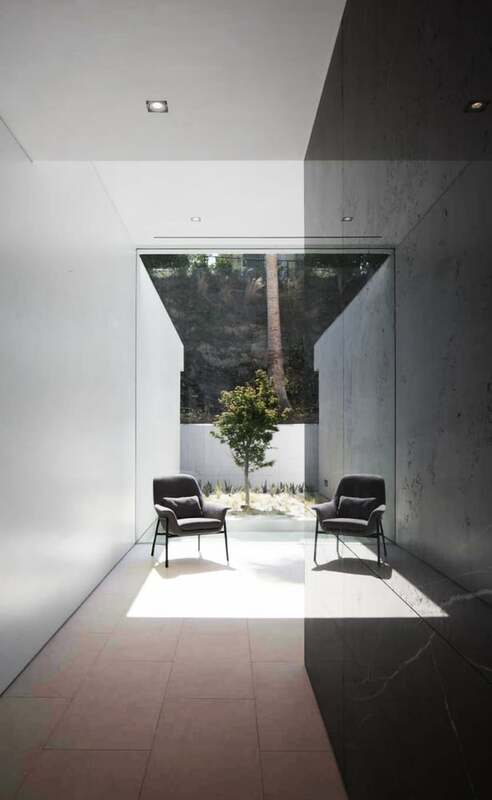 A deep projection on the back covers half the hard impact of the sun. 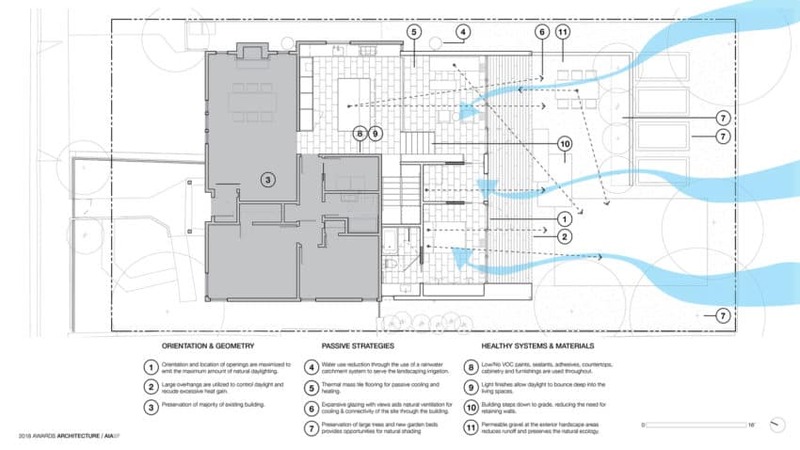 The backyard was designed as three specific zones: dining room / living room area, lawn / play area and orchard / chicken area. 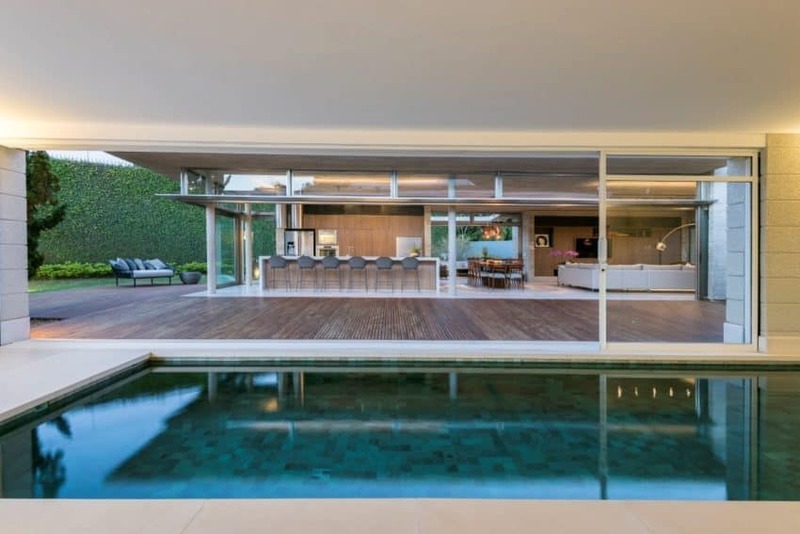 The Mirrorhouse is a private residence located in the Trousdale Estates of Beverly Hills, a city in Los Angeles County, California, in the United States. 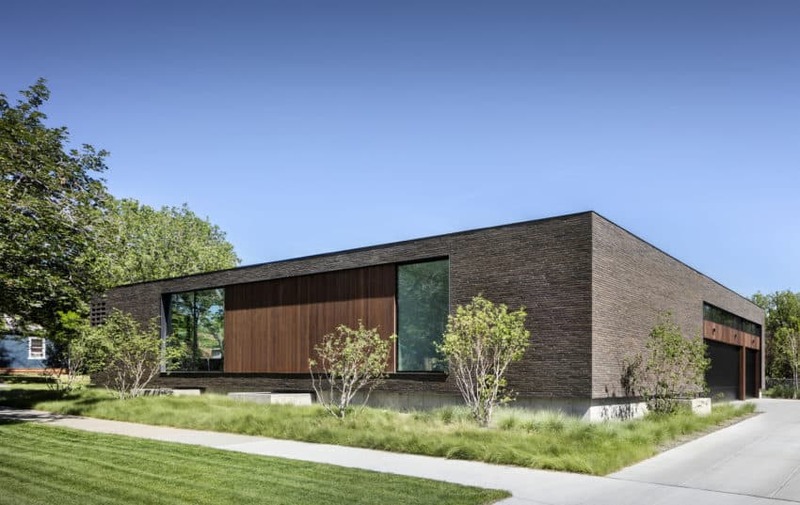 The home was designed by XTEN Architecture and completed in 2016, covering a total ground area of 8,000 square feet. 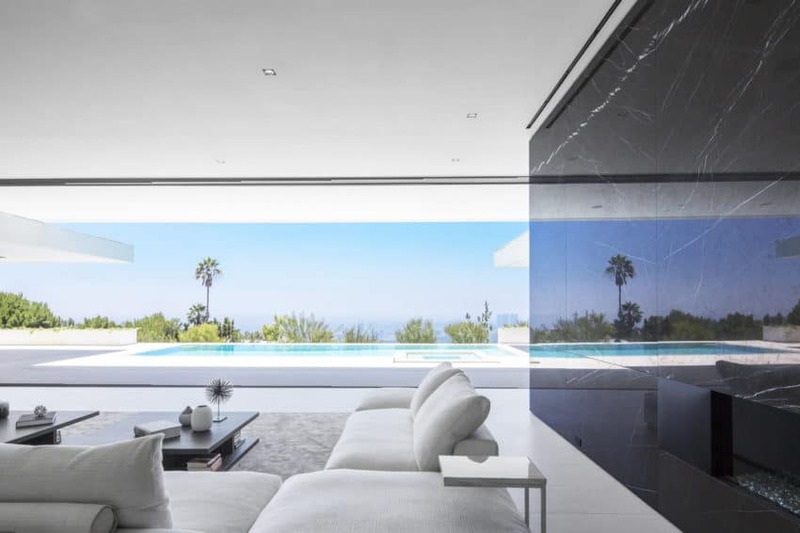 It enjoys an incredible view of Downtown Los Angeles, as well as the Pacific Ocean. 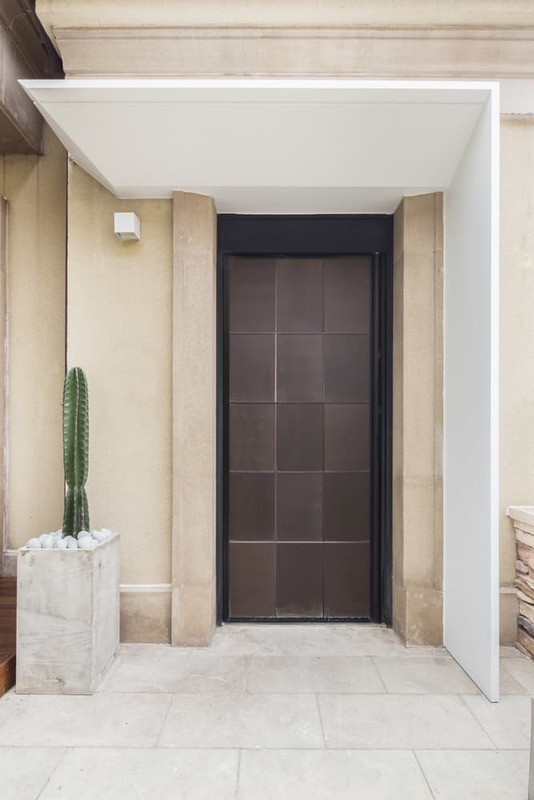 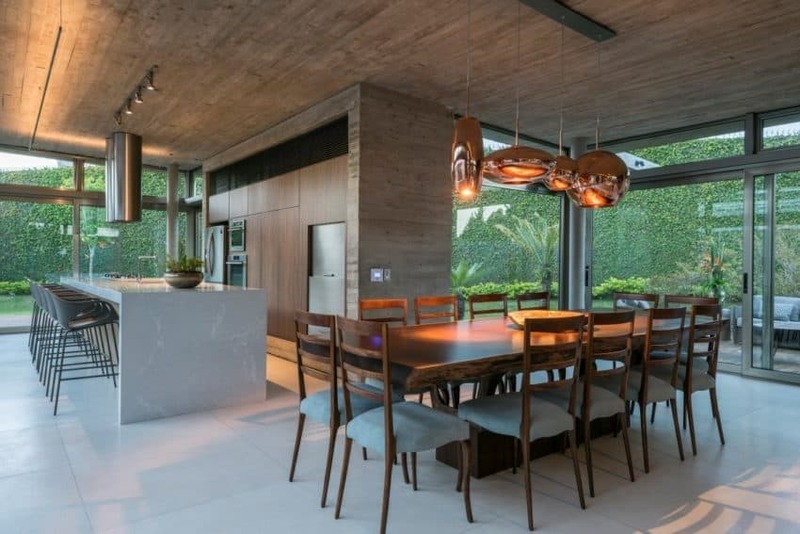 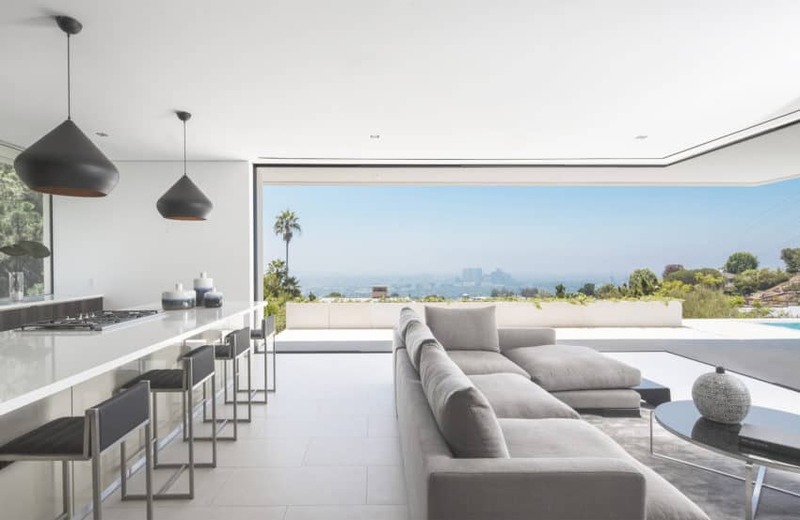 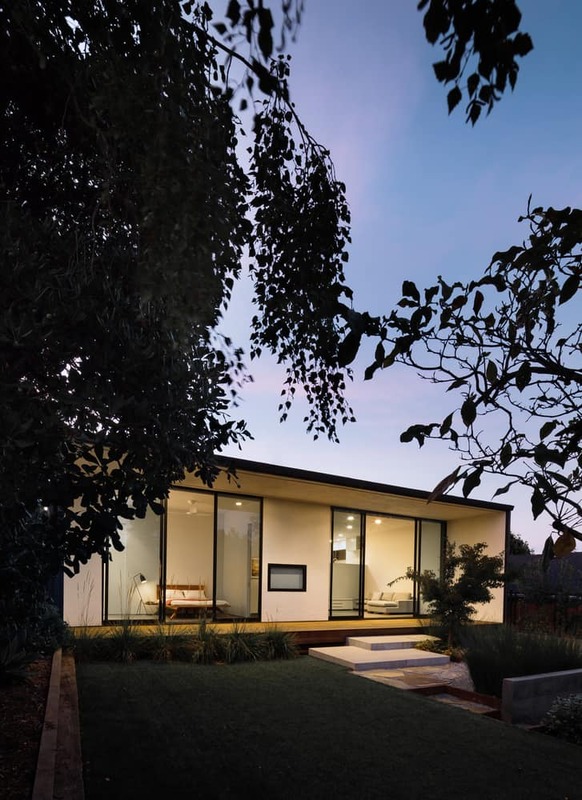 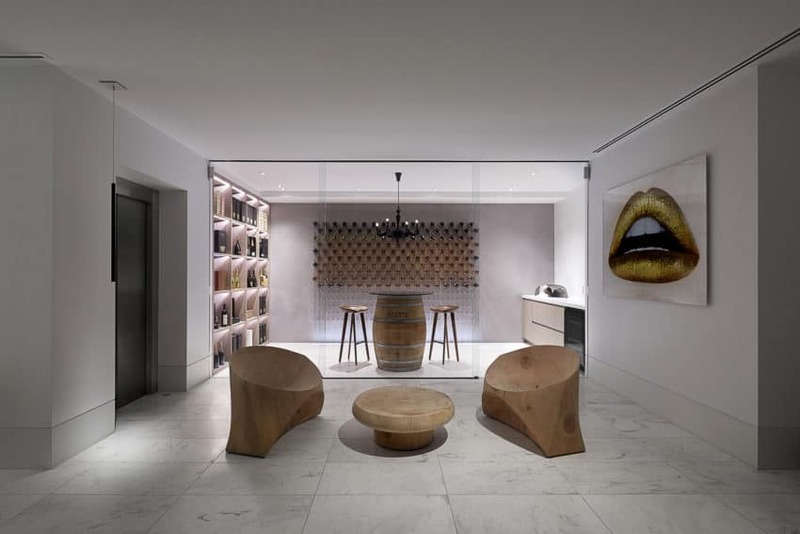 The challenge presented to XTEN Architecture was to create a simple, rational home that emphasized its connection with the surrounding landscape, all of this done in order to celebrate the unique lifestyle that Beverly Hills and Los Angeles have to offer. 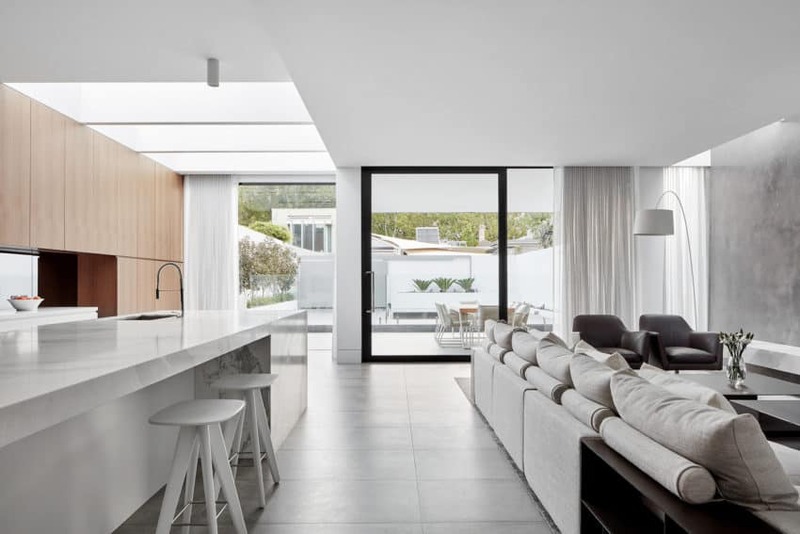 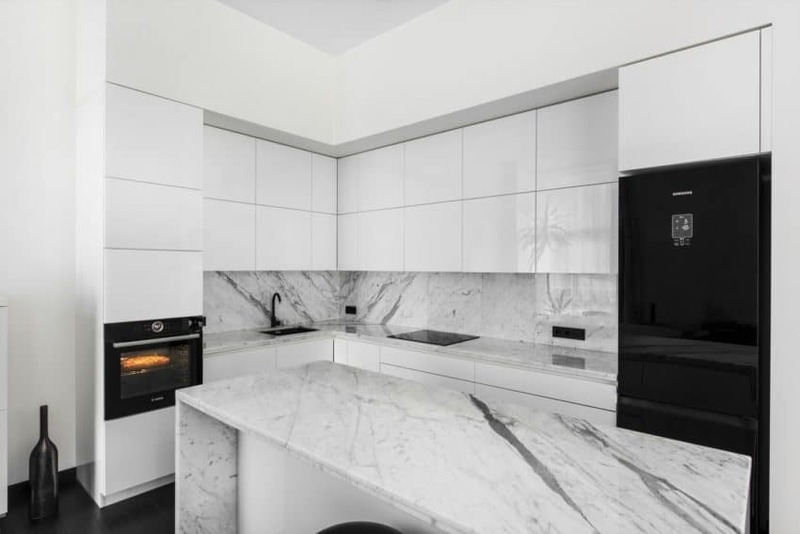 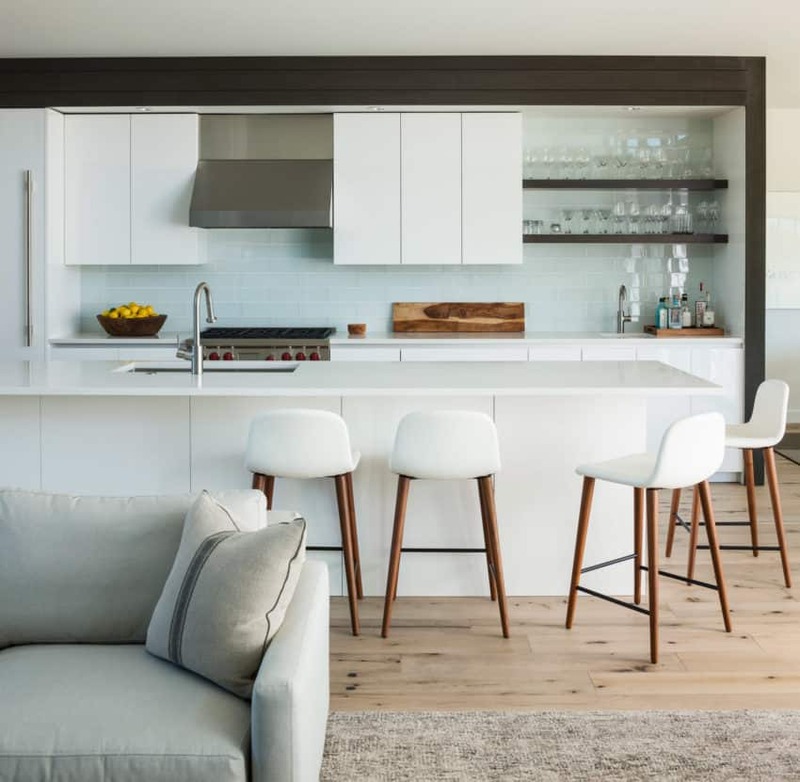 The kitchen and living room are open and spacious, done in a stark white that enhances this sense of space, with accents done in neutral tones that play with contrast. 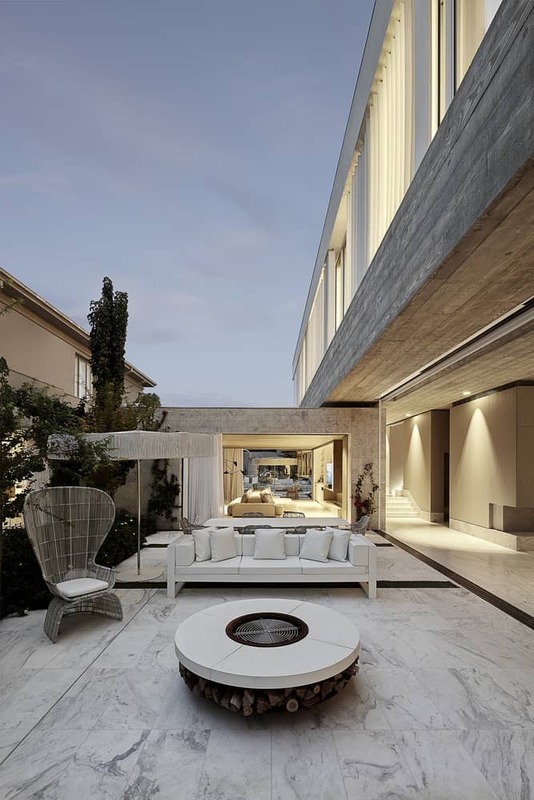 These rooms open out to a terrace with a pool, and, beyond, the view of the city, creating a continuity and a dialogue between the interior and the exterior that is irresistible and exquisite. 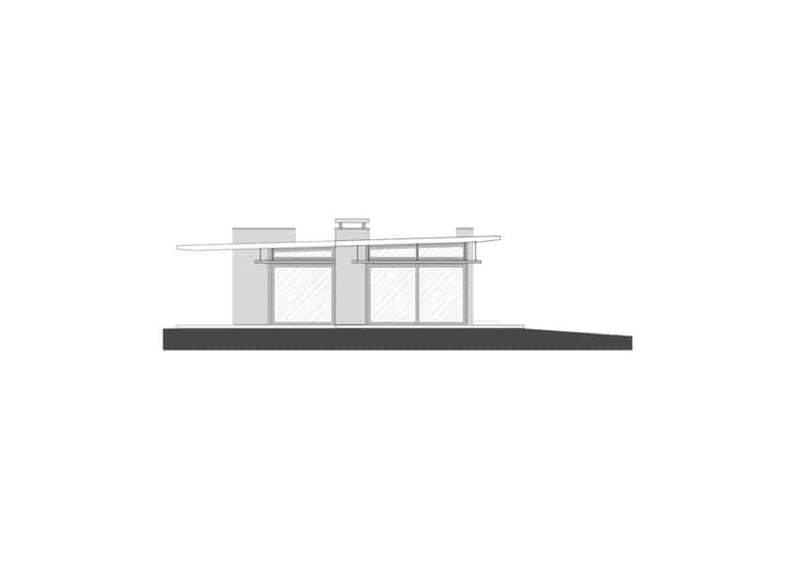 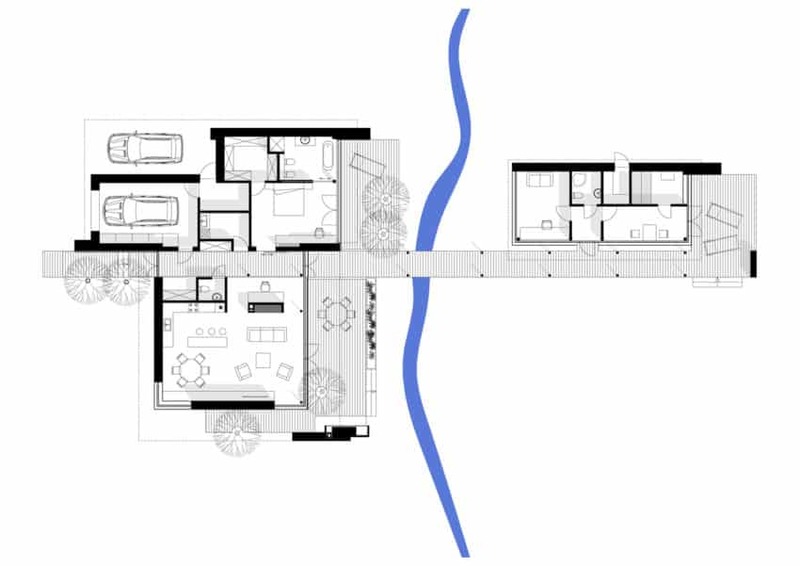 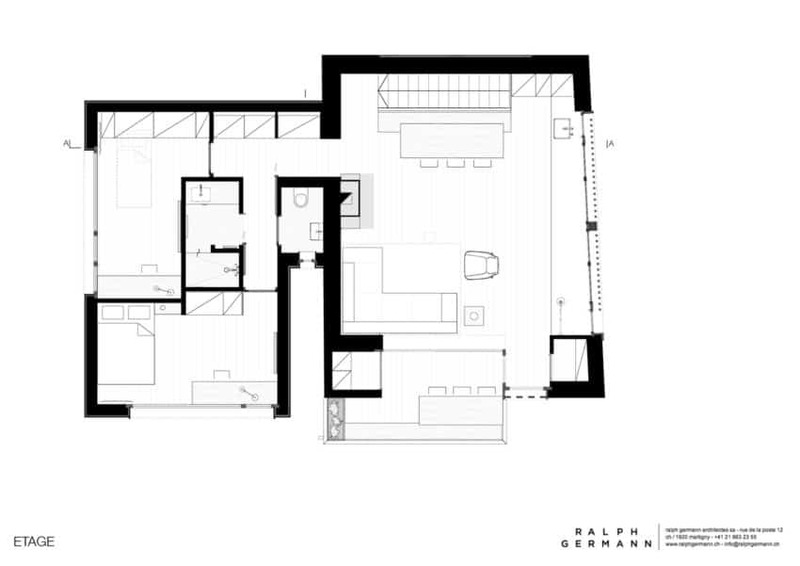 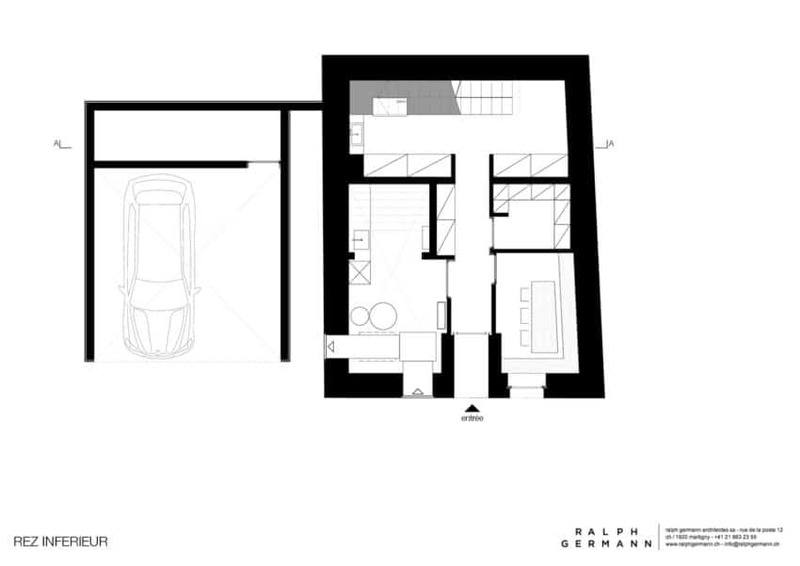 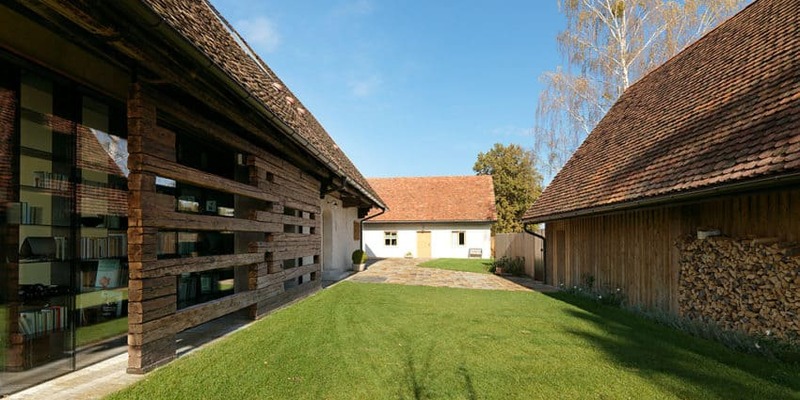 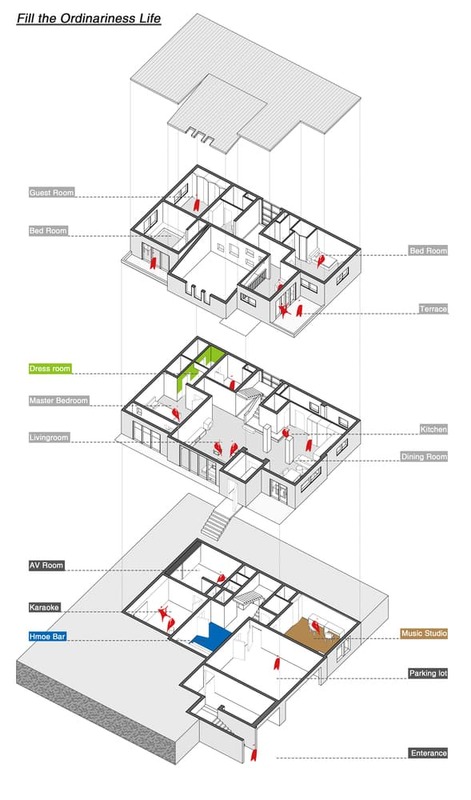 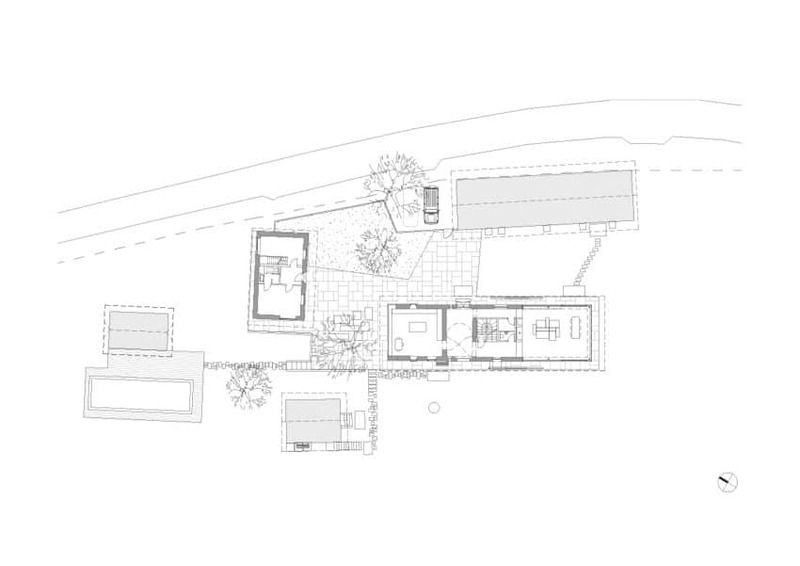 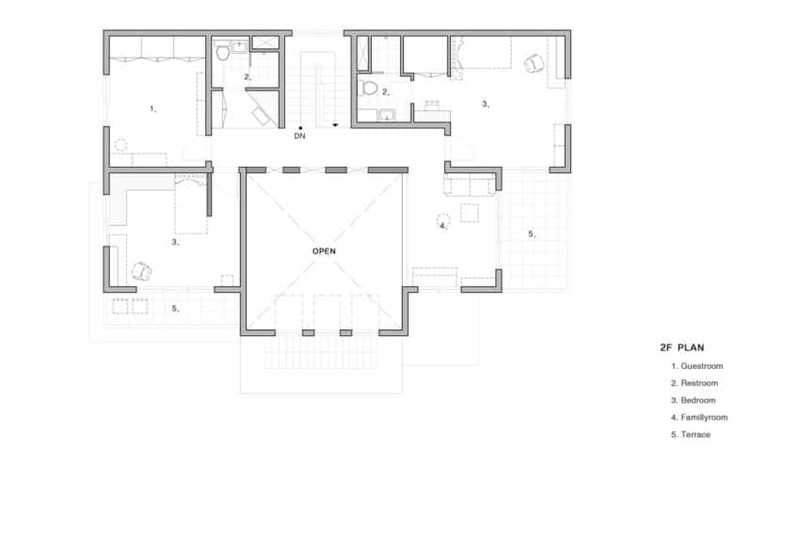 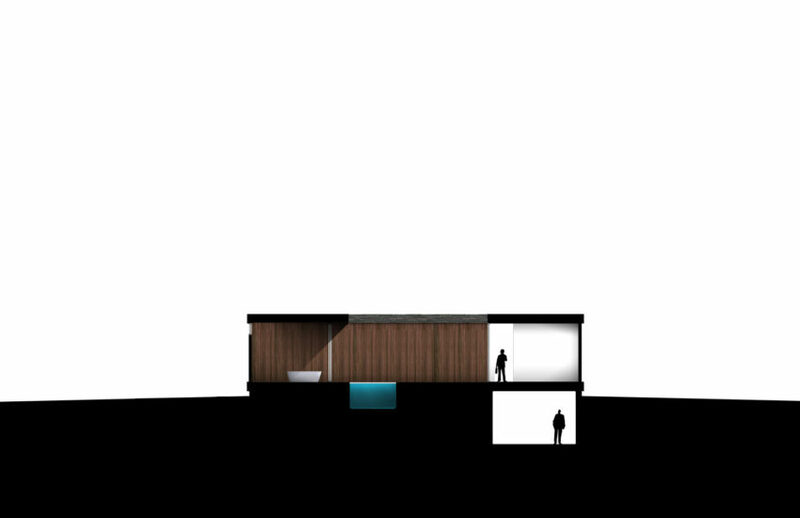 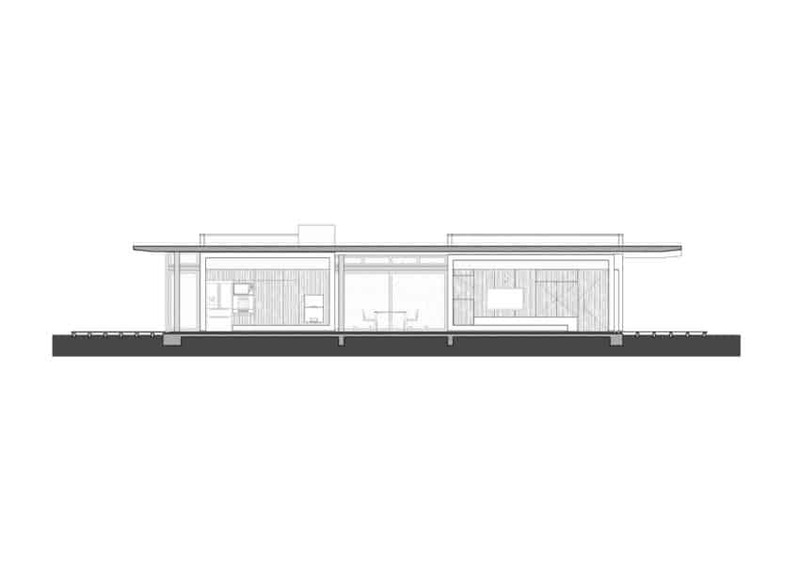 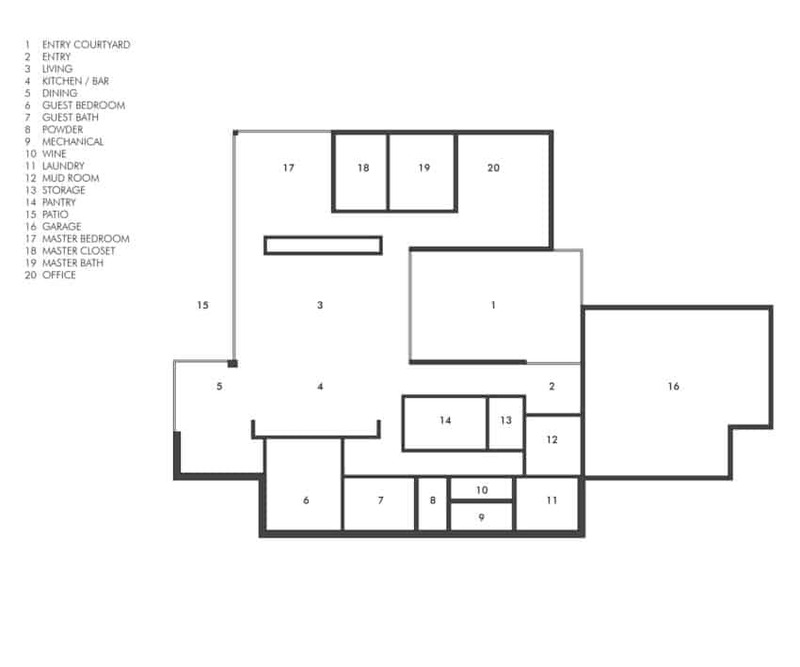 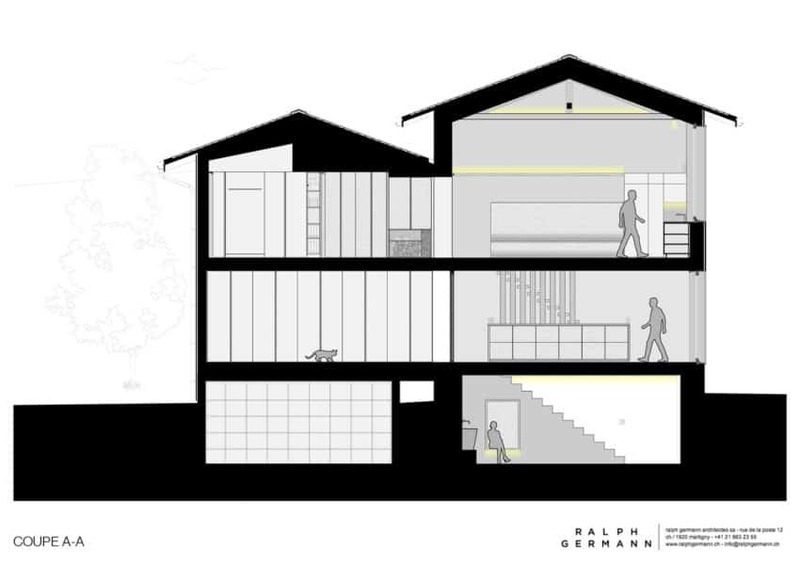 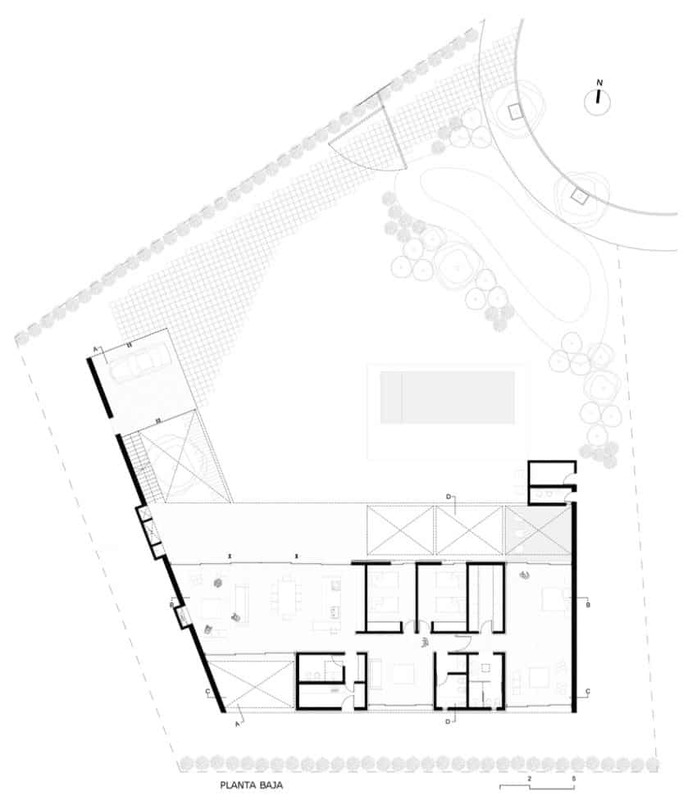 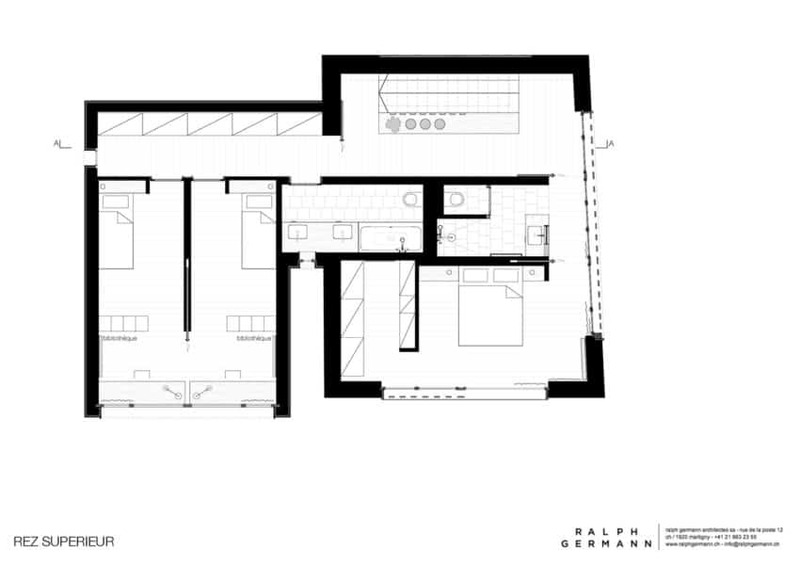 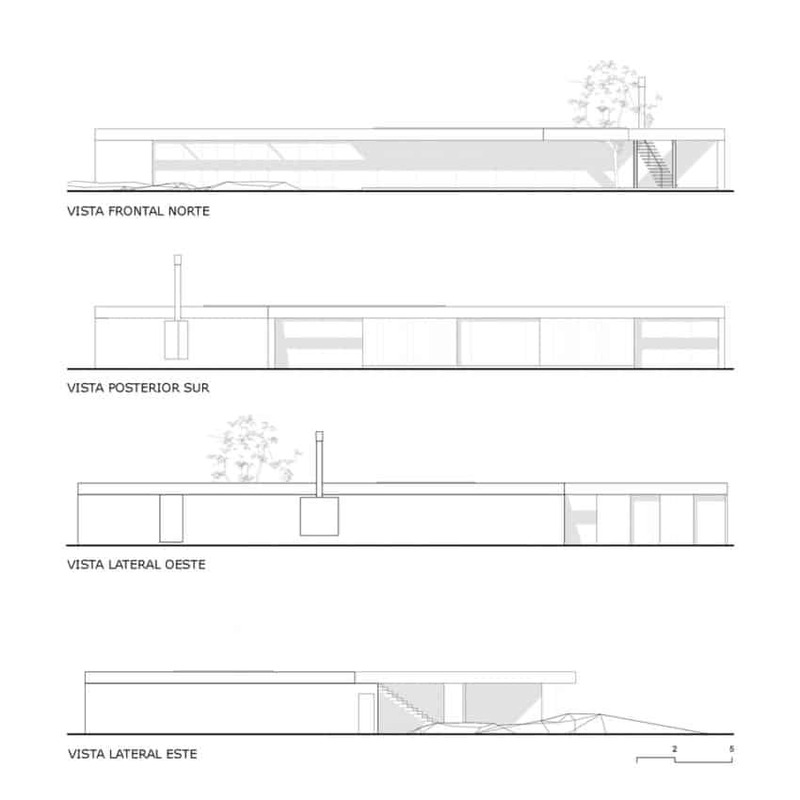 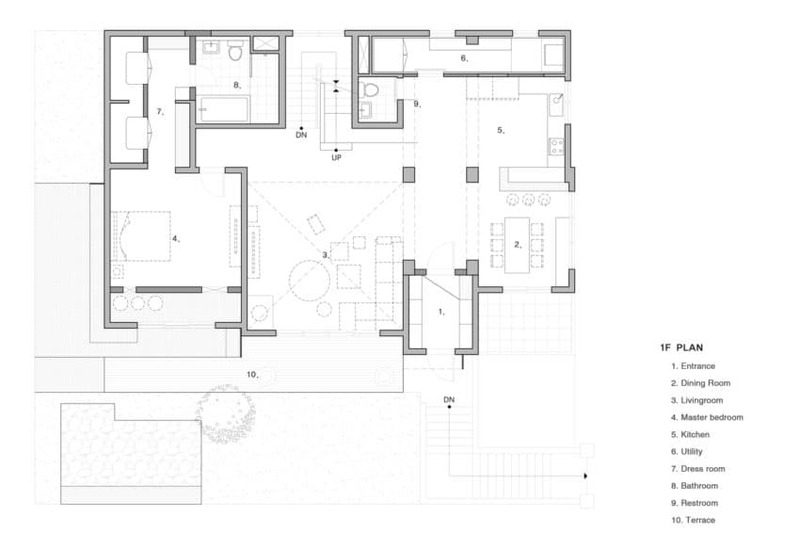 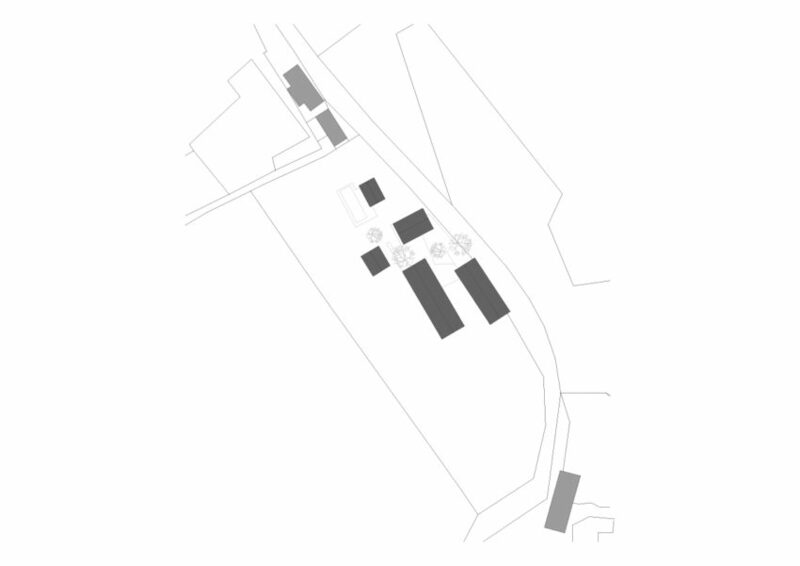 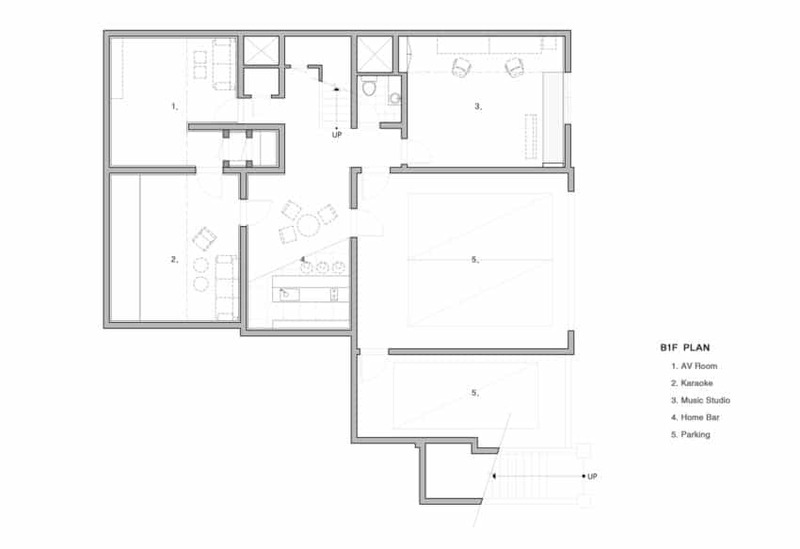 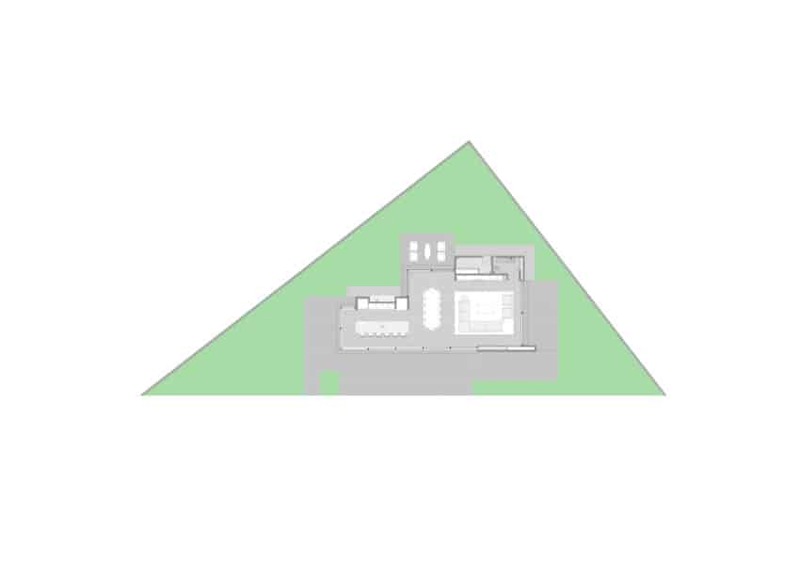 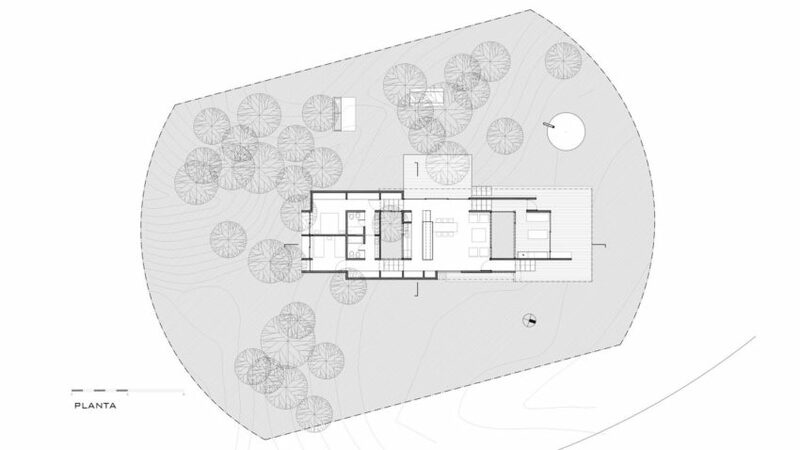 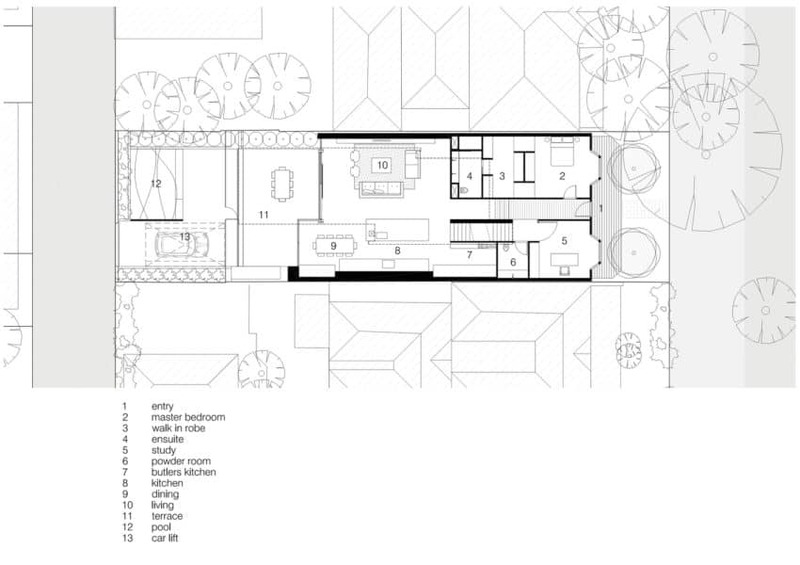 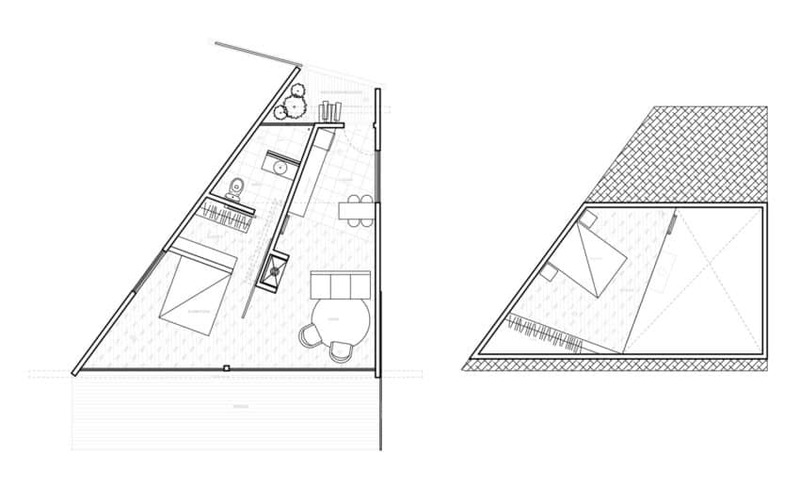 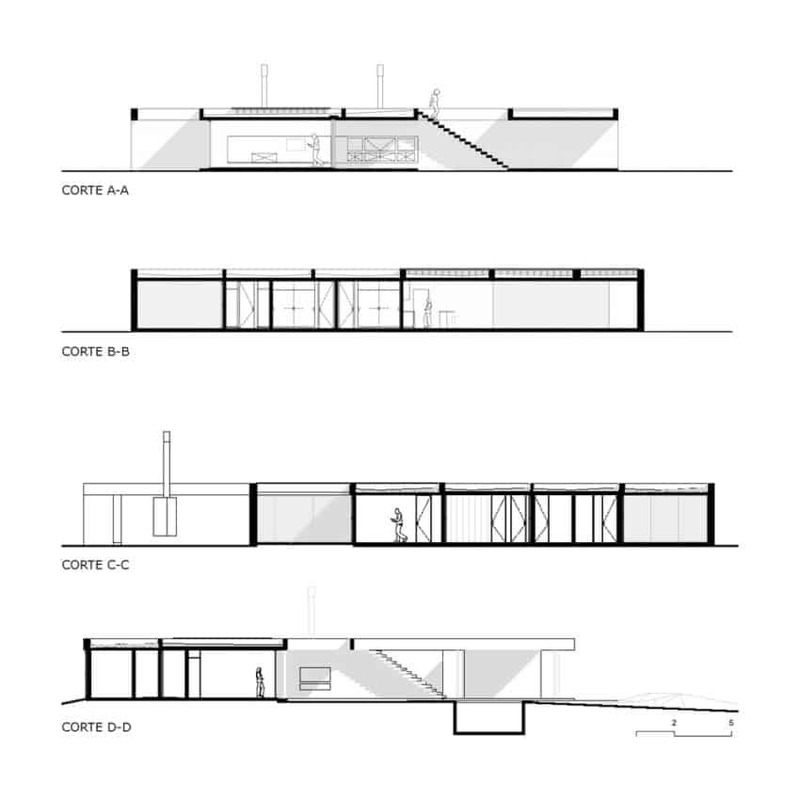 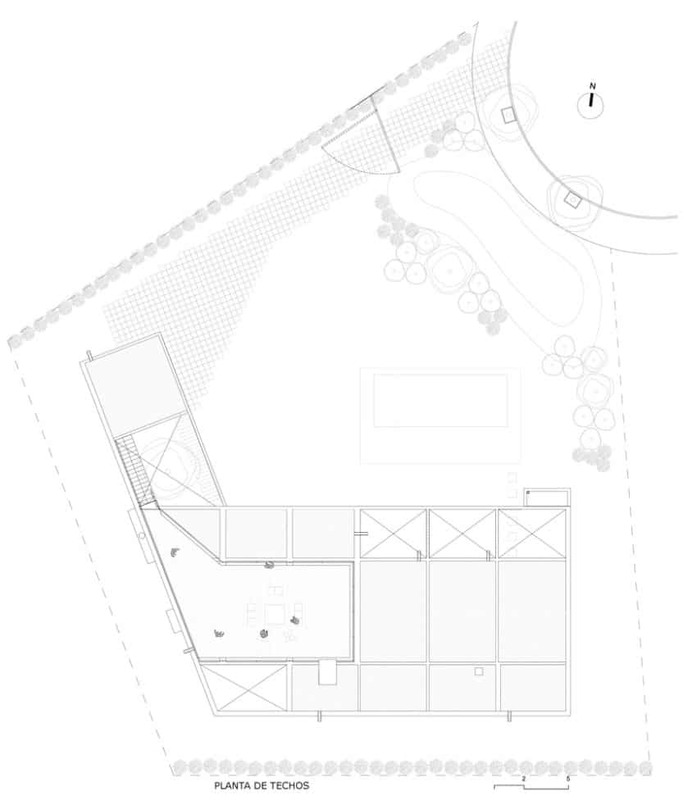 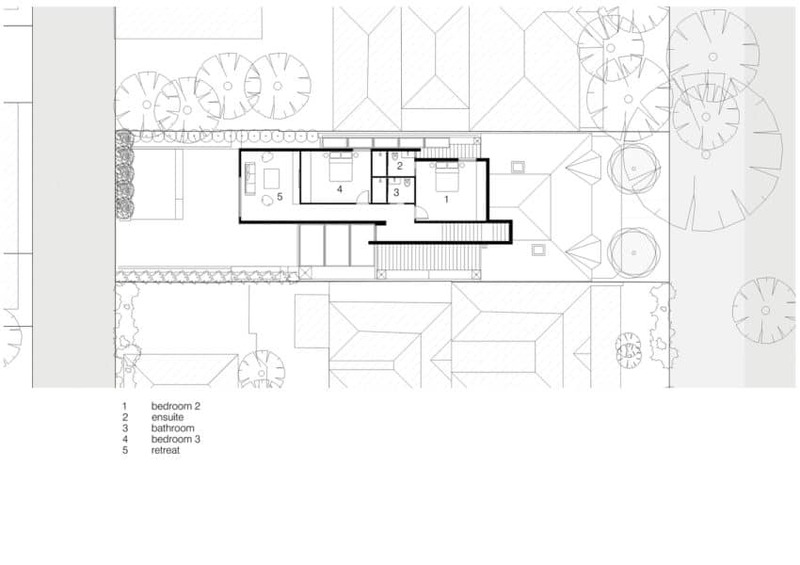 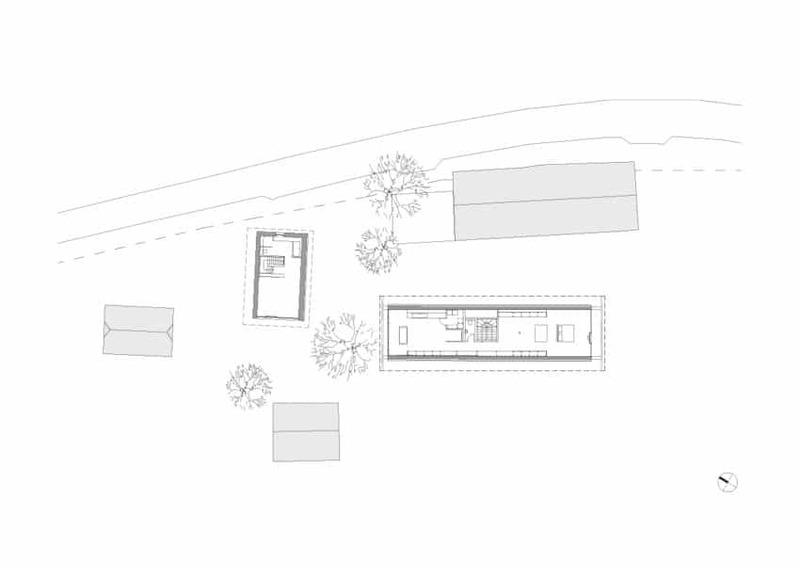 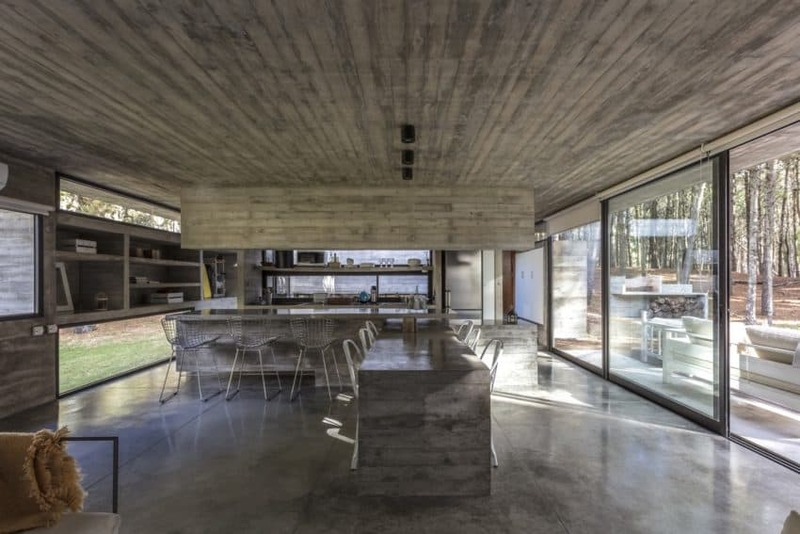 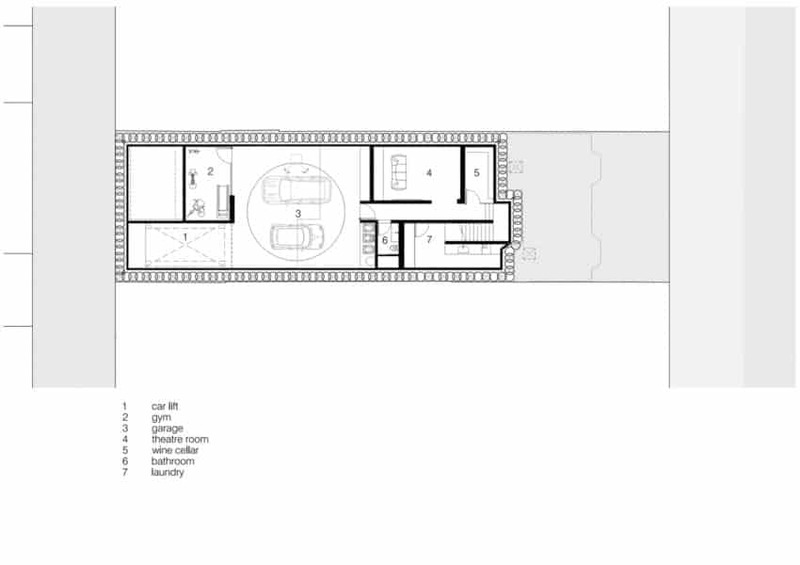 The entirety of the floor plan is developed around five volumes which enclose the private spaces of the house. 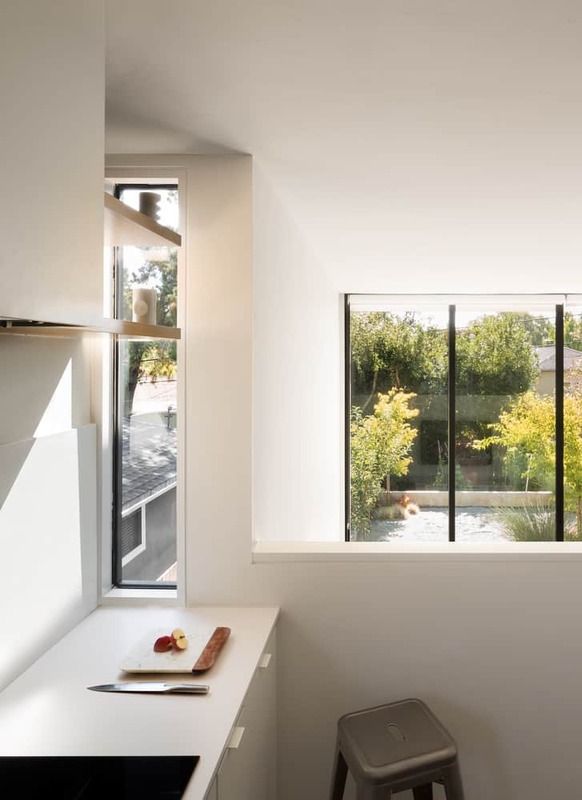 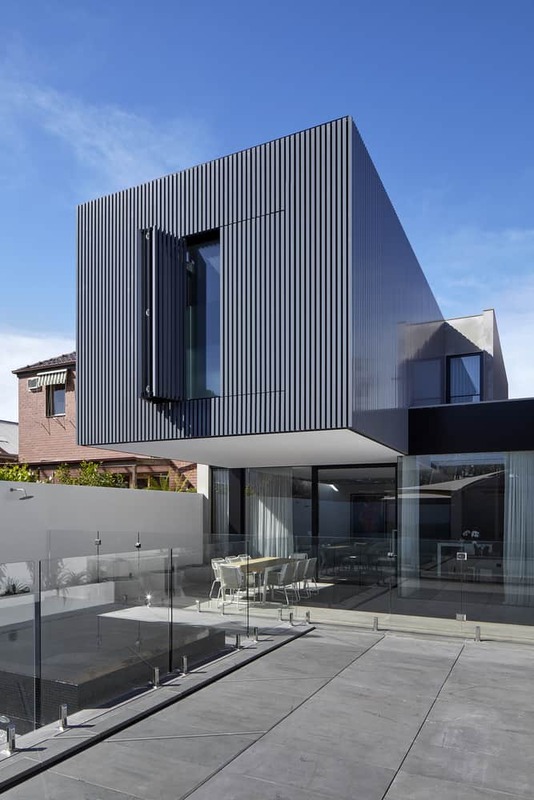 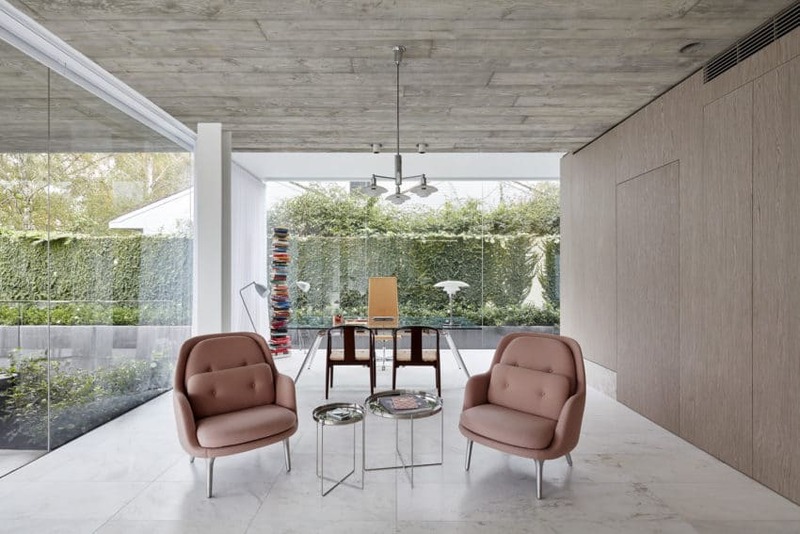 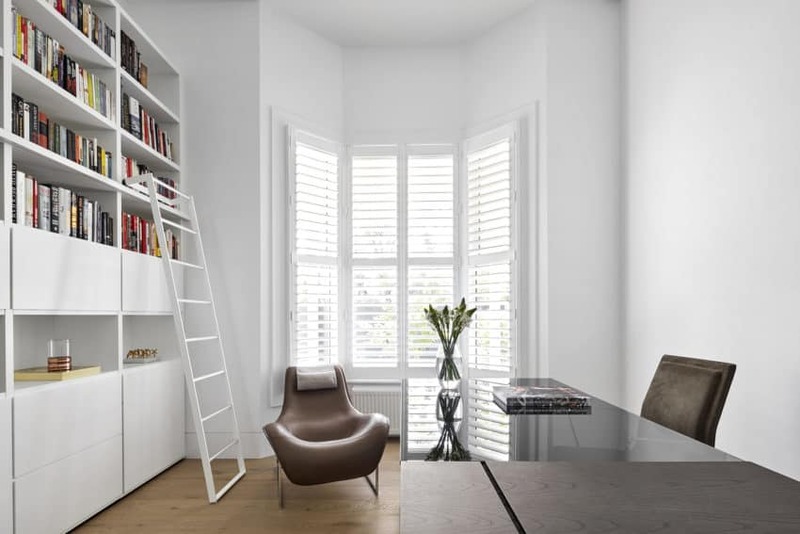 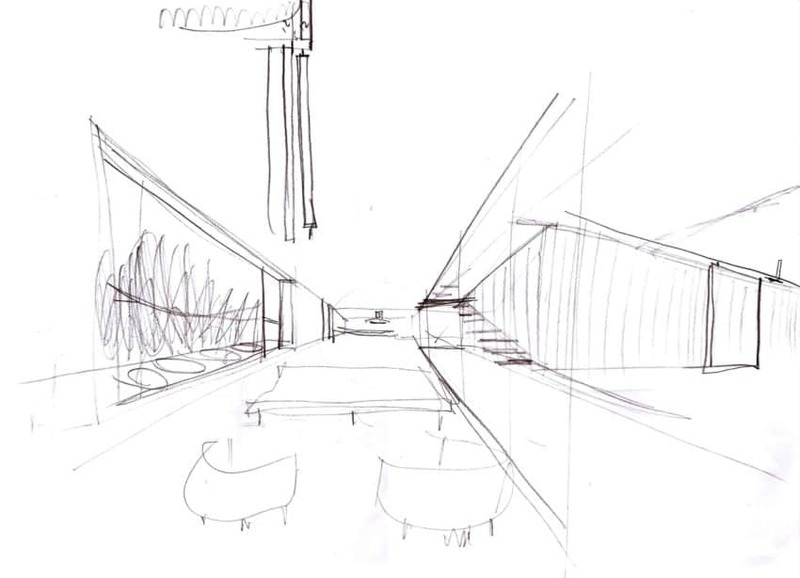 Such an arrangement creates negative space, which in turn becomes the main living and circulating space, providing a free flowing travel route throughout the home, as well as views out to the exterior and the city. 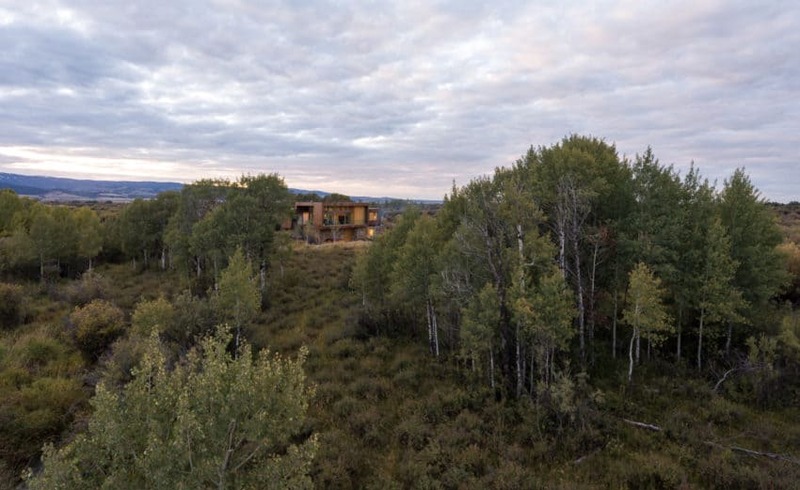 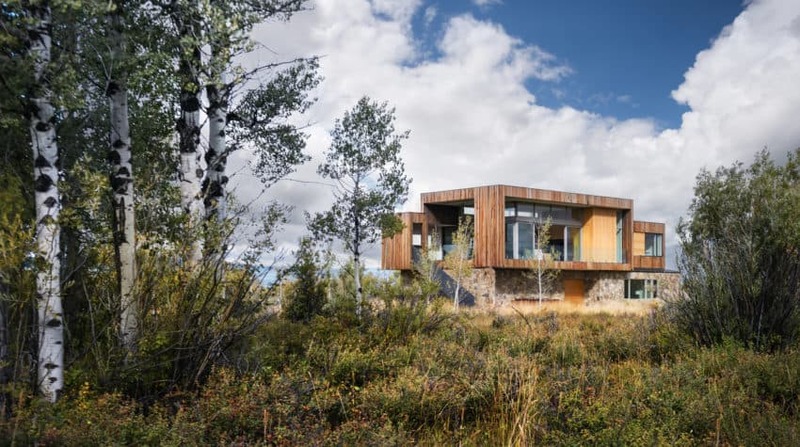 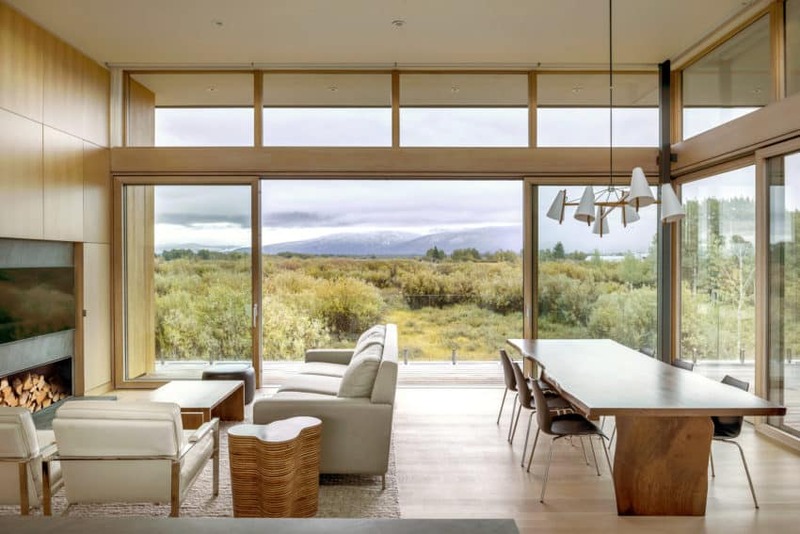 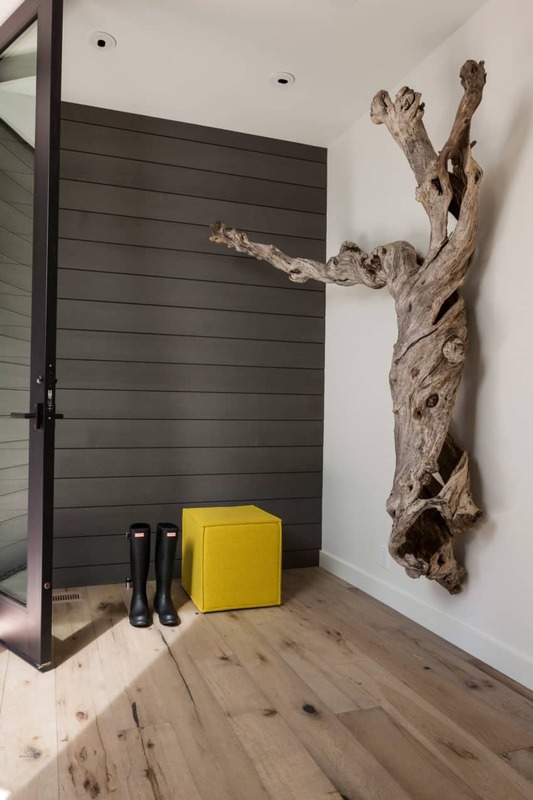 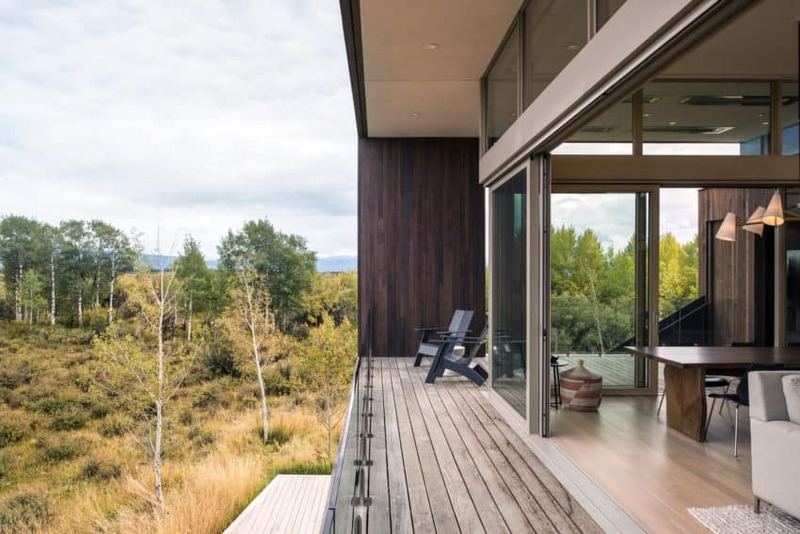 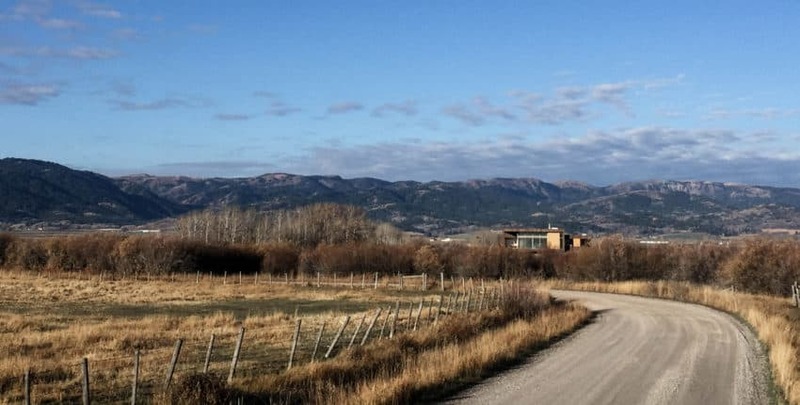 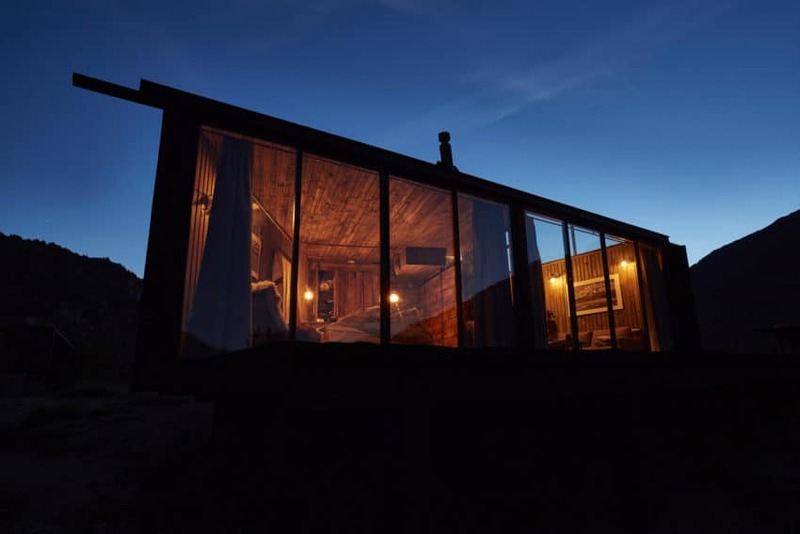 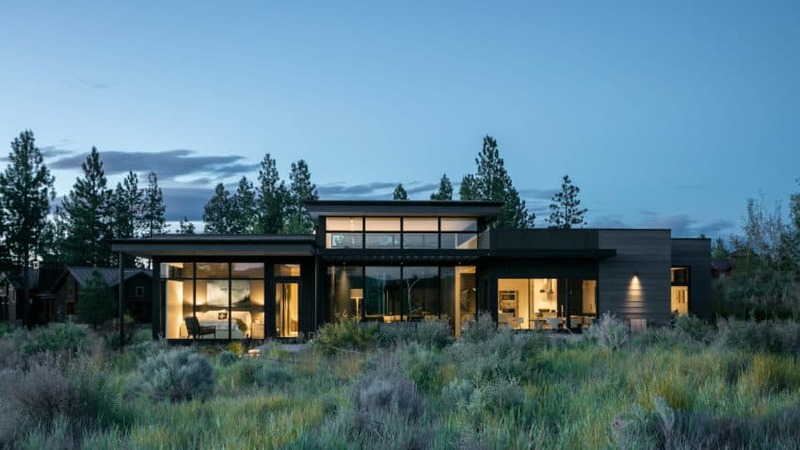 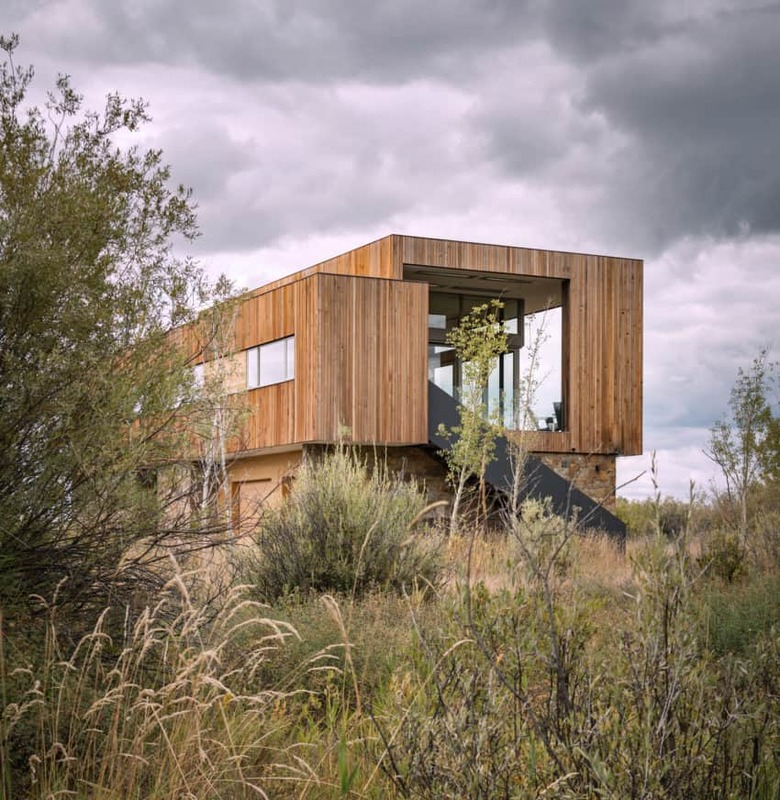 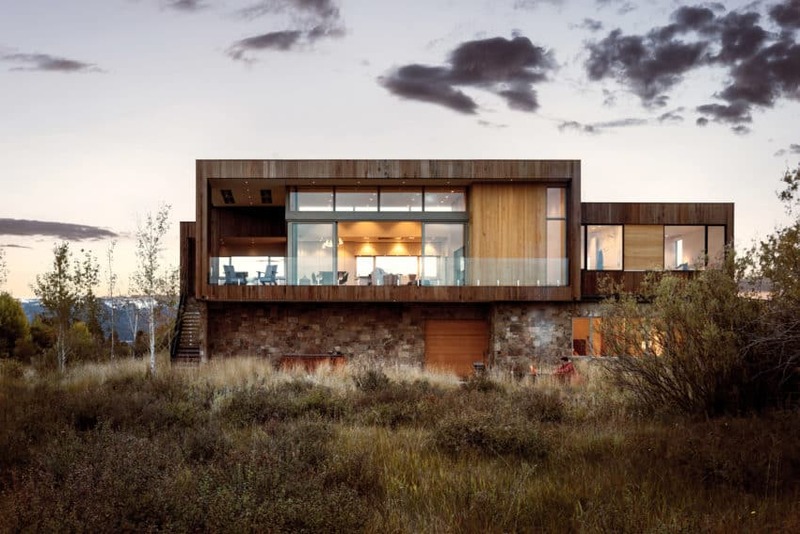 Surrounded by vast lands of dense and arid vegetation, in a remote area of Driggs, in the Teton Valley, in the desert of Idaho, is this construction designed by the American design firm, Ro Rockett Design. 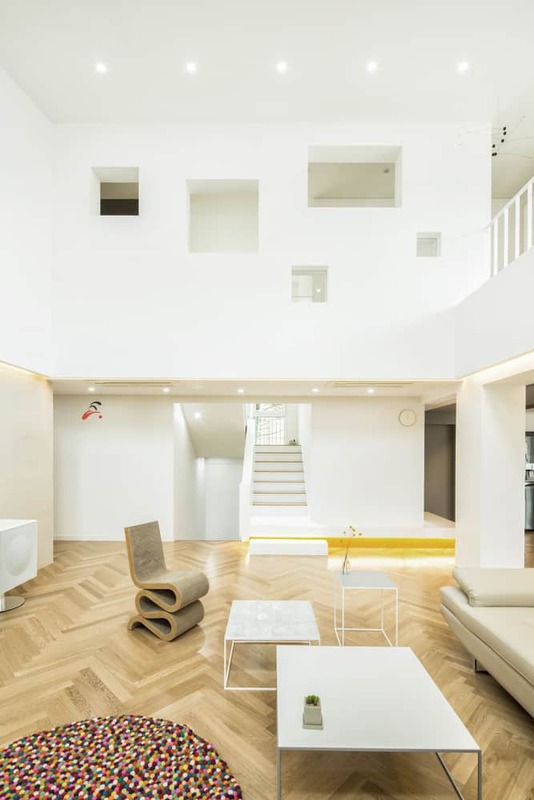 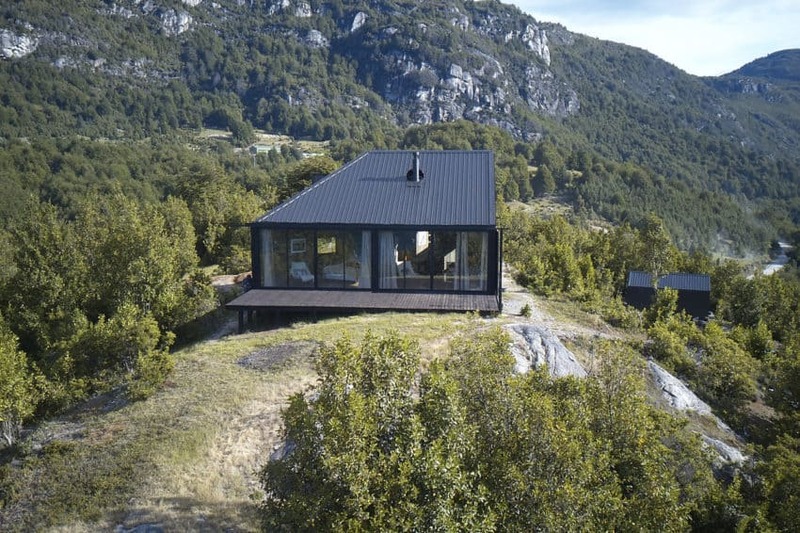 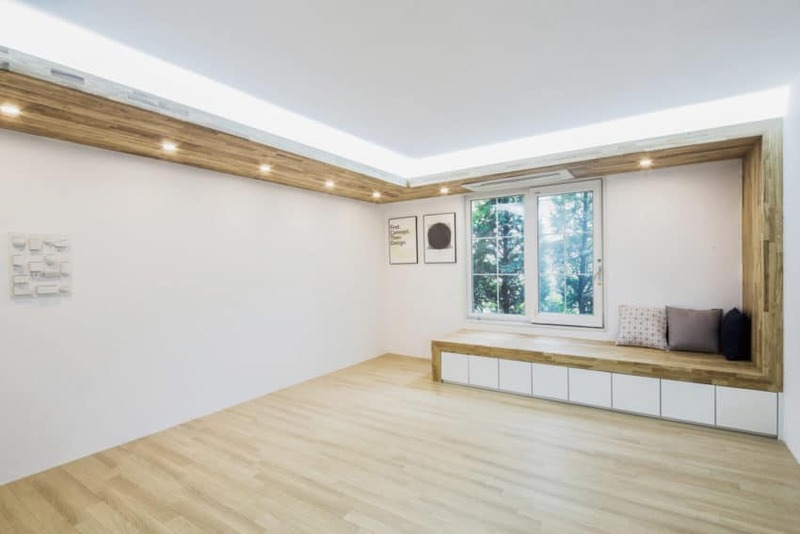 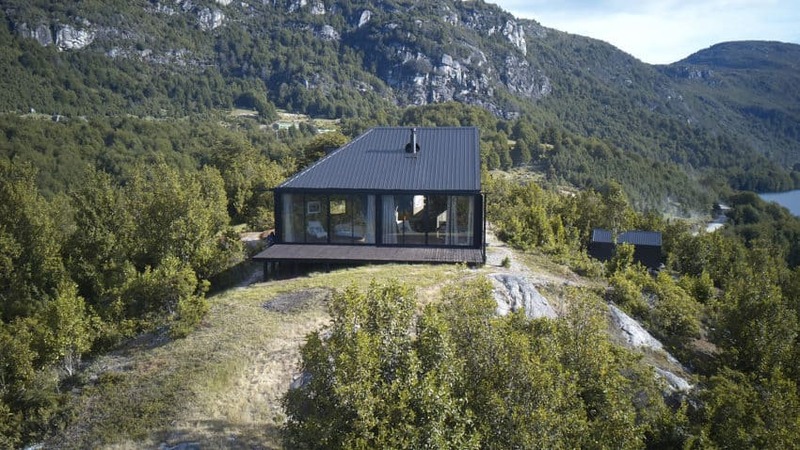 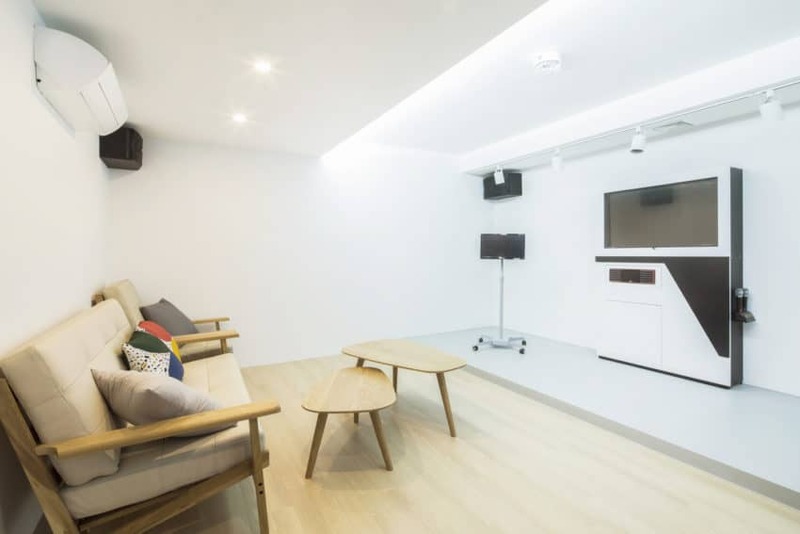 This 3,300-square-foot home (about 307 square meters) is a family retreat. 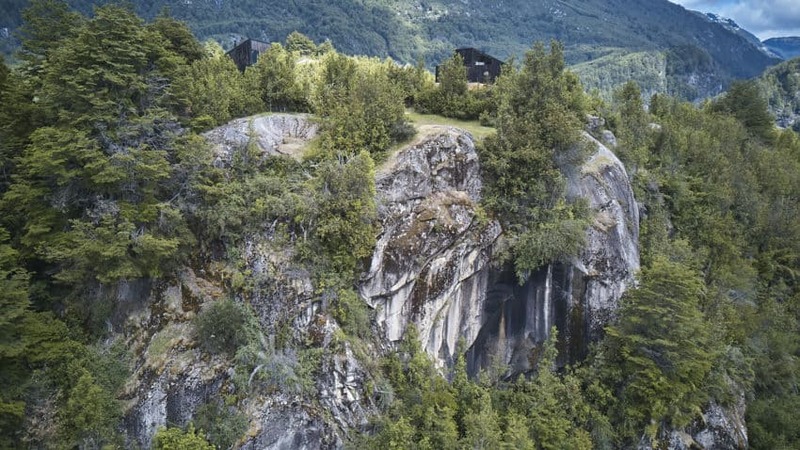 It is located on top of a rock to enjoy the spectacular views of the surrounding landscape and at the same time avoid possible flooding. 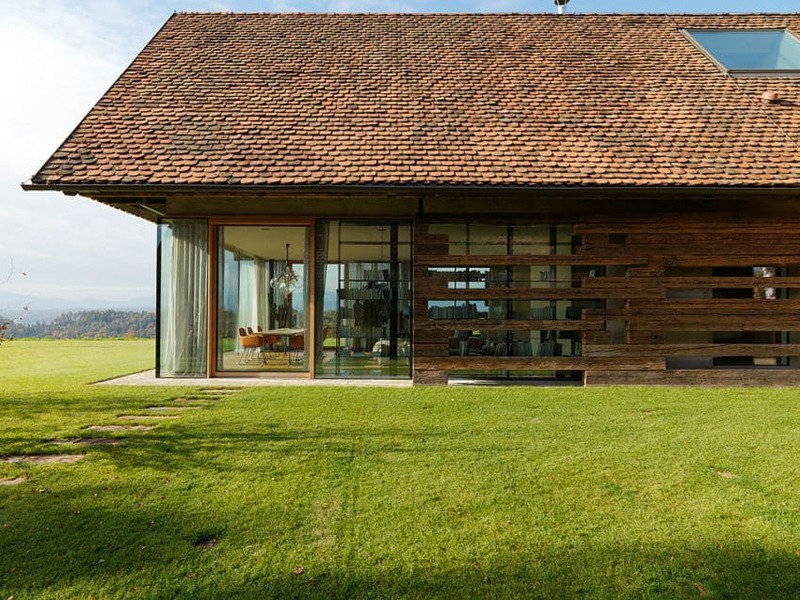 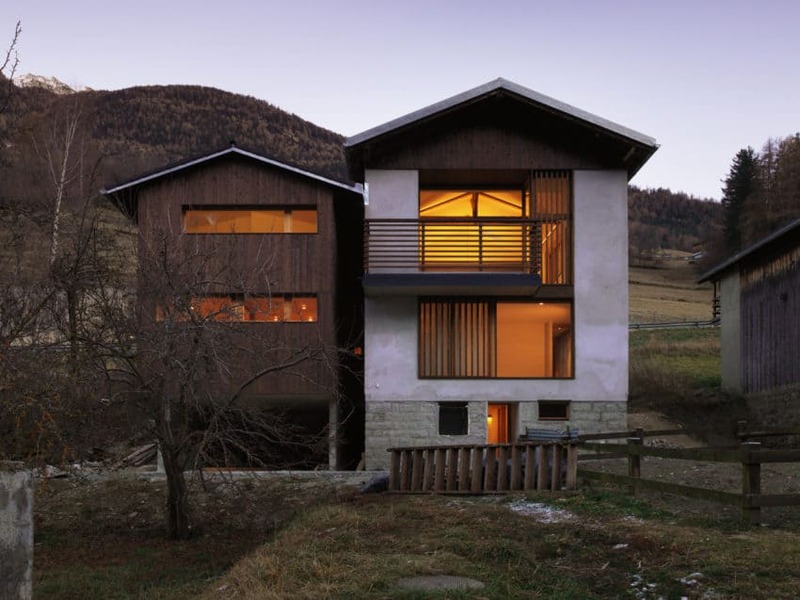 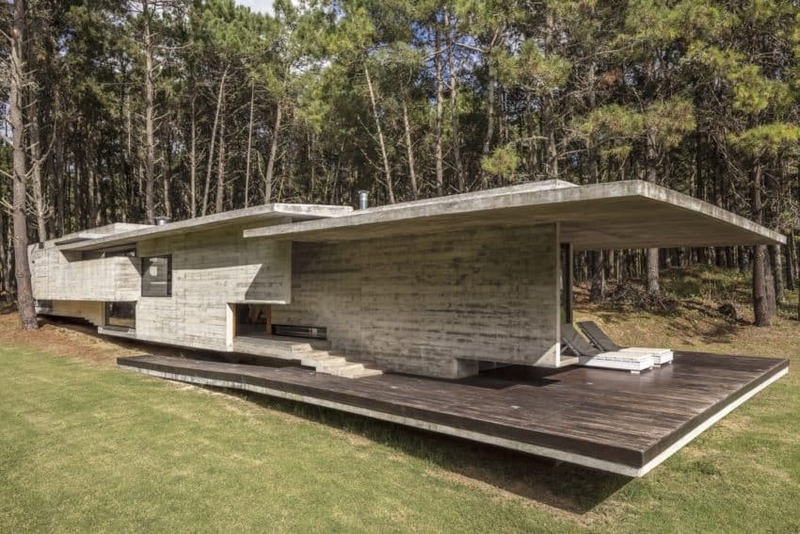 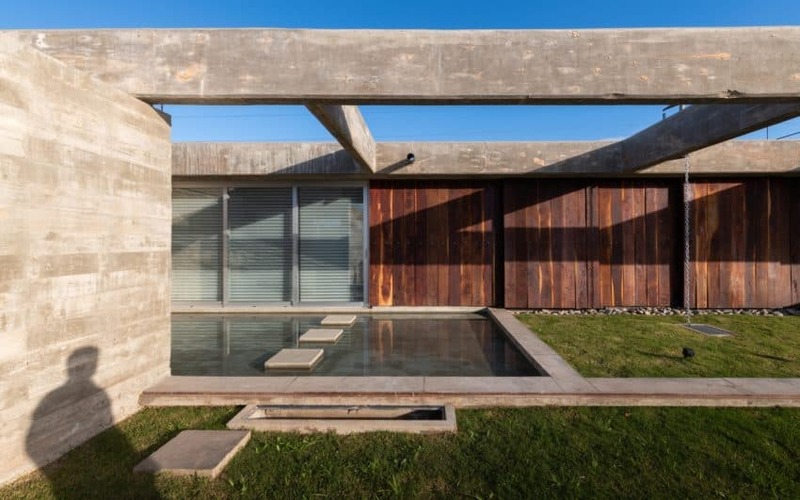 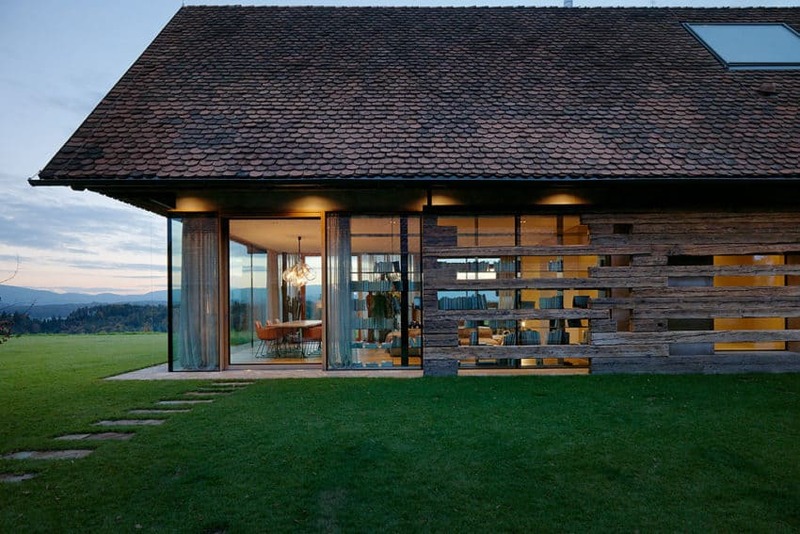 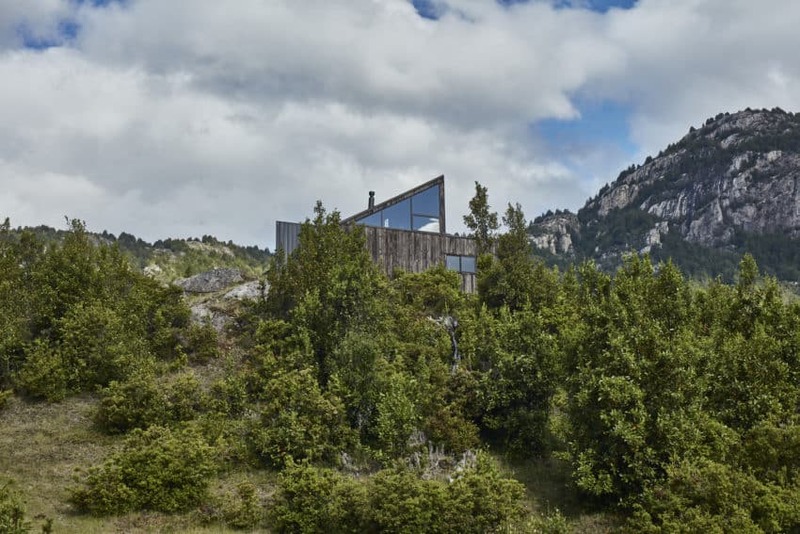 The concentration of the house consists of two volumes stacked one on top of the other: a stone base and an upper level clad in wood. 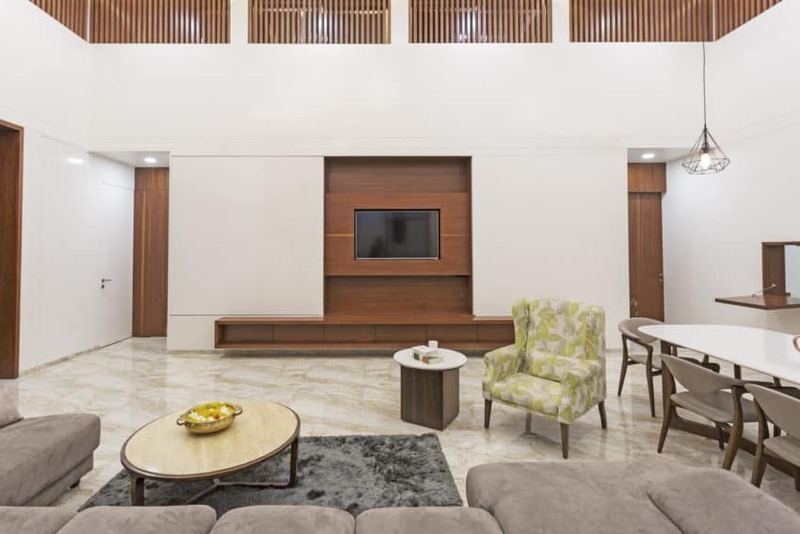 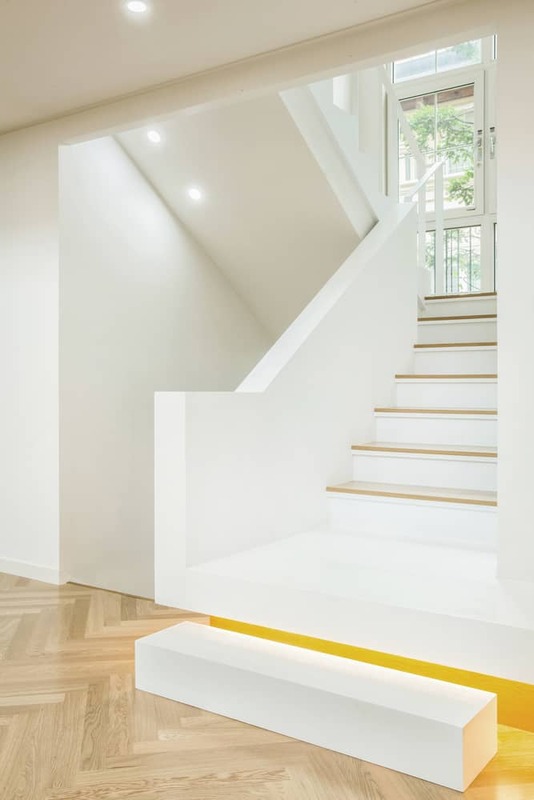 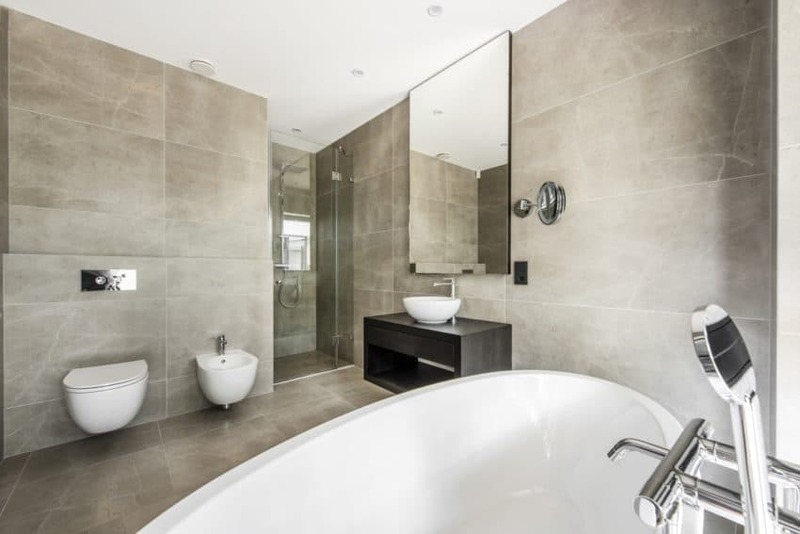 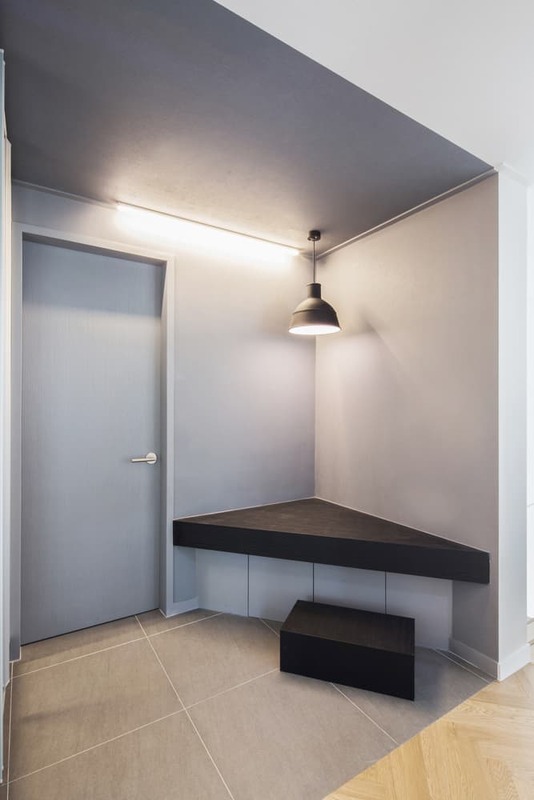 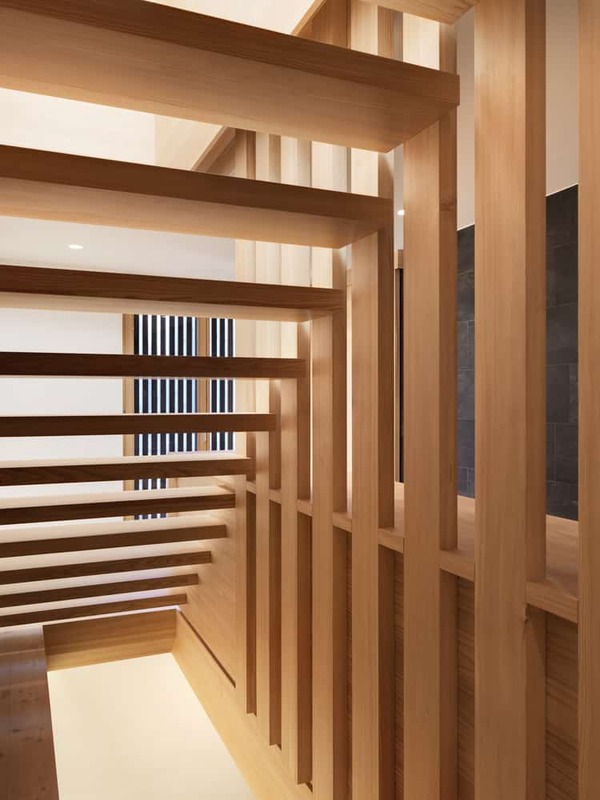 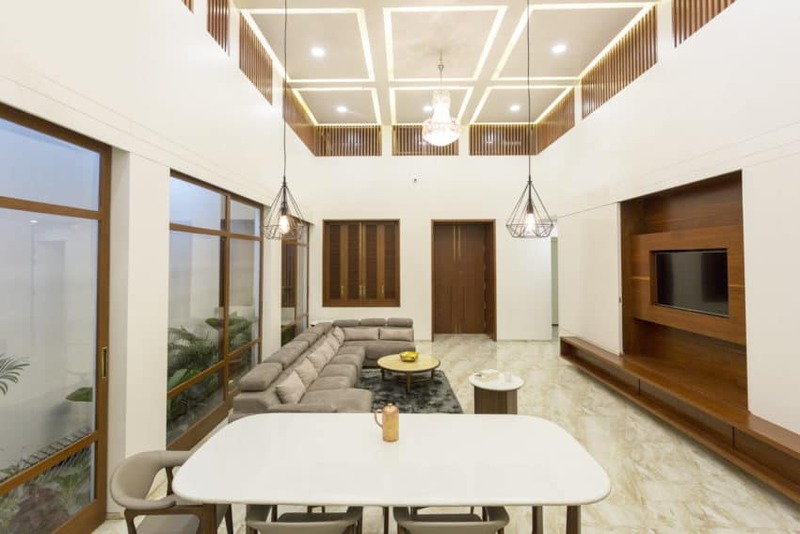 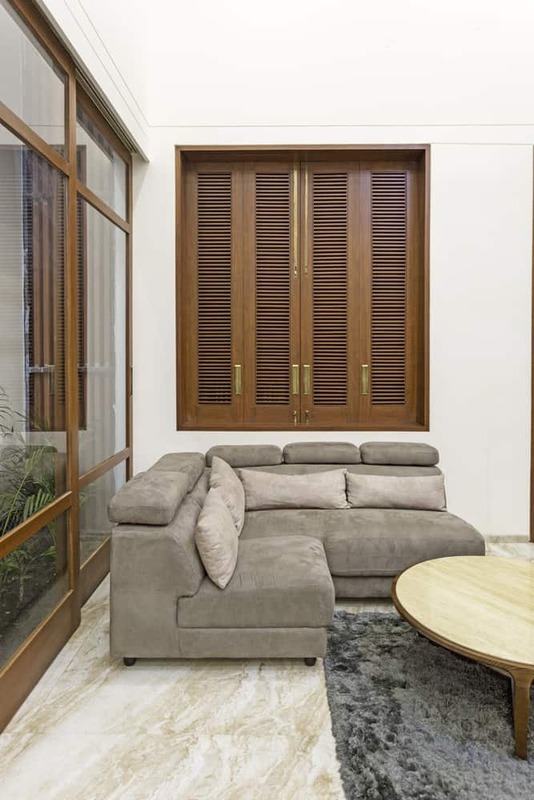 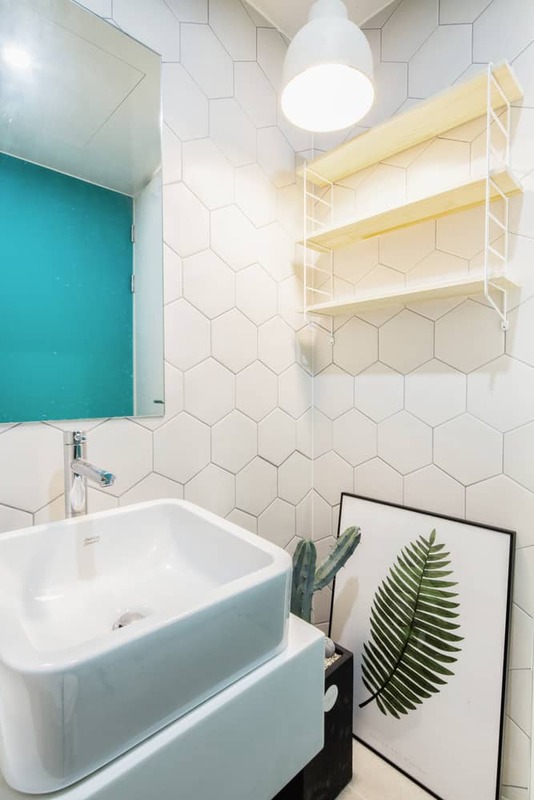 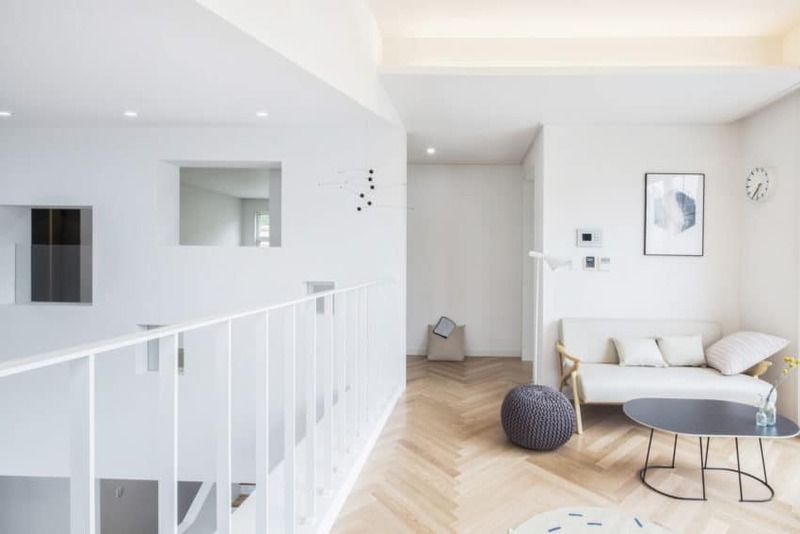 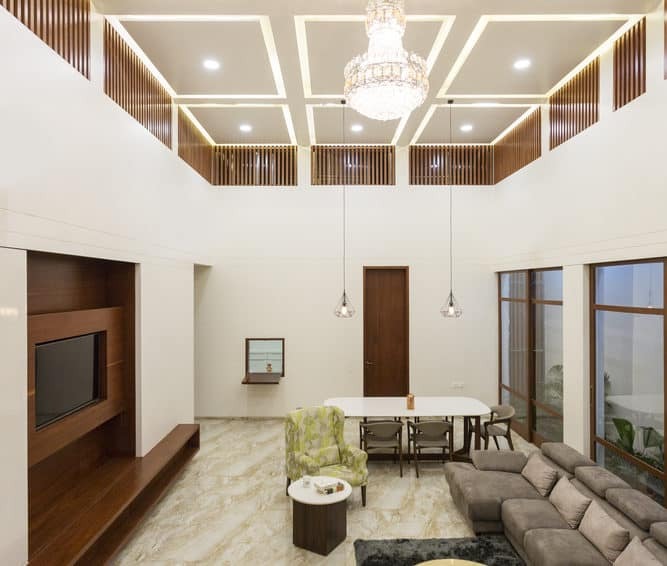 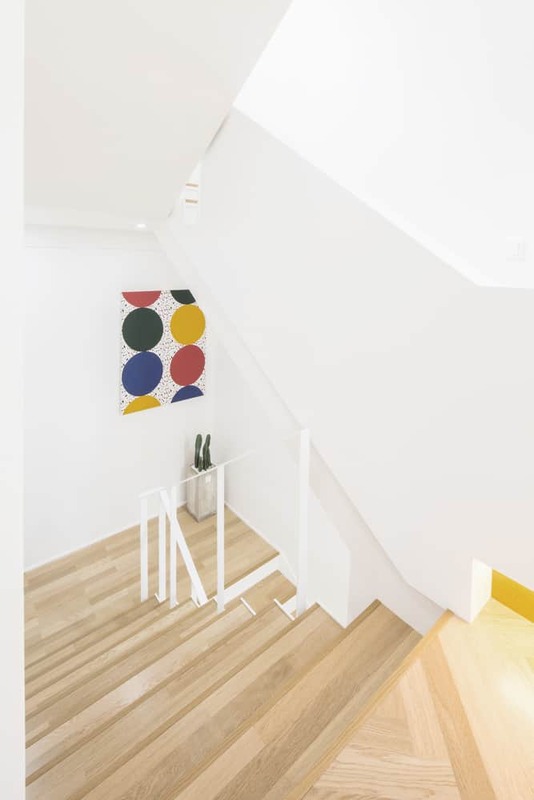 The entrance leads to the main staircase, which leads directly to the top floor, while the ground floor contains a two-car garage, two bedrooms, a bathroom and plenty of storage space. 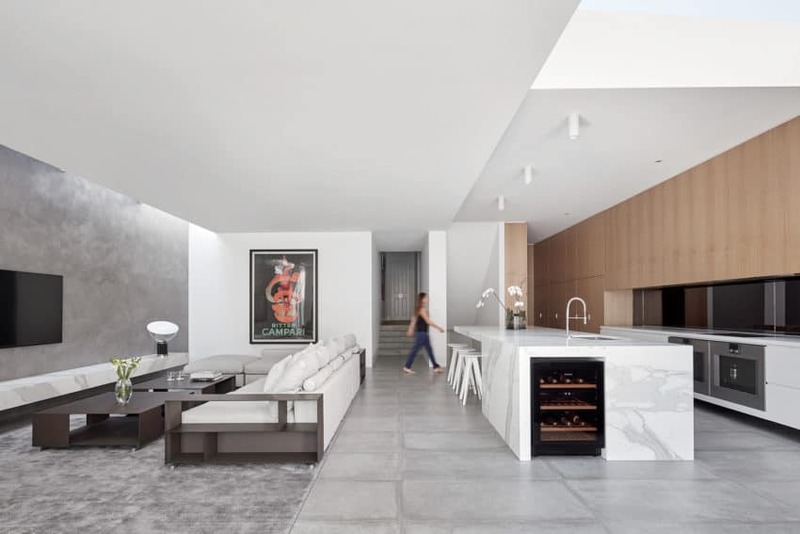 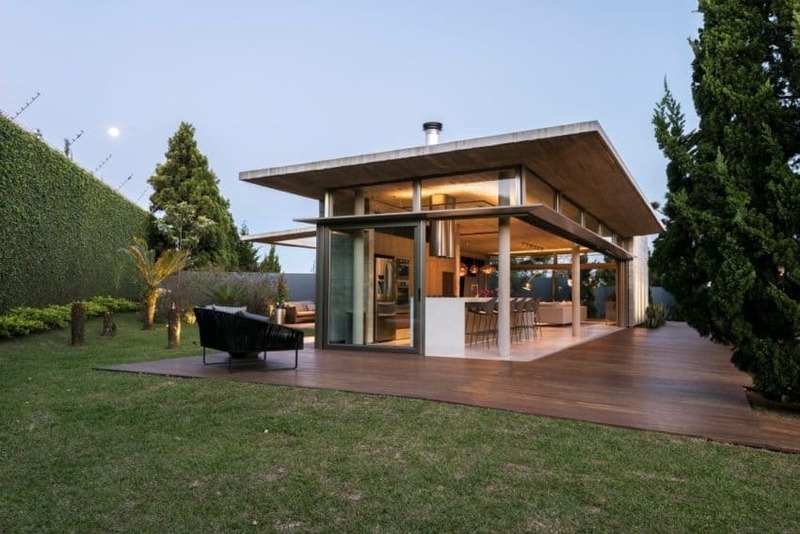 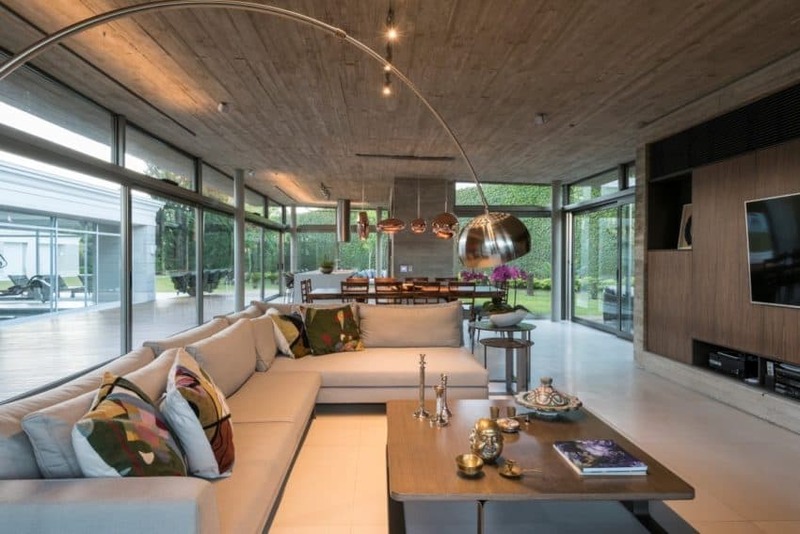 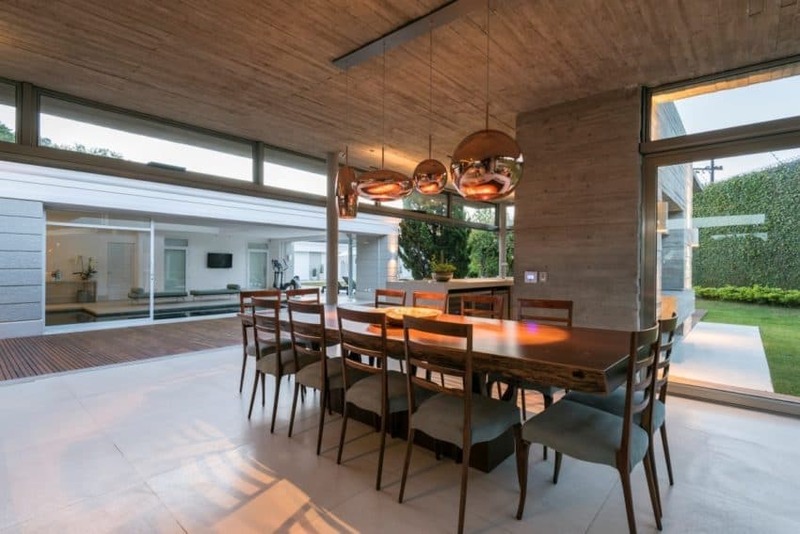 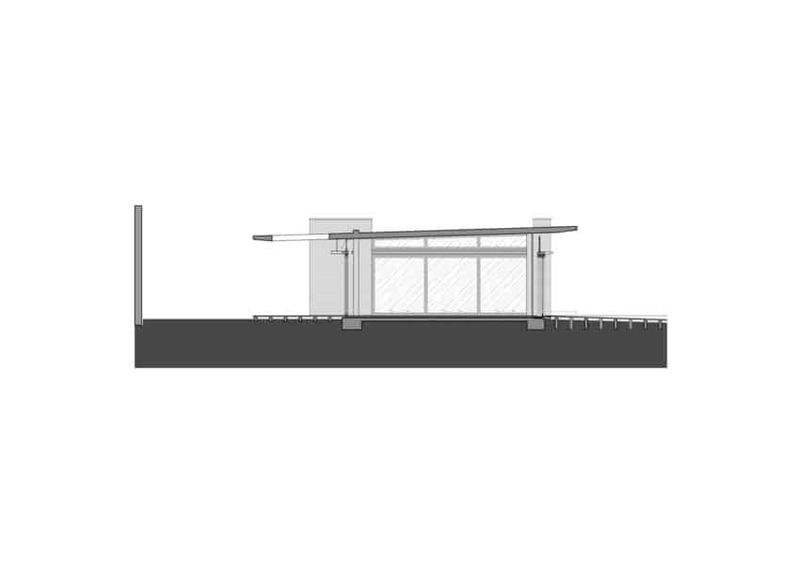 On the upper level, the southern half is occupied by an open concept kitchen, living and dining room that is glazed on two sides and opens onto a covered terrace. 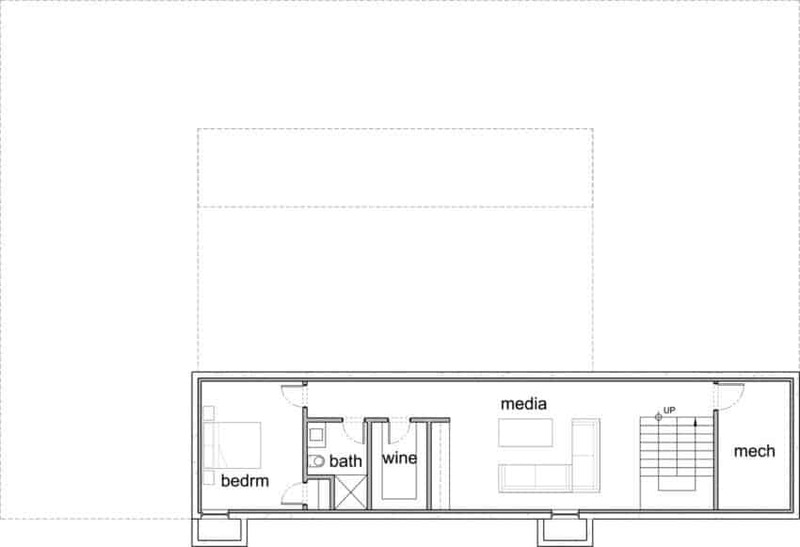 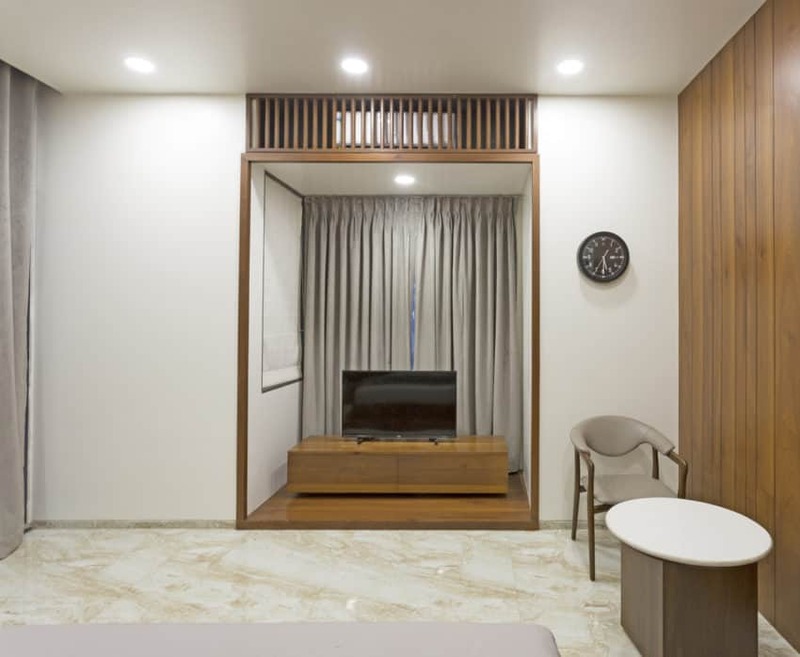 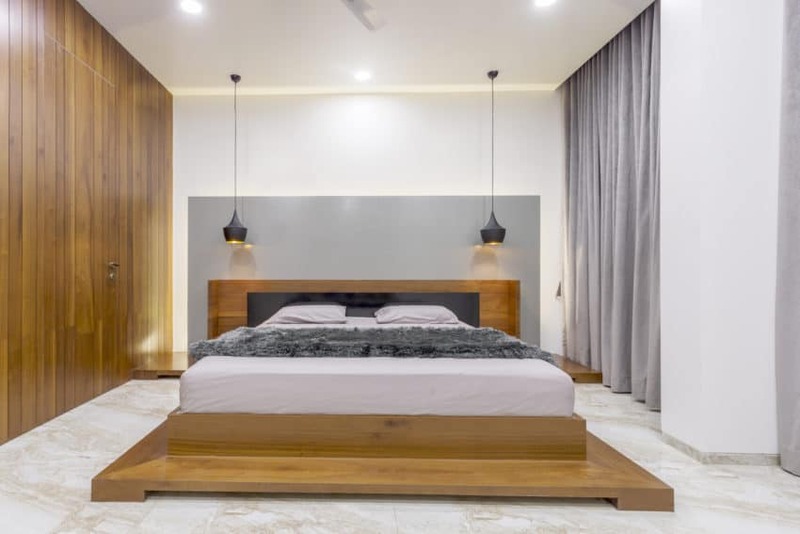 The master bedroom occupies the other half and includes an office in the home, a dressing room and a private bathroom.